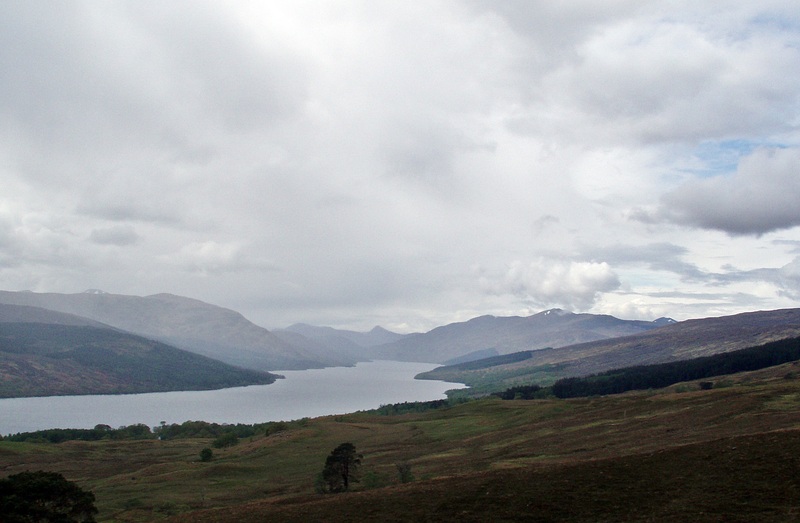 Total: 314.7 km and 9583 m ascent, with three Munros and two Munro Tops. 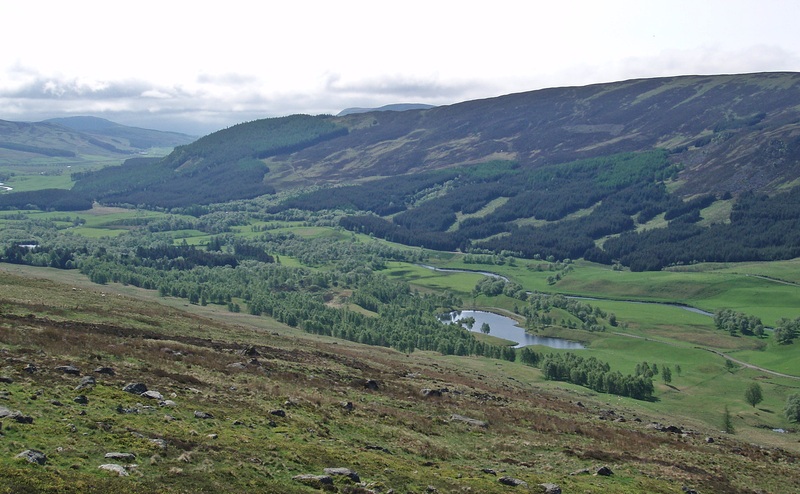 This year’s TGO Challenge had started the previous day with a leisurely walk from my house to the bus station in Inverness to catch the 17:15 Citylink bus to Shiel Bridge. 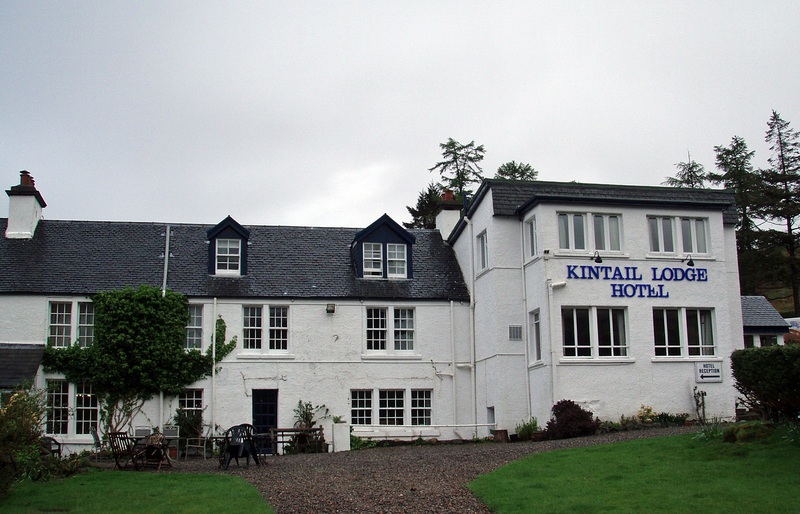 I had asked the bus driver if he could drop me off at the Kintail Lodge Hotel, and when we arrived there, fellow Challengers Humphrey and Fred got off the bus as well. 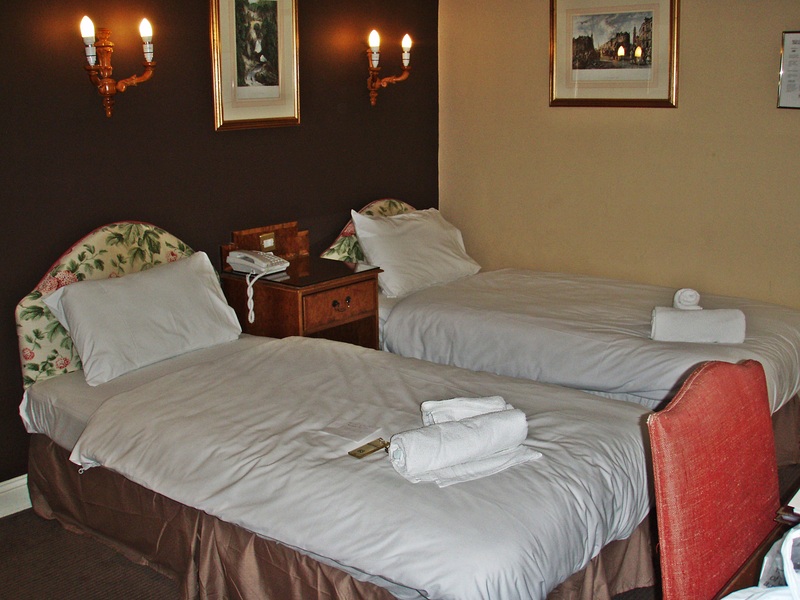 We had all booked rooms at the Trekkers Lodge, and after checking in we met again in the bar where a large group of Challengers had gathered already, including Laura and Louise. There were no seats left at their table, so I sat with Humphrey and Fred at the table next to them and had an enjoyable evening with interesting conversation, good food and a few pints of cider. Unusual for me, I didn’t sleep well at all, it was too warm in my room and I felt restless all night. I got up at 06:15, had breakfast (no sign of life from my room neighbours yet), went around to the hotel reception to sign out and made a short detour to the loch. Dipping my feet in the loch. 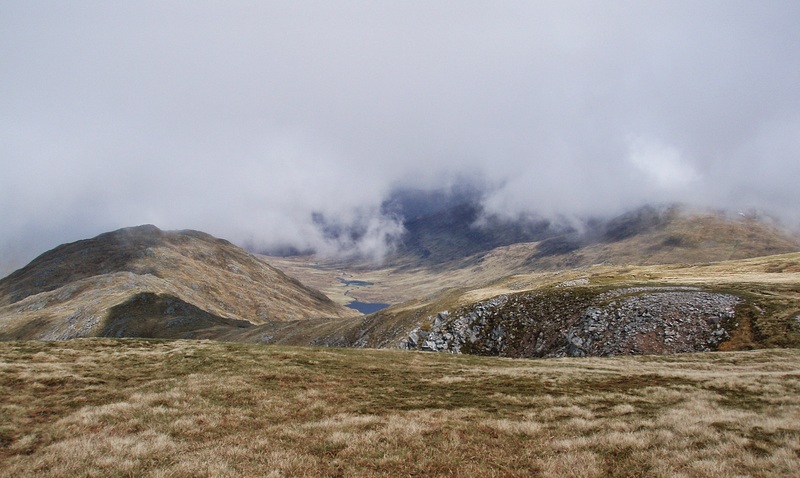 When I returned to the Trekkers Lodge to collect my rucksack, my fellow Challengers were up and about, so I said my goodbyes and left shortly before 09:00. 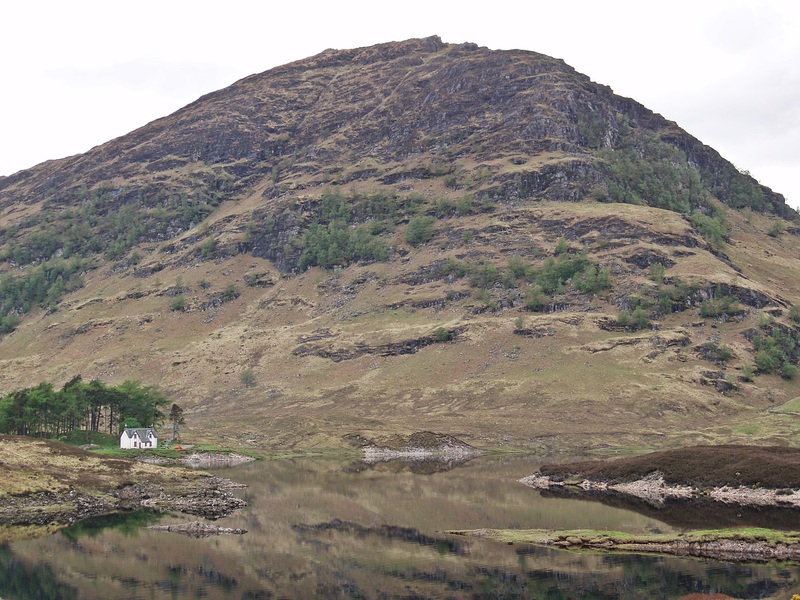 Everyone else would be walking along Gleann Lichd (apart from Humphrey who was heading towards Glenelg…), and the previous evening I had been considering to do the same. 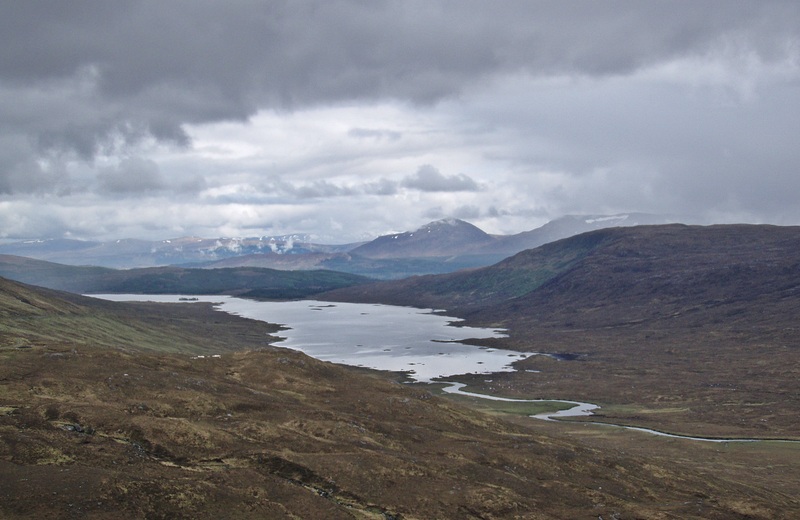 But although the clouds were low at the moment, the forecast for later in the day was good, so I decided to stick to my original plan and walk over Beinn Fhada. On the road to Morvich I met Keith and Charles who had stayed at the campsite and were on their way to the Kintail Lodge Hotel to sign out. 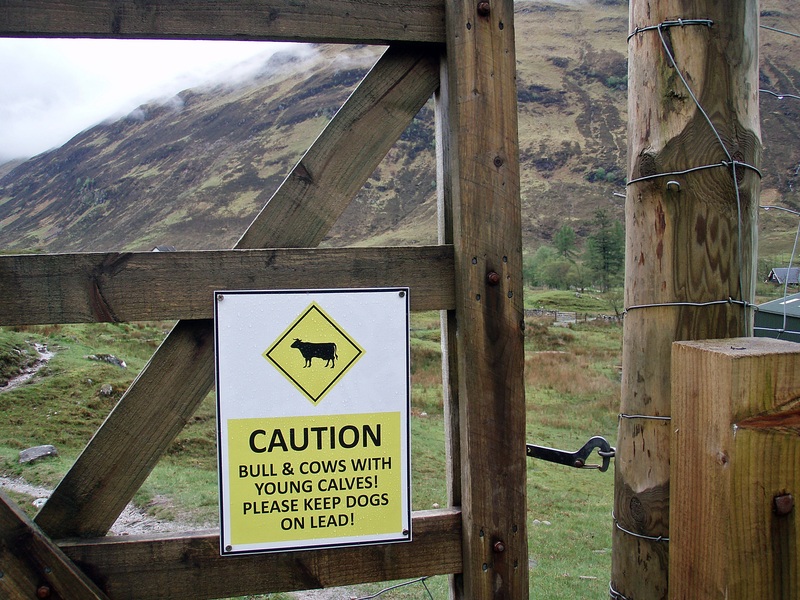 At Inchnacro I came across this worrying sign, but there were only a few cattle in the enclosure and thankfully they were some distance away from the path. On my way up Gleann Chòinneachainn I could see two walkers ahead of me, and eventually I managed to catch up with them. They were Fran and Allen who I had briefly met outside the hotel in the morning. Fran had suffered a “footwear malfunction” – walking across the hotel car park the sole of one of her walking boots had started to come off, and her emergency repair with duck tape didn’t last long in the wet conditions underfoot. I admired Fran’s determination (and her walking pace considering this handicap! 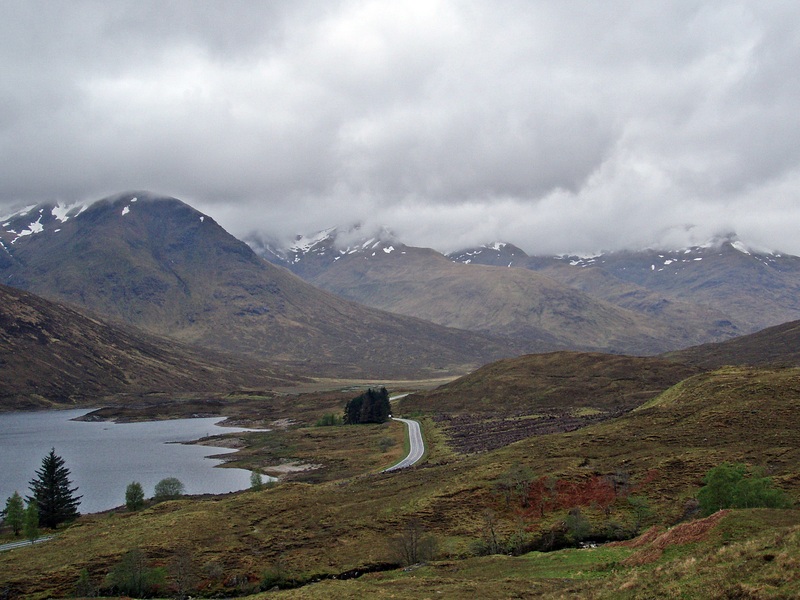 ), wished her luck to find a replacement en route and continued up the glen. 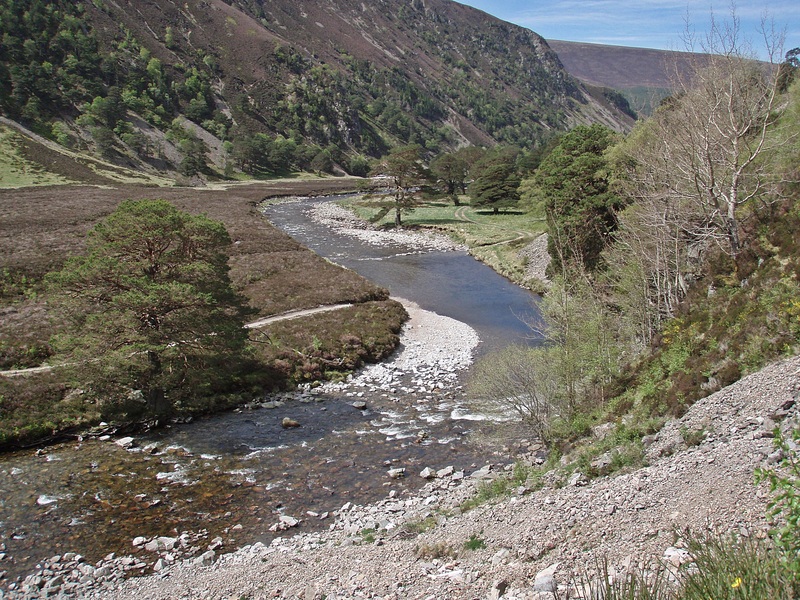 Shortly before the ford at the Allt a’ Choire Chaoil I was caught up by Evan with whom I had climbed Lochnagar on last year’s TGOC. He made it across the ford in no time and after trying (unsuccessfully) to cross a few metres downstream, I followed his example and managed to get to the other side with dry feet. 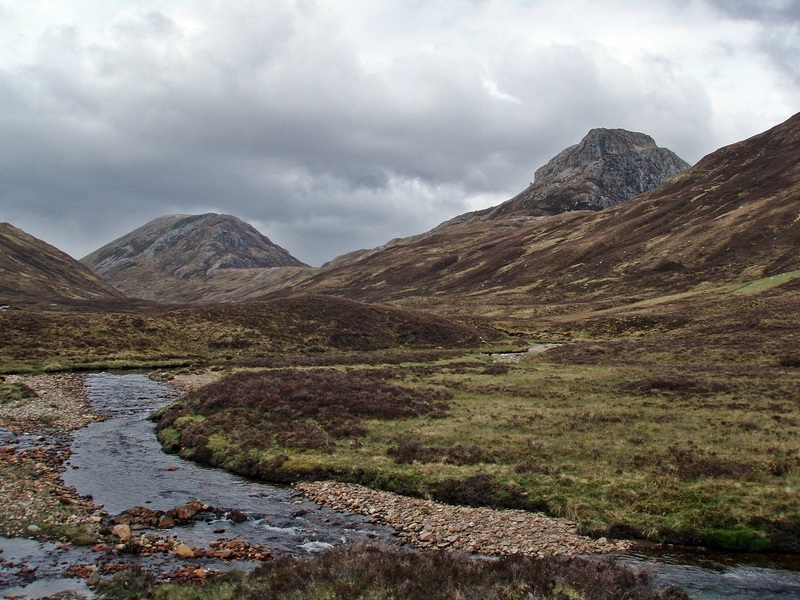 Just like last year, Evan dashed up the hill and disappeared out of sight very quickly, while I walked up the stalker’s path into Coire an Sgàirne at a more leisurely pace. 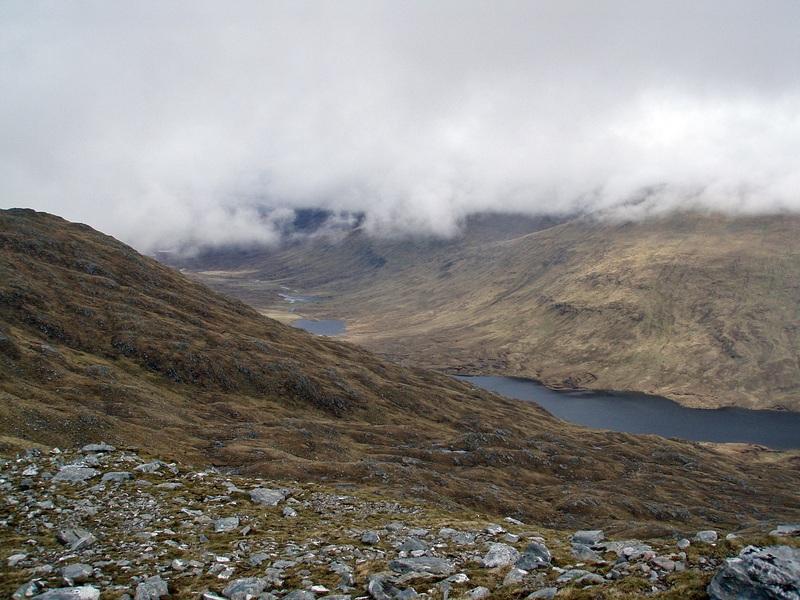 When I reached the N ridge of Beinn Fhada’s wide summit plateau, the clouds lifted and I could catch a glimpse of Gleann Gaorsaic. 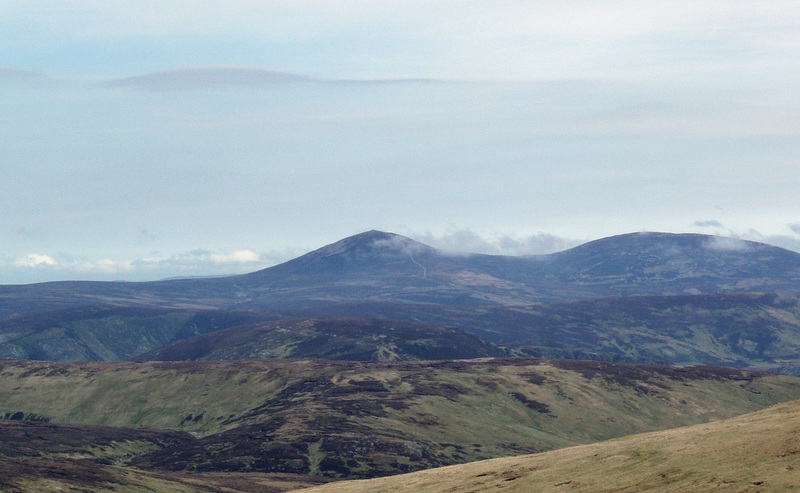 In the distance I could make out three walkers heading for the summit. For a while it even looked as if the sun would come out, but this was only short-lived. 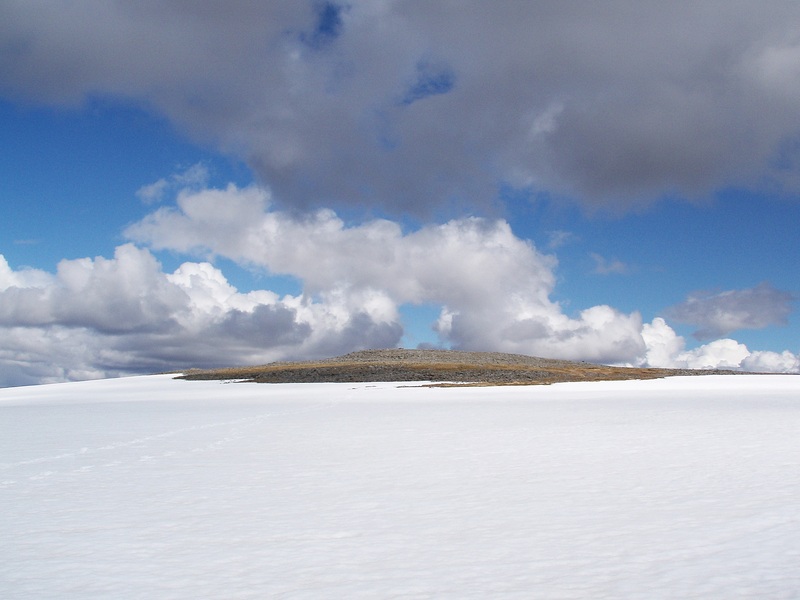 It was windy on the plateau, and a large snow patch was blocking my way. Detouring around it I stopped for a break in a sheltered dip by a stream, filled my water bottle and had something to eat. 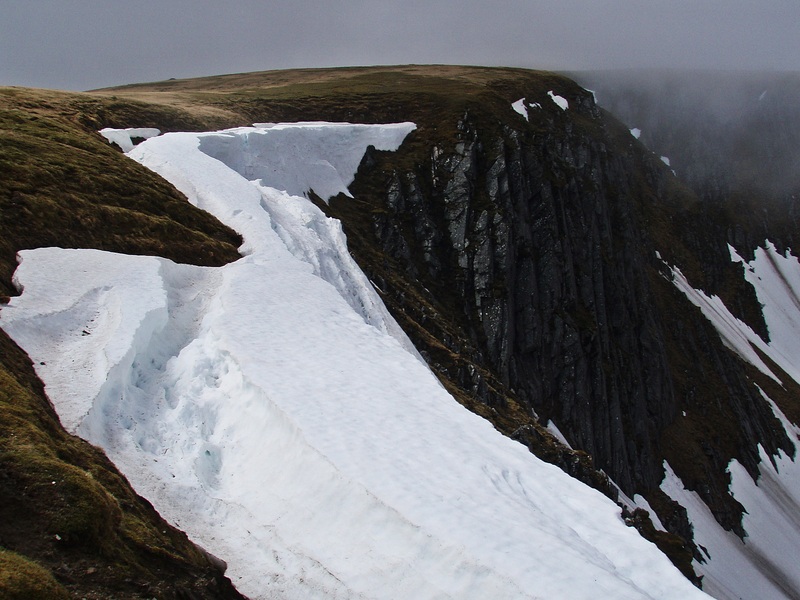 Then I continued along the rim of Coire an Sgàirne where the path was obscured in some places by large cornices. 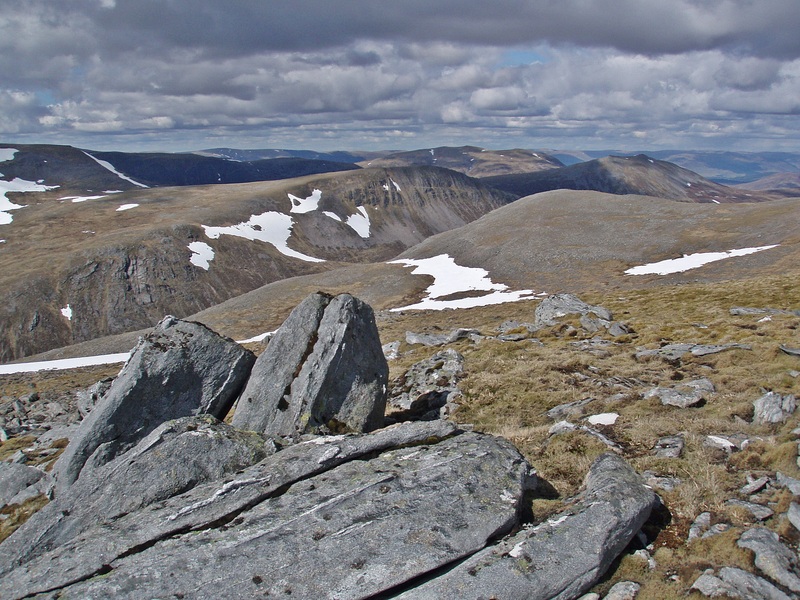 View across to the summit of Beinn Fhada. 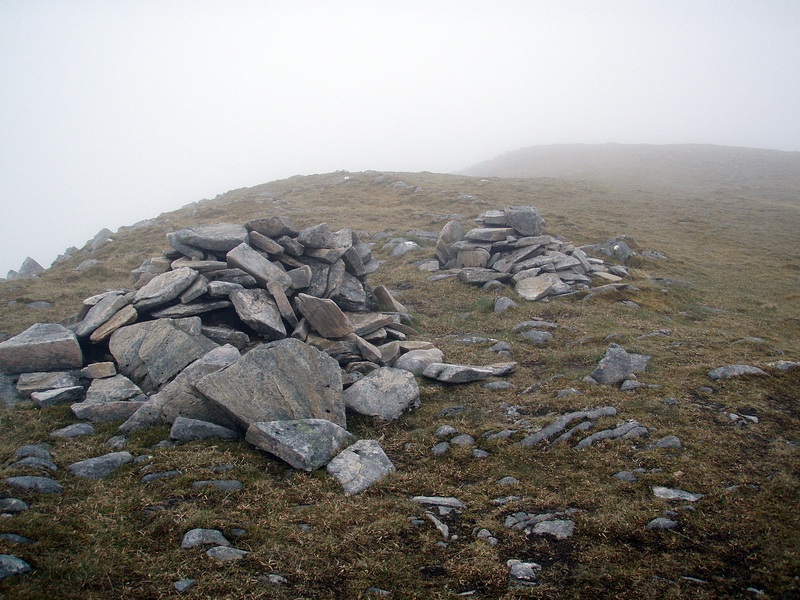 When I reached the Munro Top Meall an Fhuarain Mhòir, I was surrounded by thick fog again. 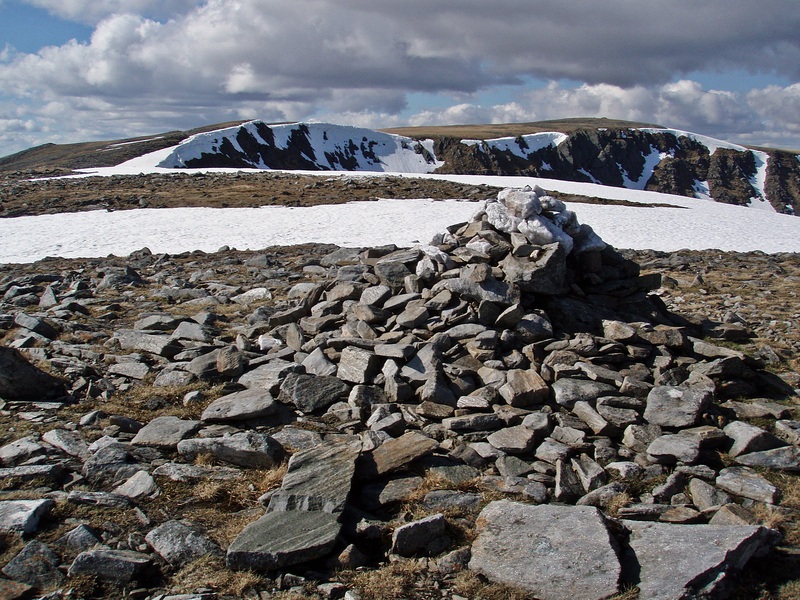 I had first wanted to walk along the whole ridge of Beinn Fhada, starting with Beinn Bhuidhe near Morvich and walking over the first Munro Top on the way, but my route vetters Ann and Alvar Thorn had advised me against it because of the scrambling sections which would be difficult with a big pack. 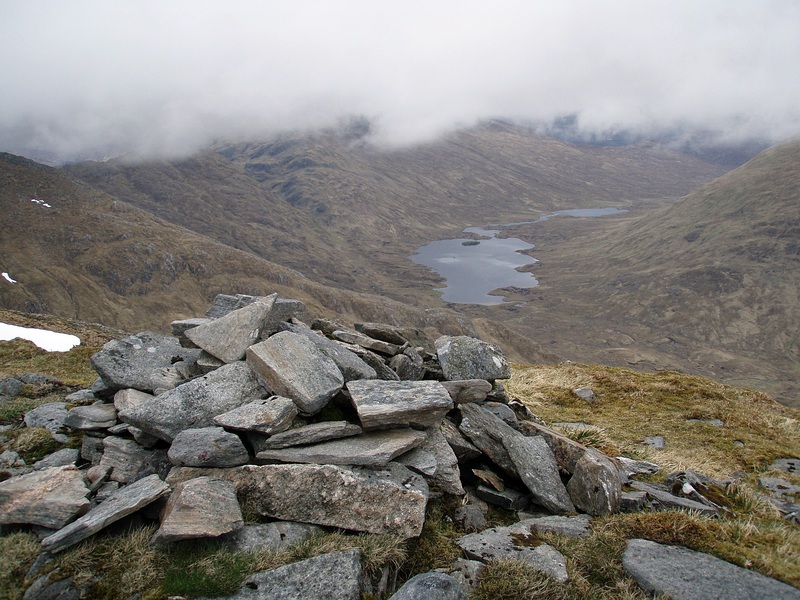 Now I was glad that I had followed their advice, considering that I wouldn’t have got any views anyway and it was just a short detour to the Munro Top. 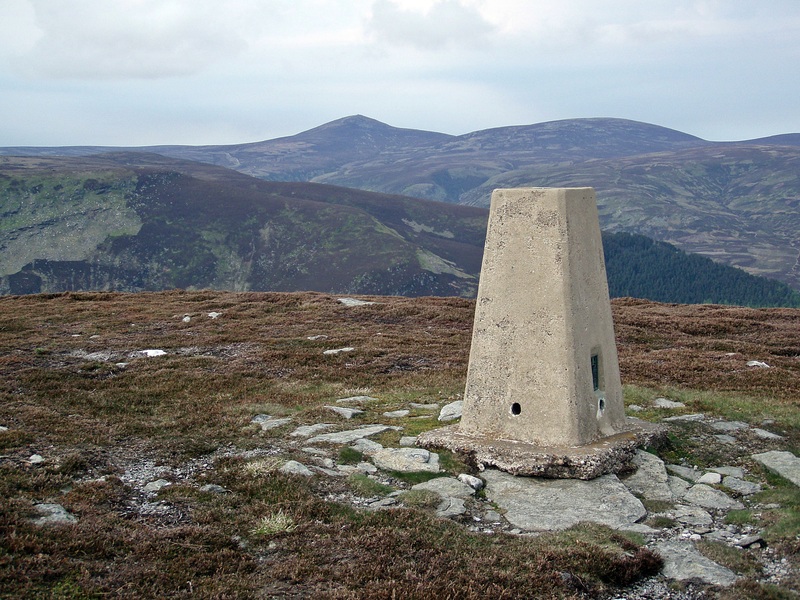 From the Top I headed across to the lonely summit trig point – the other walkers I had seen earlier had of course long gone. 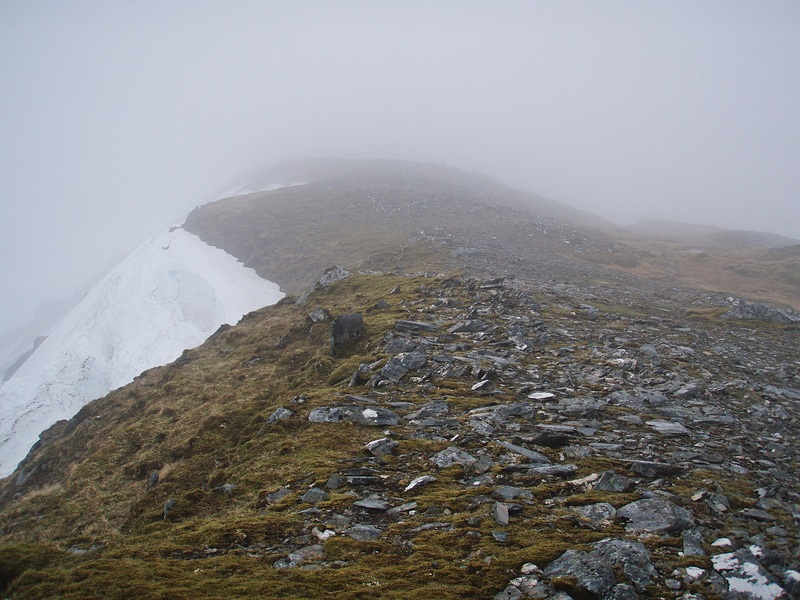 I followed a compass bearing along the SE ridge which was a bit confusing in the fog, as at times the main ridge seemed to be split into several sub-ridges running parallel and I wasn’t sure which one I should be on. When I reached the point where the ridge turns E, the clouds lifted again. 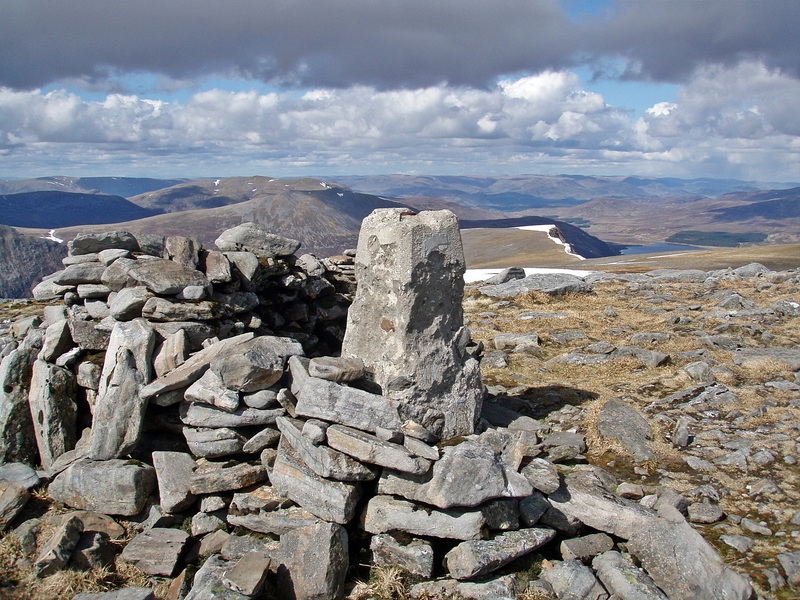 The second Munro Top, Sgùrr a’ Dubh Doire, with Loch a’ Bhealaich and Loch Gaorsaic in the background. On my way along the ridge I came across a few large snow patches that required detours around them, but generally the going was easy on grassy terrain. 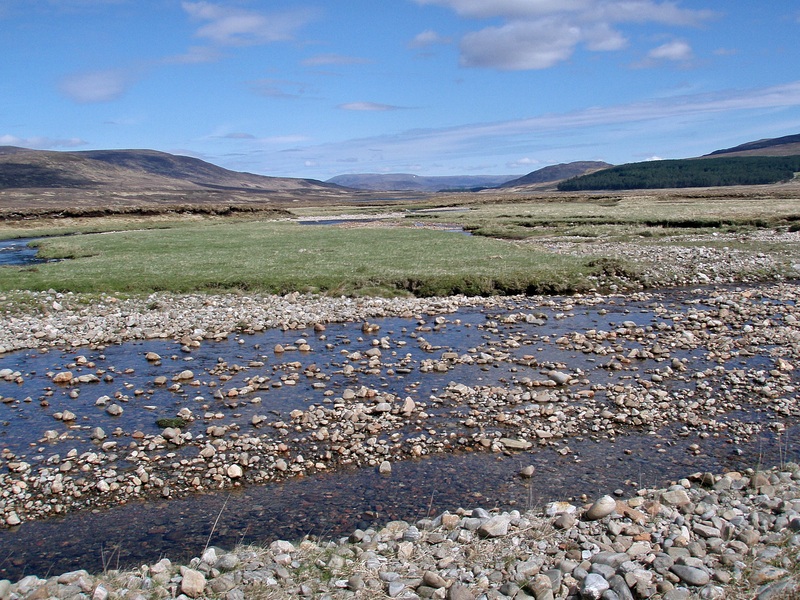 The Allt Cam-bàn with Ciste Dhubh on the left. 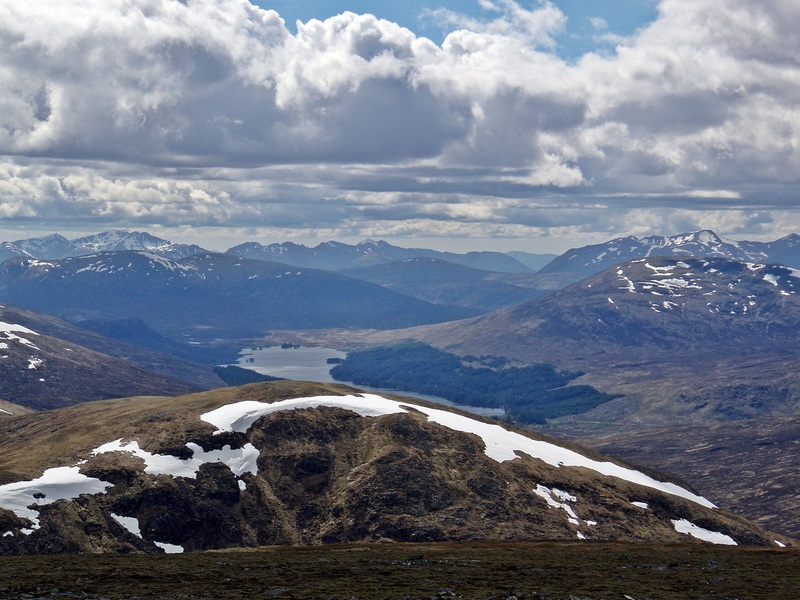 Now I could even see along the length of Glen Affric with Loch Affric in the distance. 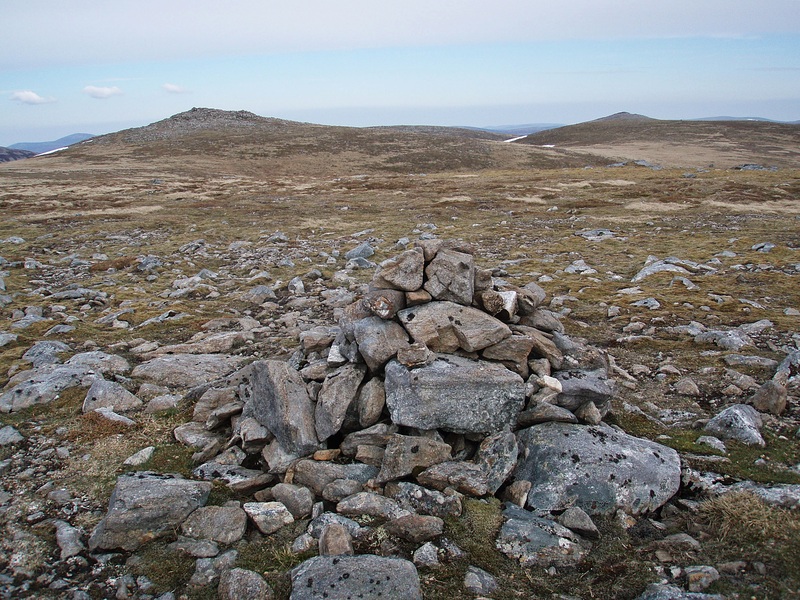 Before the last rise on the ridge at 647 m I descended into Fionngleann and towards Camban Bothy. In the bothy I met Laura and Louise, Fred, Gary, Floris and many others, there seemed to be a constant coming and going of Challengers. After half an hour I left and continued towards Alltbeithe Youth Hostel. 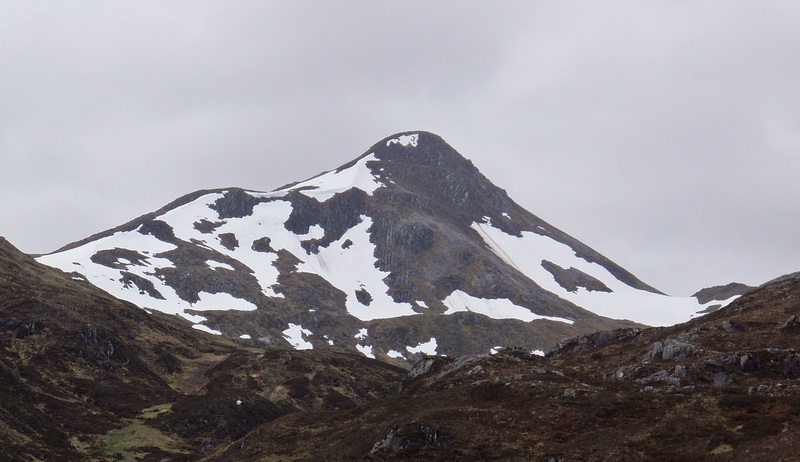 The walk so far had taken me much longer than I had estimated, and I realised I couldn’t reach my planned destination for tonight – I had planned to camp about halfway along An Caorann Mòr on the way to Loch Cluanie. 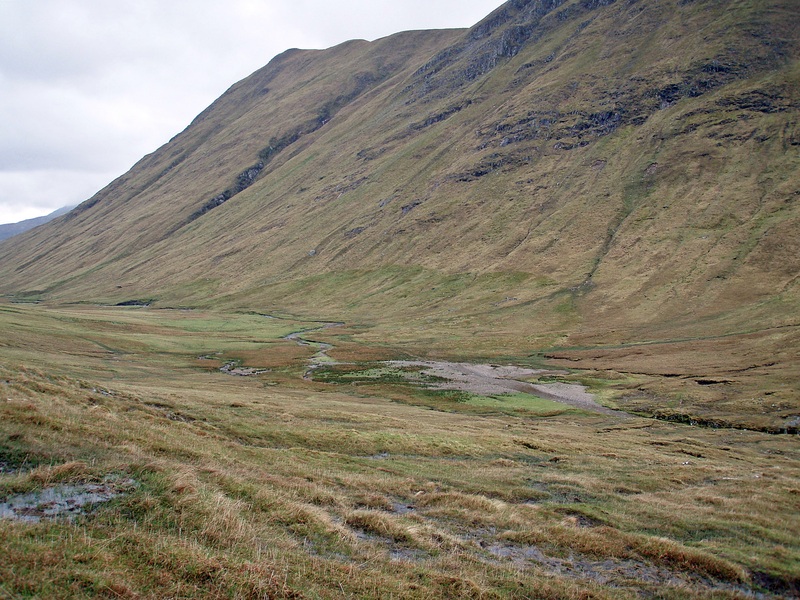 But knowing that the first half of that pass was very boggy, I didn’t expect to find any camp spots around there, so I decided that if I couldn’t be sure to reach the mid-point before dark, I wouldn’t head that way. 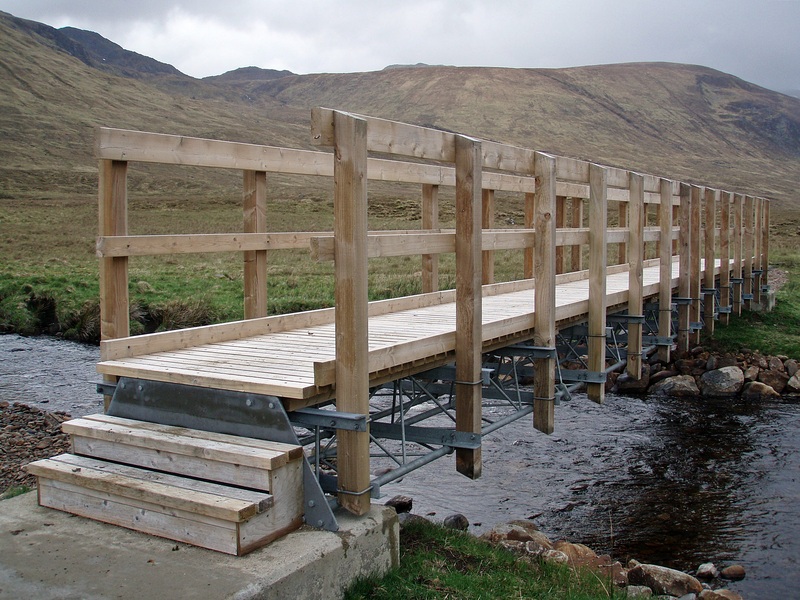 New bridge across the Allt Gleann Gnìomhaidh. At the YH I stopped for another short break, and met Evan again who had not booked, but was hoping to stay at the hostel (a large group had not arrived yet and in case of their cancellation there would be some beds available). By now, my shoulders and hips were sore and I just wanted to stop walking for today. I crossed the bridge by the hostel and found a camp site about 800 m upstream. I woke up at 05:00 and couldn’t fall asleep again, so I just got up. In spite of being up so early, it was still after 08:00 by the time I was finally ready to go. It was raining when I left, so I had to pack up a wet and heavy tent. 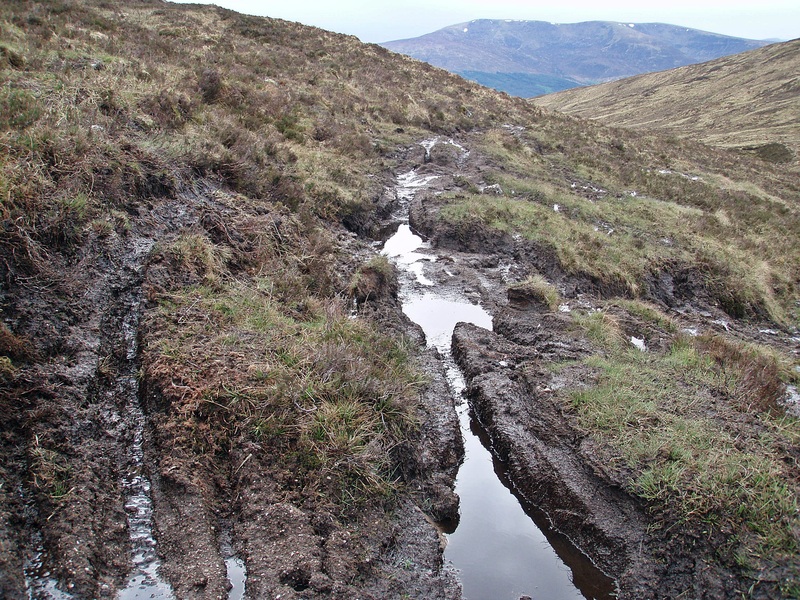 The path towards the pass An Caorann Mòr was very boggy, as I had expected. 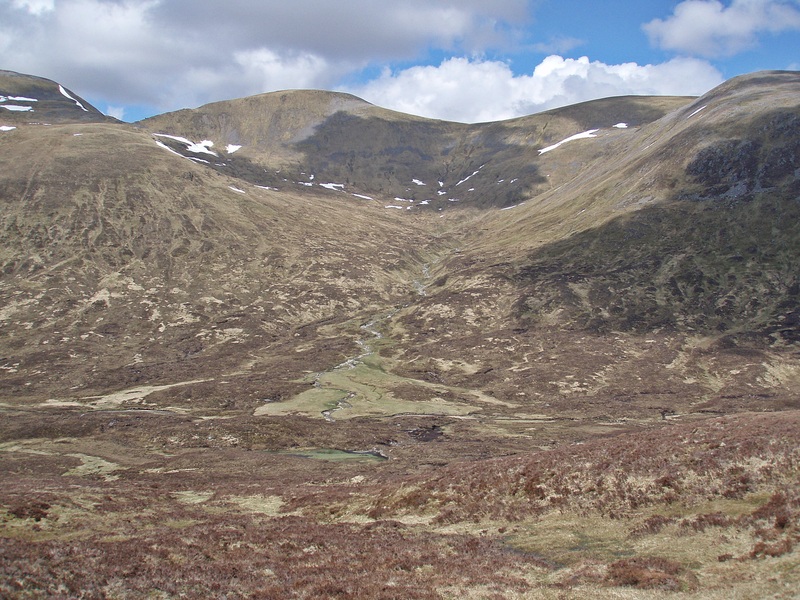 However at the foot of the NE slopes of Ciste Dhubh I could see what looked like potential camp spots by the Allt a’ Chòmhlain – if I had known that I could have tried to walk a little bit further the night before. 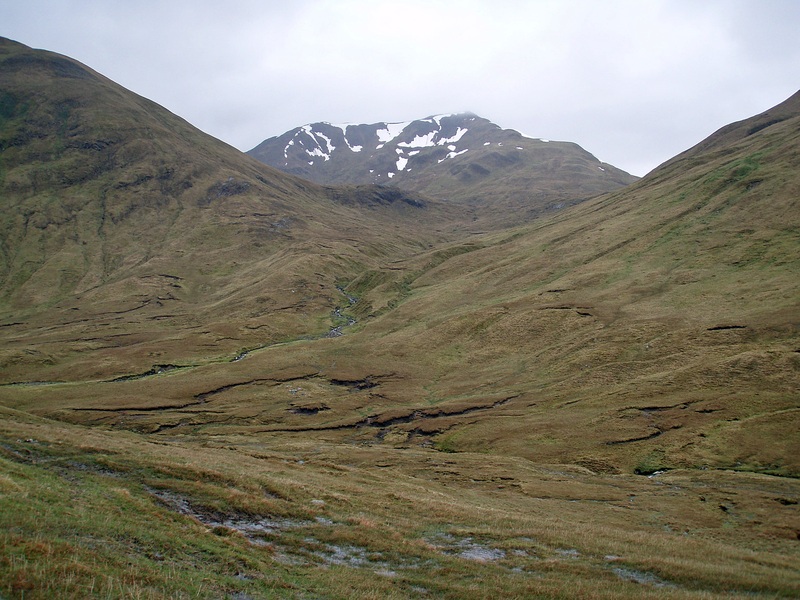 The E end of the Brothers Ridge visible above Bealach a’ Chòinich. 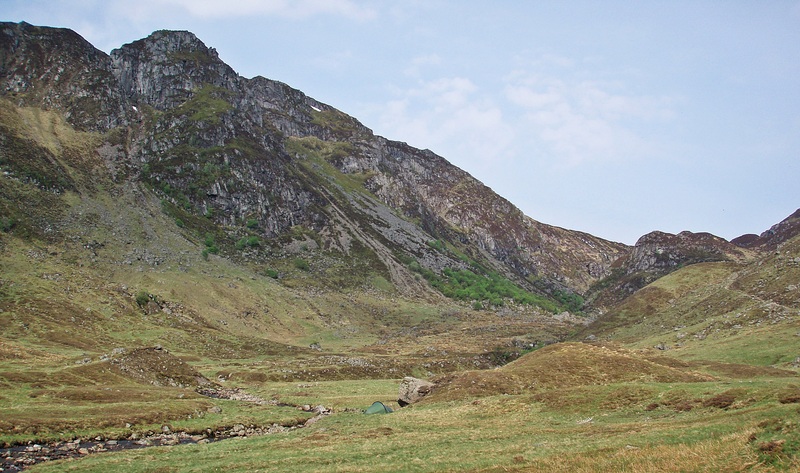 This is roughly where I had planned to camp last night, by the Allt a’ Chaorainn Mhòir below Am Bàthach. 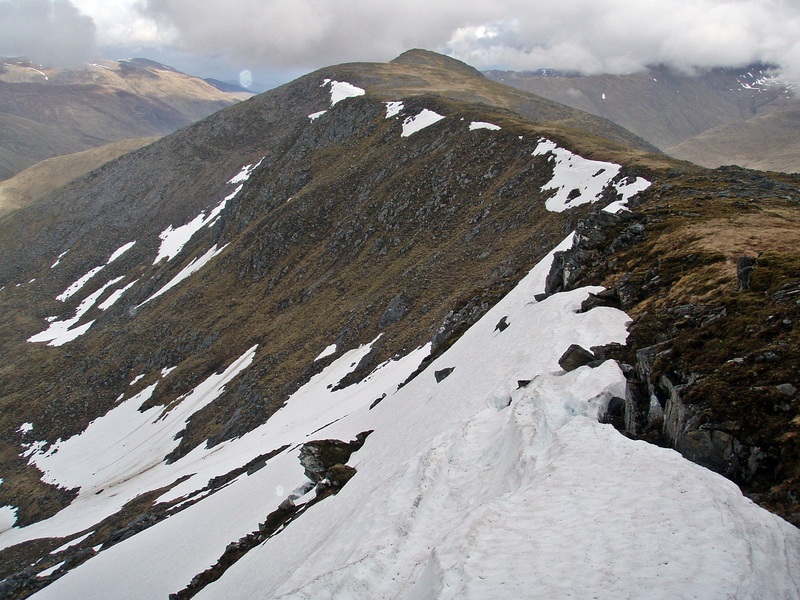 The South Glen Shiel Ridge. 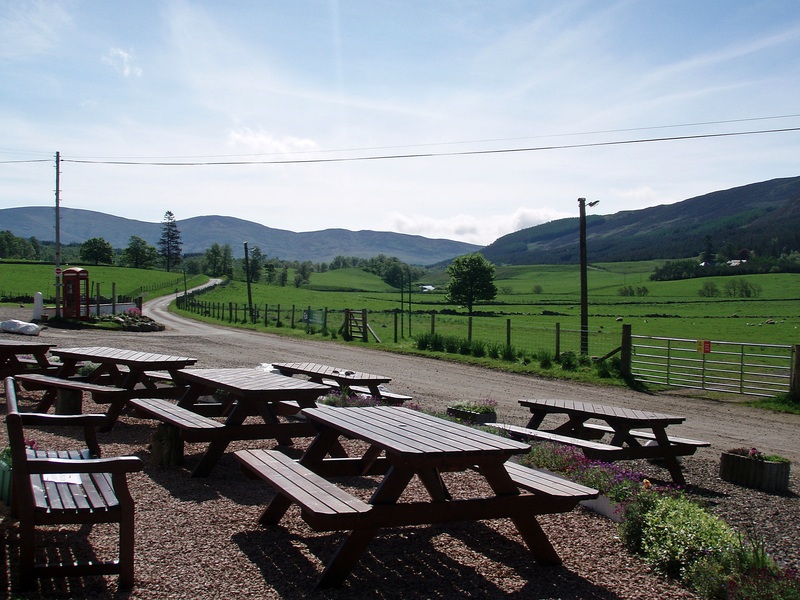 I arrived at the Cluanie Inn at 12:30 and had an extended lunch break outside, sitting on one of the boulders beside the car park. The rain had stopped, it was nice and warm now, and I enjoyed just sitting there and watching guests coming and going, there was also a piper playing while wandering up and down in front of the restaurant. 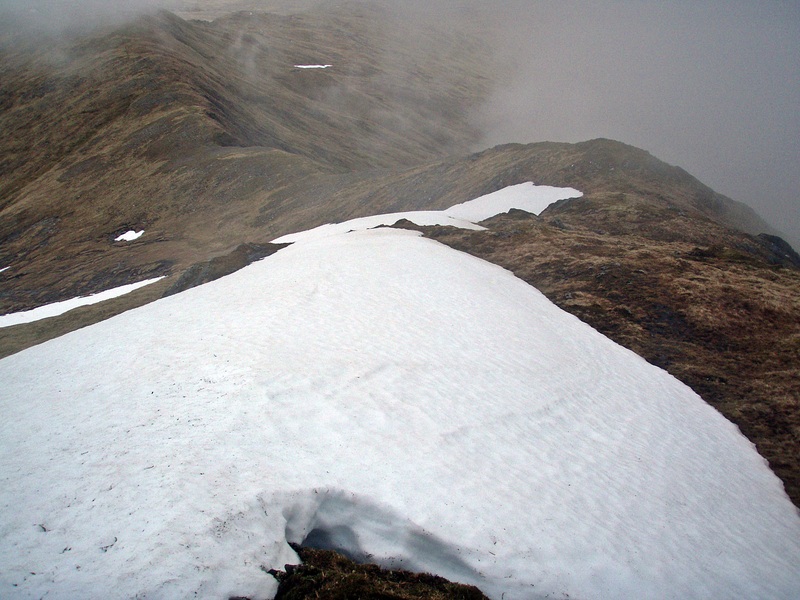 Then I continued along the track around the E end of the South Glen Shiel Ridge. 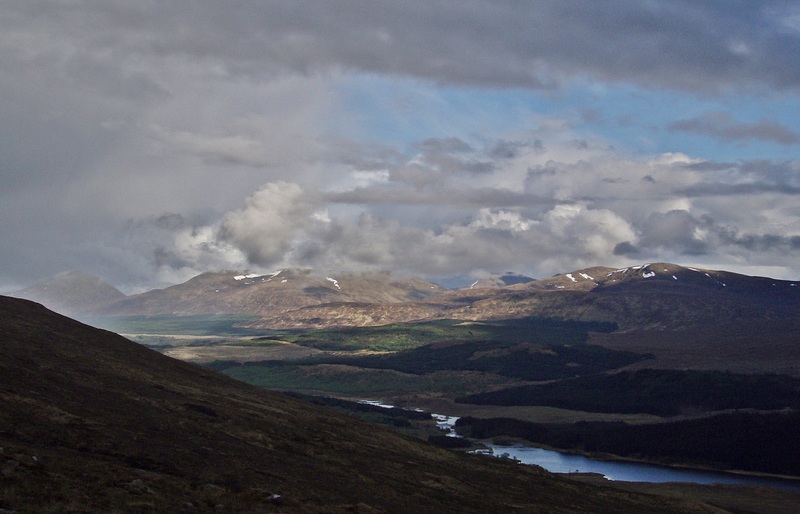 Looking back to An Caorann Mòr. 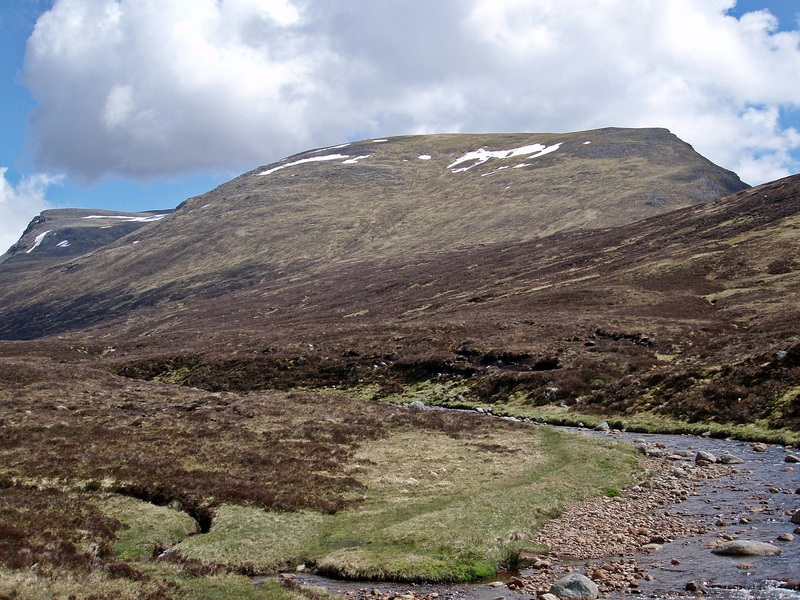 After the ford across the Allt a’ Choire Odhair the path seemed to keep going in the wrong direction for too long and I took a shortcut down to the main path in Glen Loyne. 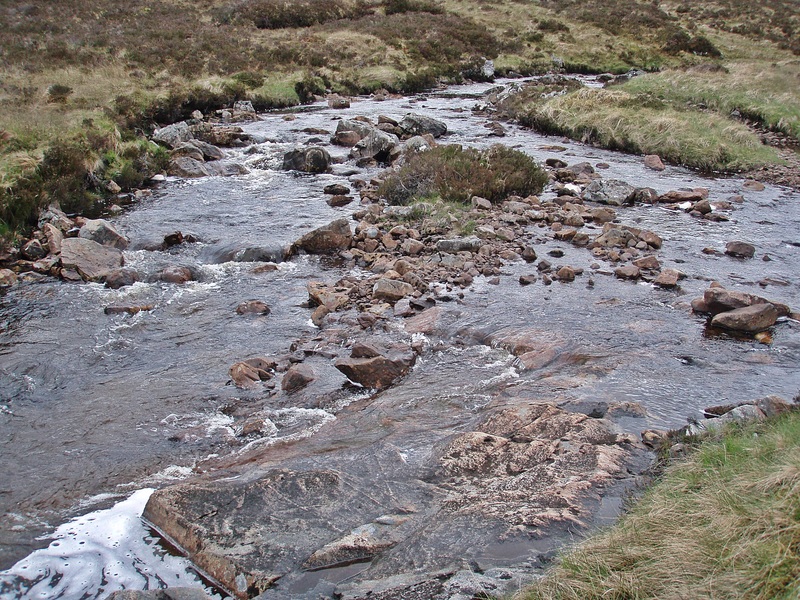 The crossing of the River Loyne was straightforward, the water was a bit less than knee-deep and I just waded through with my shoes on. This was nice and refreshing as it was quite warm by now, but on the other side of the river I decided to have another break in the sun. 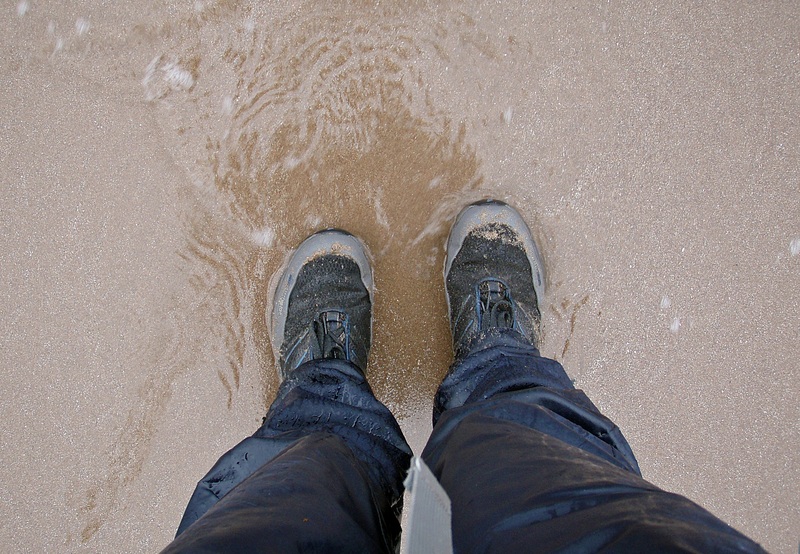 I emptied the water from my boots, wrung out my socks and put everything back on (of course I might as well have changed into Crocs and kept my socks and boots dry, but that had seemed too much hassle at the time…). 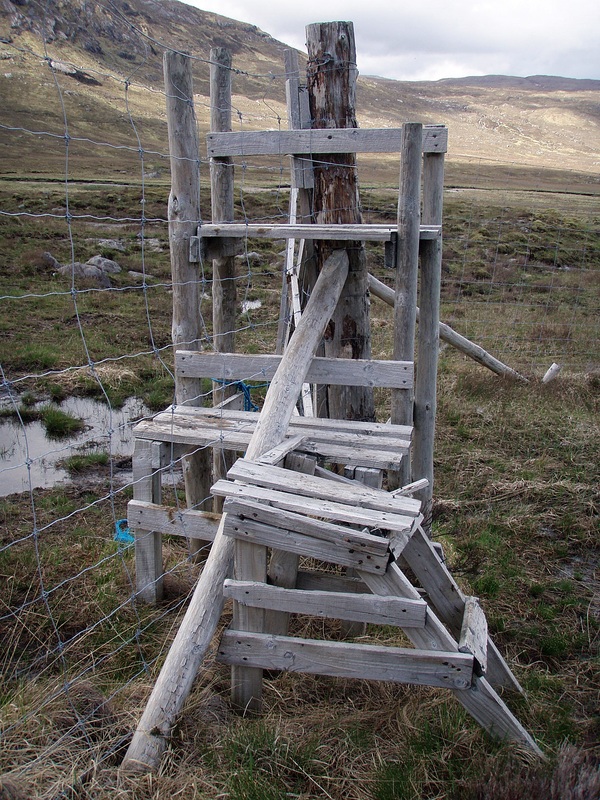 It was slightly awkward to climb over this partly broken stile, but I was glad that there was a stile and I didn’t have to climb the fence. 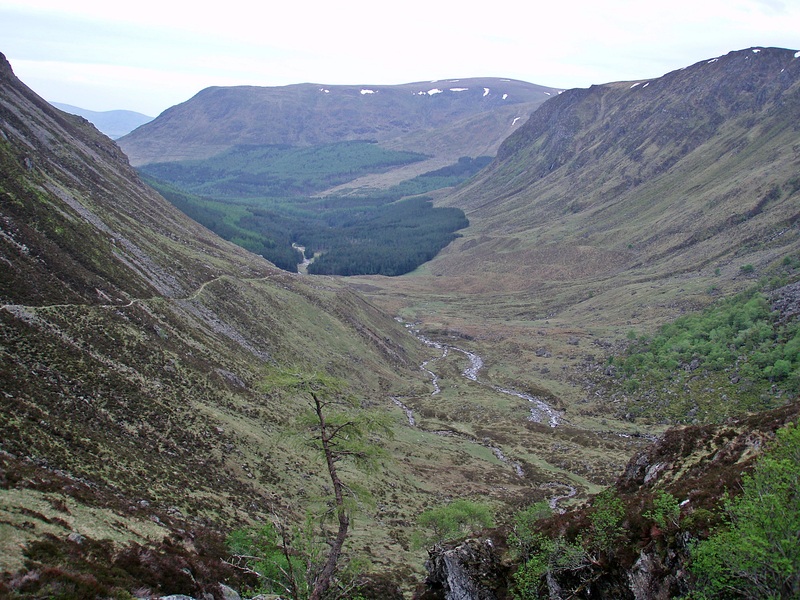 At the other side of the enclosure, looking down into Glen Loyne. 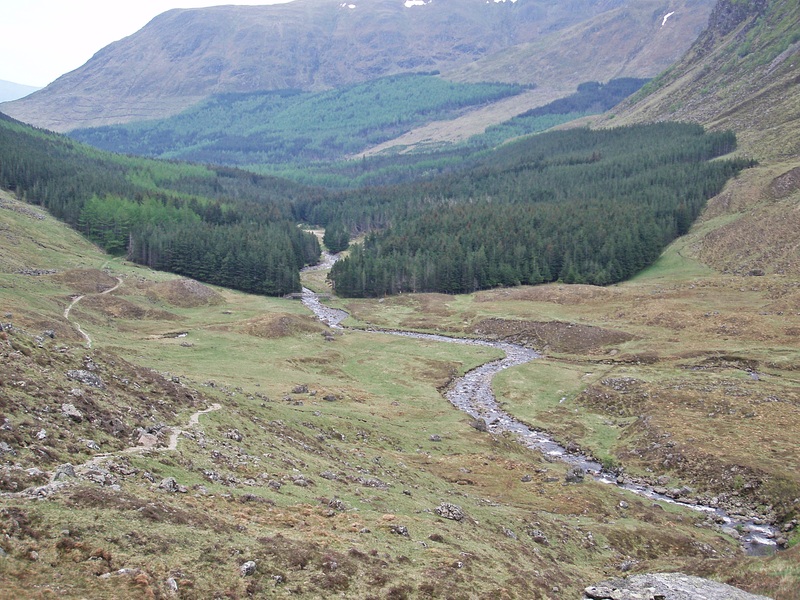 From the pass across the Màm na Seilg the hills of the Glengarry Forest looked inviting in the sun. 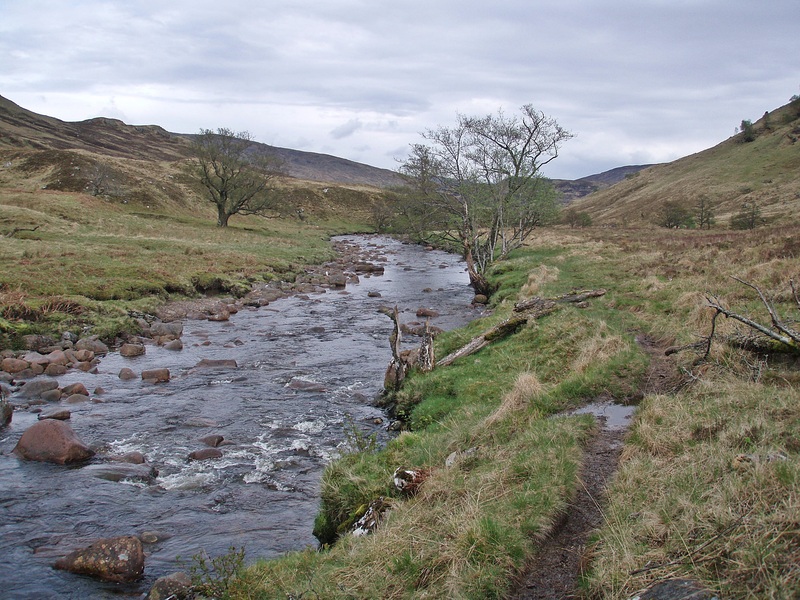 My shoulders and hips had started to hurt again, and when I arrived at the road in Glen Garry, I saw a few people making camp by the bridge across the Allt a’ Ghobhainn. I assumed they were Challengers and I would have liked to join them, but I couldn’t really afford to stop for the night yet. 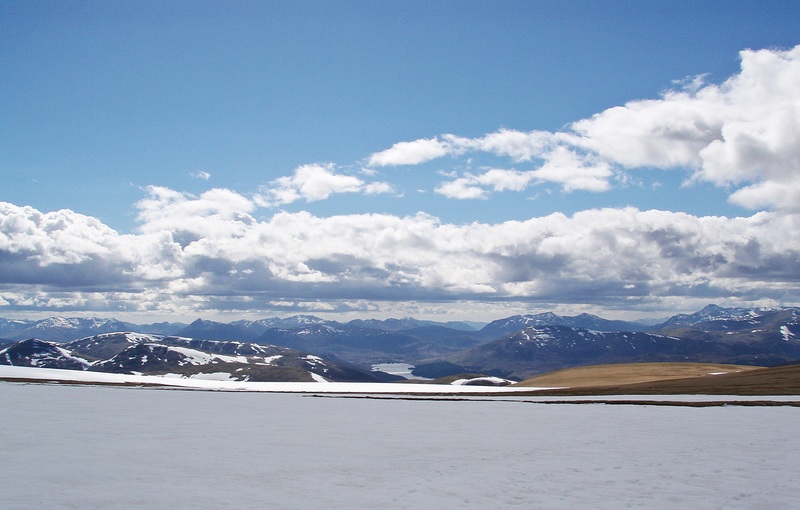 I had camped about two hours short of my planned destination last night, and now I had to catch up because I had to make it to Spean Bridge the next day where I had booked a B & B. 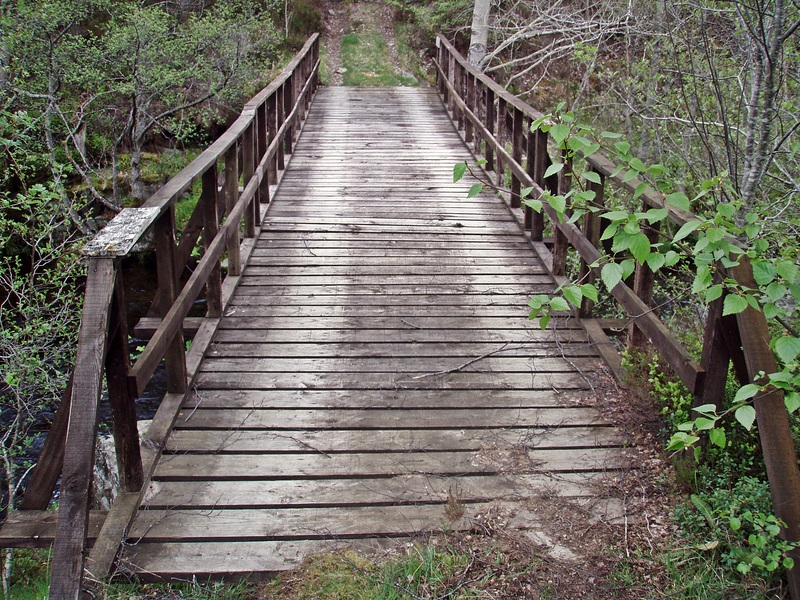 So I continued along the road to Poulary and crossed the bridge over the River Garry into the forest. 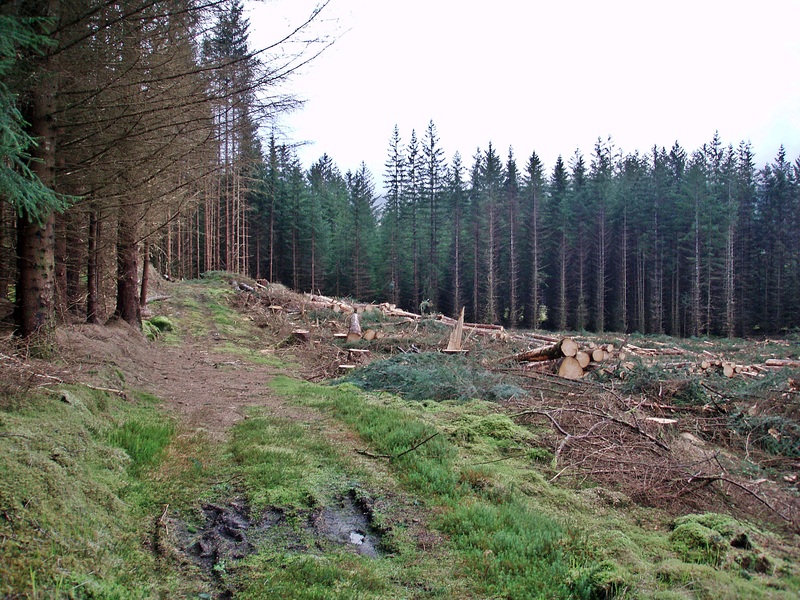 I checked the map, realised my error, turned back (clambering over all those trees again) and was soon back on a nice wide forestry road. I was annoyed with myself because I could have done without this delay, especially as I was worried I might run out of daylight before I found a place to camp. 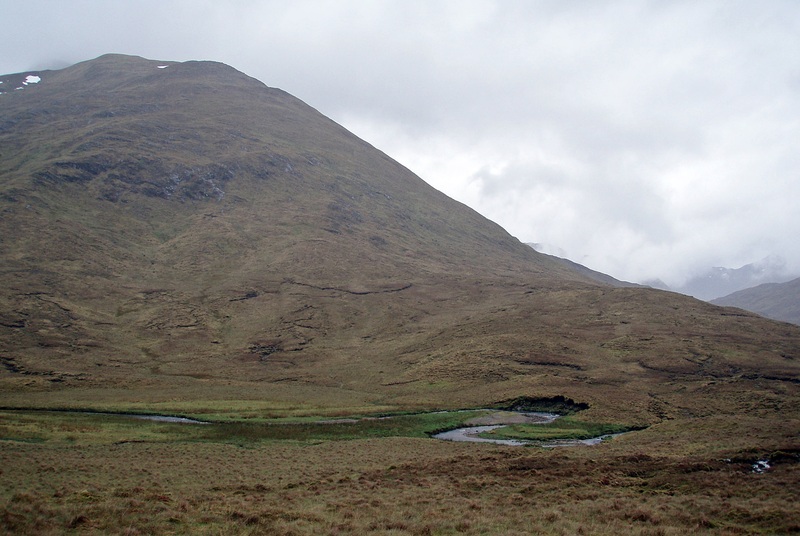 Most of the forest around had been felled, and I had been warned by my route vetters Ann and Alvar that the path around the E flank of Glas Bheinn would be difficult to find. 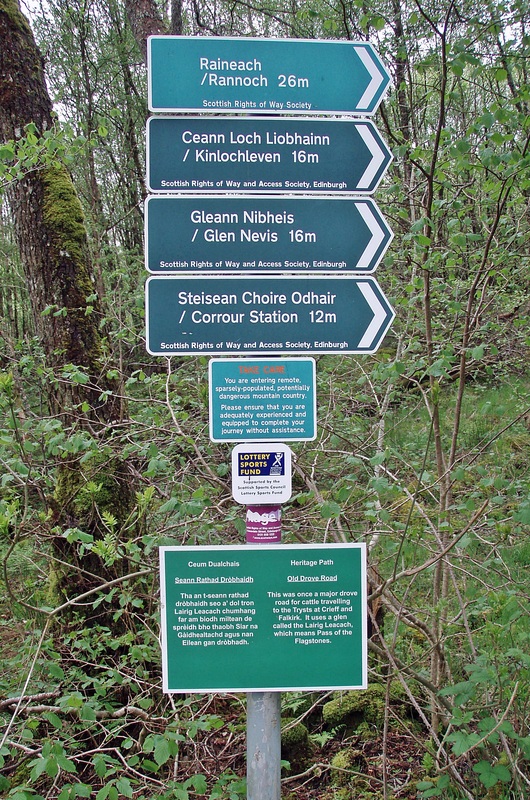 I followed the forestry road as far as possible and when it started going in the wrong direction, I checked with ViewRanger where the path was supposed to be. 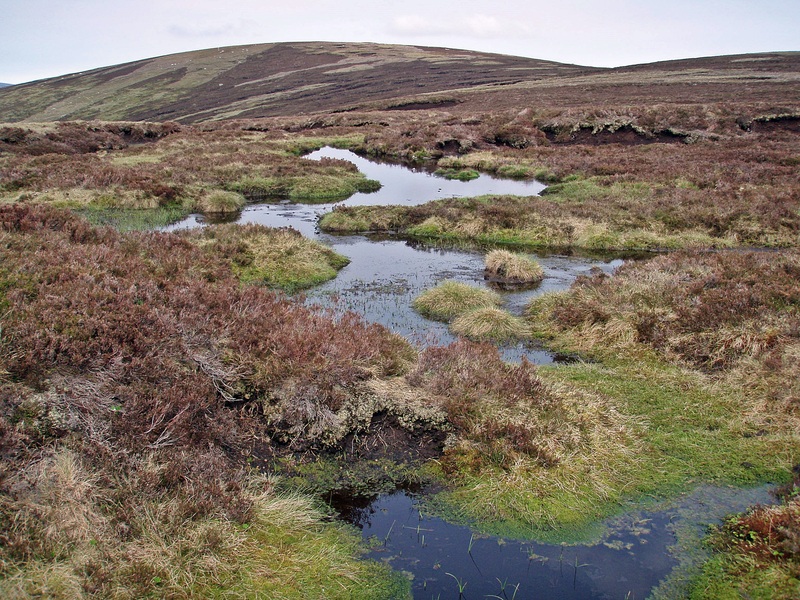 To reach it, I had to negotiate some difficult terrain – fallen trees and branches of all sizes lying about with spongy moss and water/bog in between. By now I was tired, hungry, dehydrated because there was no clean water about, and various parts of my body hurt. 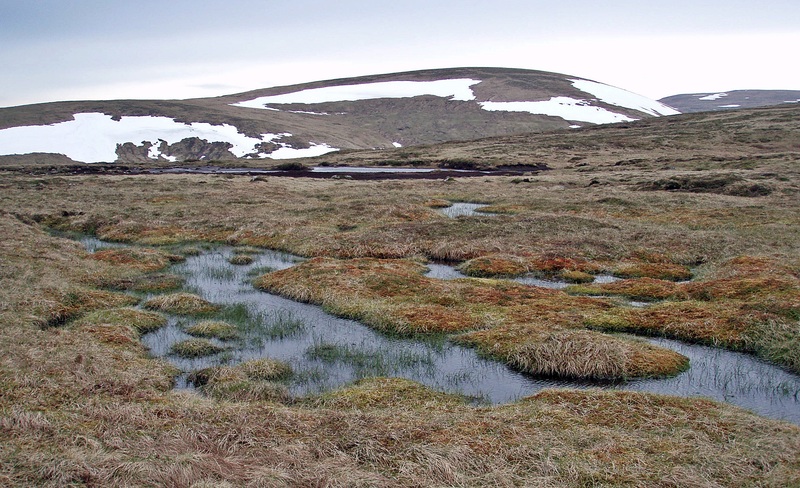 Once I found the “path” which was more like a boggy mess, I stumbled along it, determined to stop at the first opportunity as long as the ground was flat and there was water nearby. My camp site had not only been too small, but also a bit slopy and I had kept rolling to one side during the night. 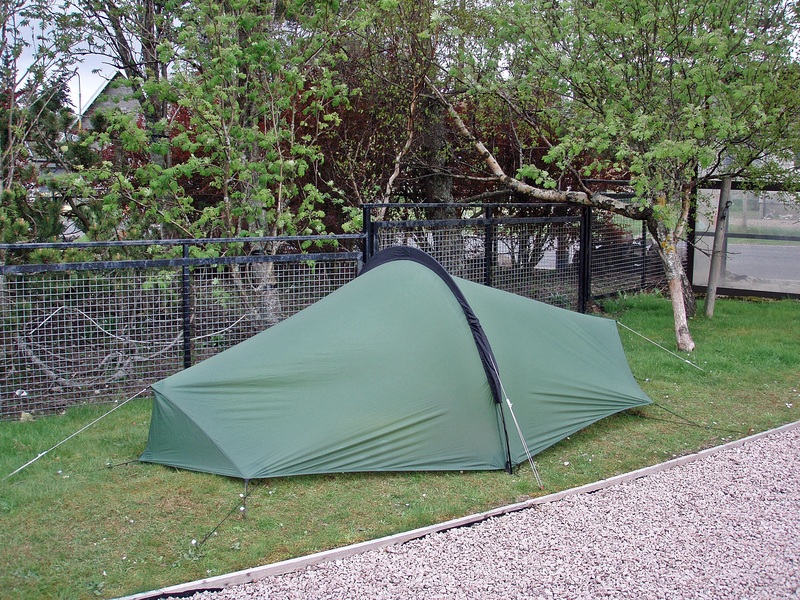 How not to pitch a tent…! 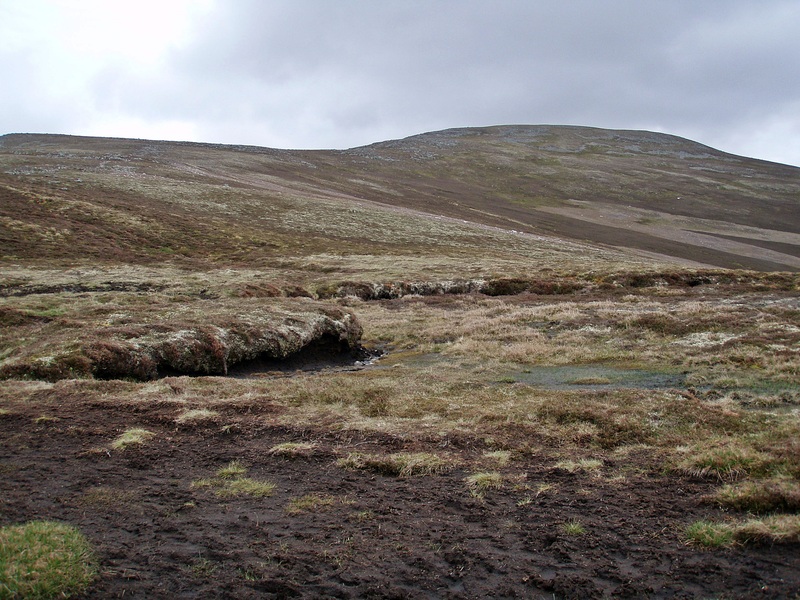 It had been raining at first, and again I had to pack up a wet tent, but at least it had stopped raining when I started walking across the bleak moorland. 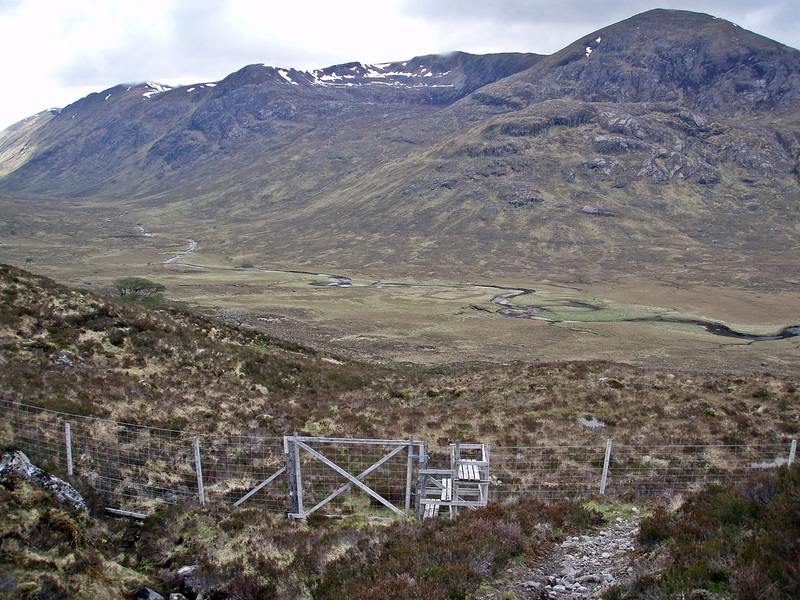 Soon I reached the Allt Lòn Ghlas Bheinn where there is a footbridge marked on the OS map (visible on the left in the photo). 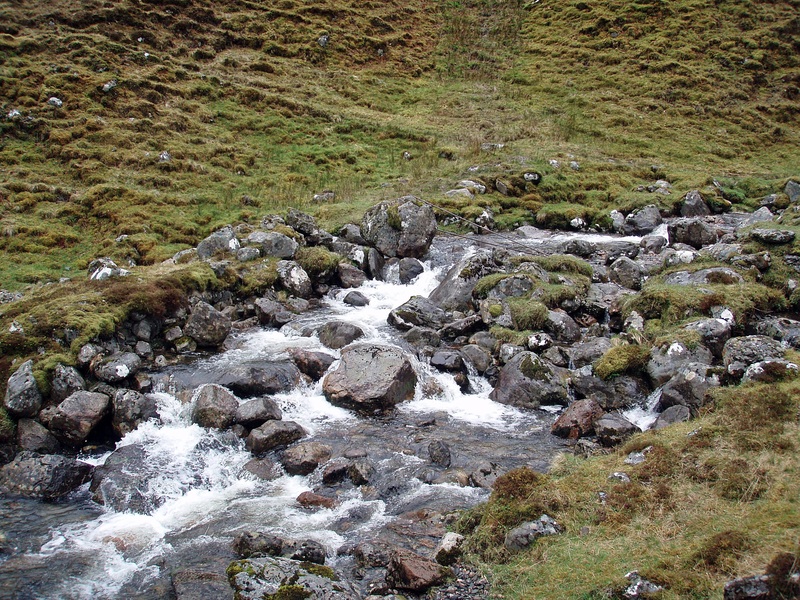 Walking further upstream, I found a tiny island and some stepping stones where I could get across with dry feet. 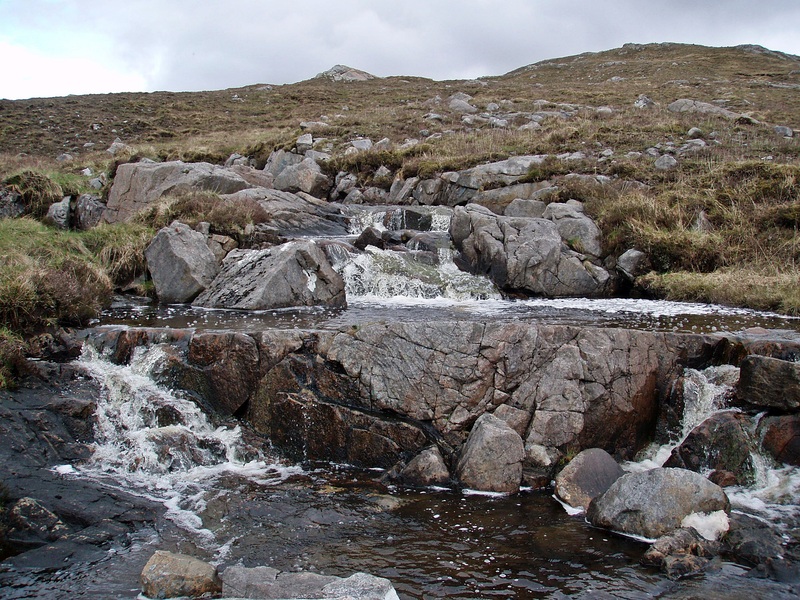 After fording another stream, the Allt an Fhithich, I followed a path leading along the Allt Ailein to Bealach Carn na h-Urchaire. 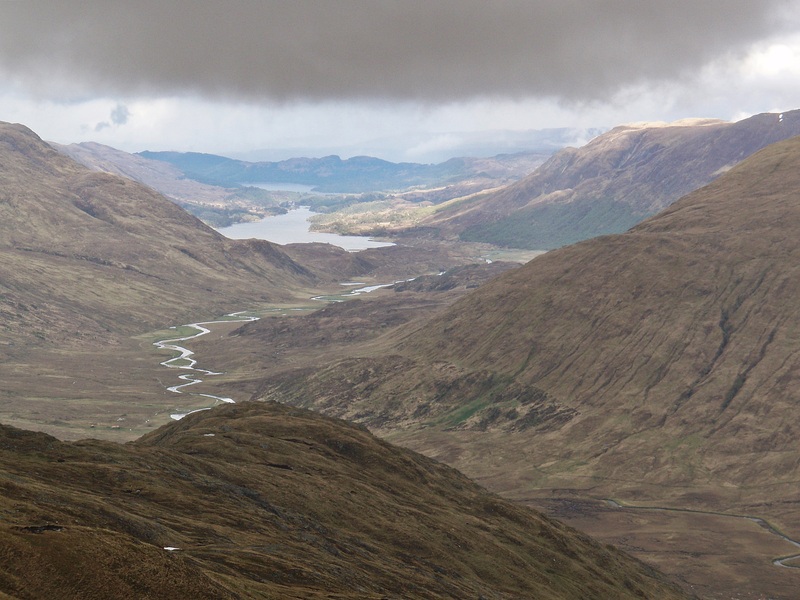 On my approach to Bealach Carn na h-Urchaire I was accompanied by rain and cold wind, but the weather improved again on the descent into Gleann Tarsuinn. 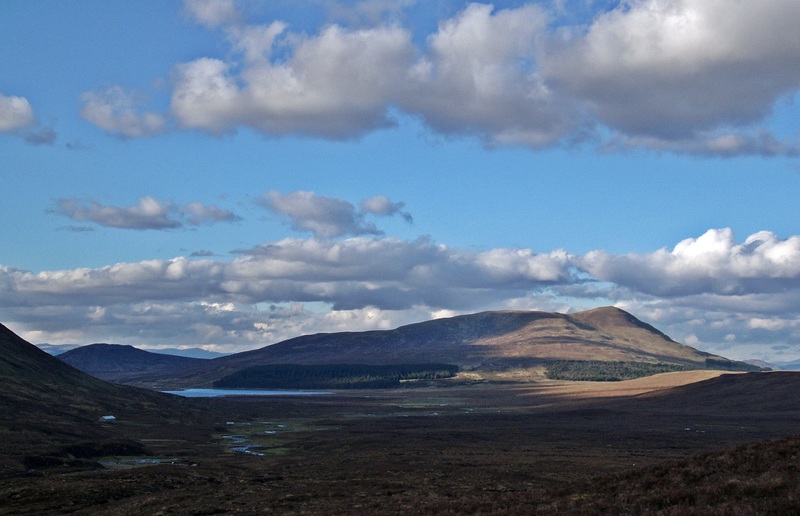 Gleann Tarsuinn with Meall na Teanga in the distance. 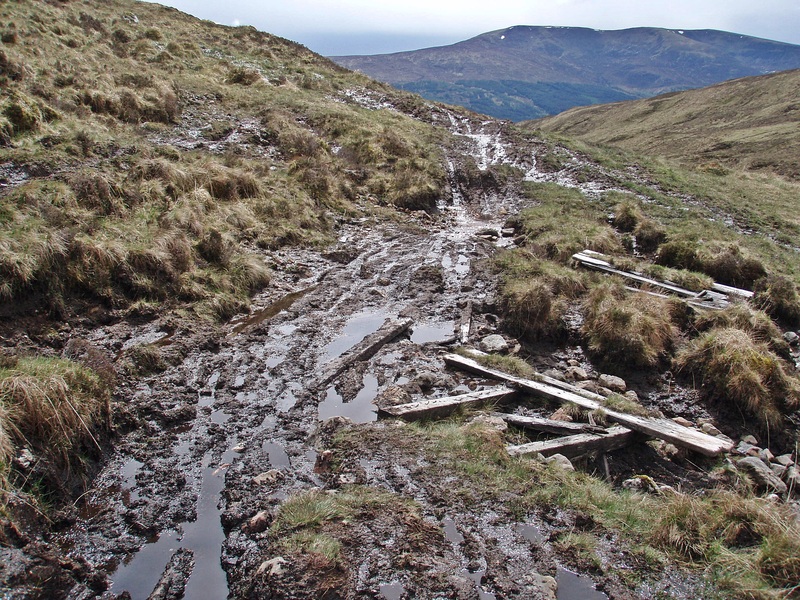 After all this boggy terrain I was looking forward to the good track along the Allt Dubh. 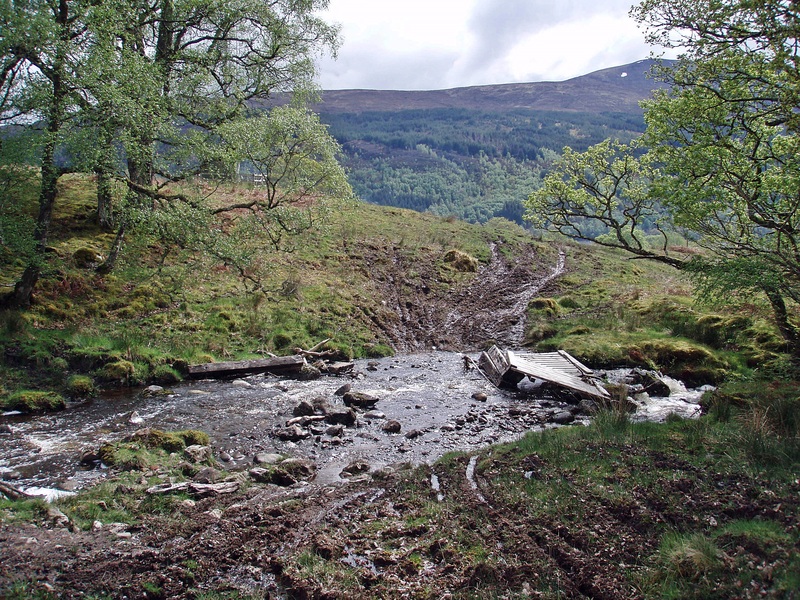 What I didn’t know was that the motorcyclists had just held their annual path-destroying event in the area, called the Scottish Six Days Trial. It was very slow going on this section (and very messy), but at least it was sunny and warm by now. 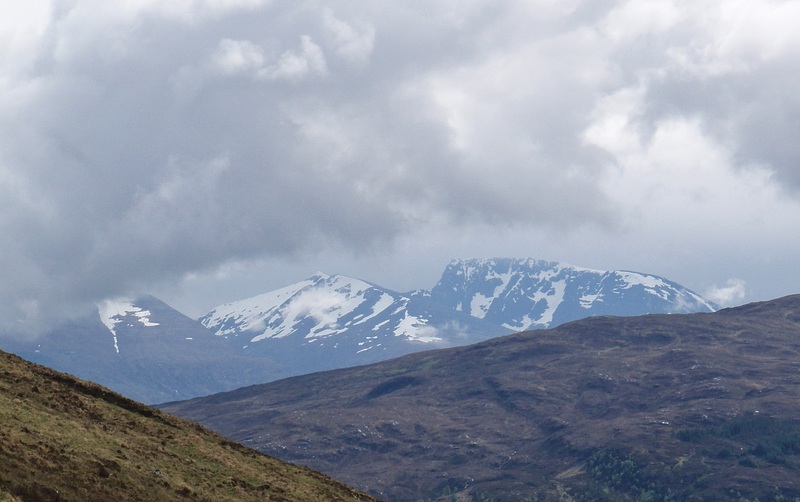 A glimpse of Ben Nevis. Further down the condition of the path was slightly better, but with the ground being saturated, it was still more like a stream in places. 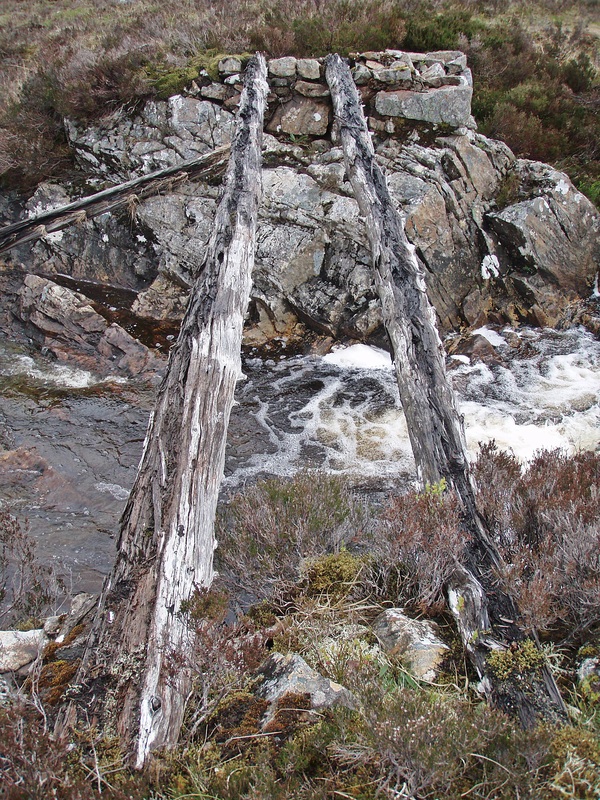 … but after testing it carefully, I found that the remains of the bridge were wedged firmly between some rocks and were safe to walk over. 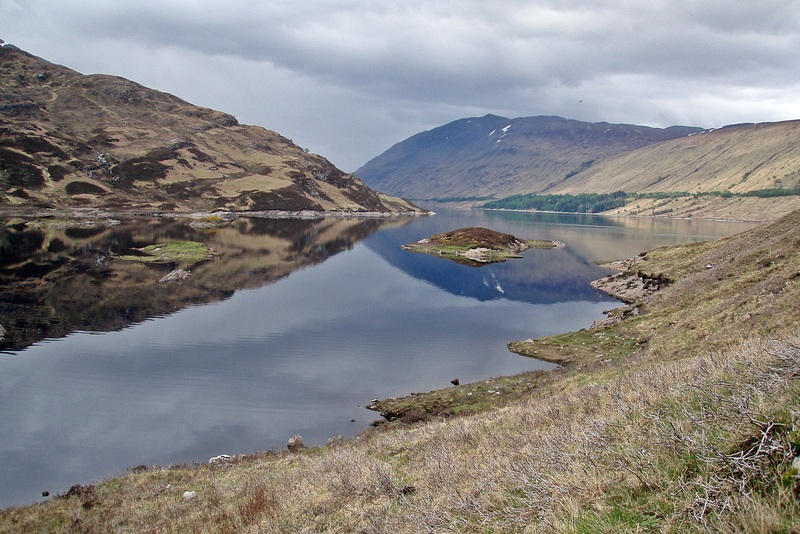 I normally hate road walking, but after all this it was a relief to reach the single track road along Loch Arkaig. On the road I met Challengers Ruth and Jerry and we walked together to the bridge across the River Arkaig where they stopped for a break and to discuss their route while I continued. 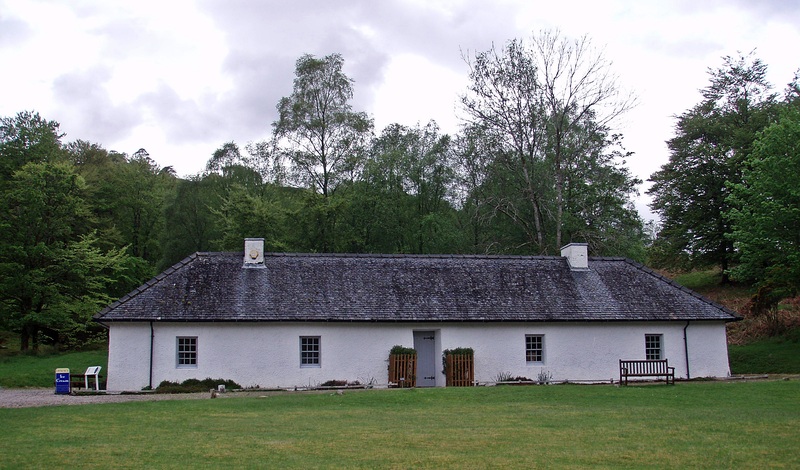 Clan Cameron Museum at Achnacarry. 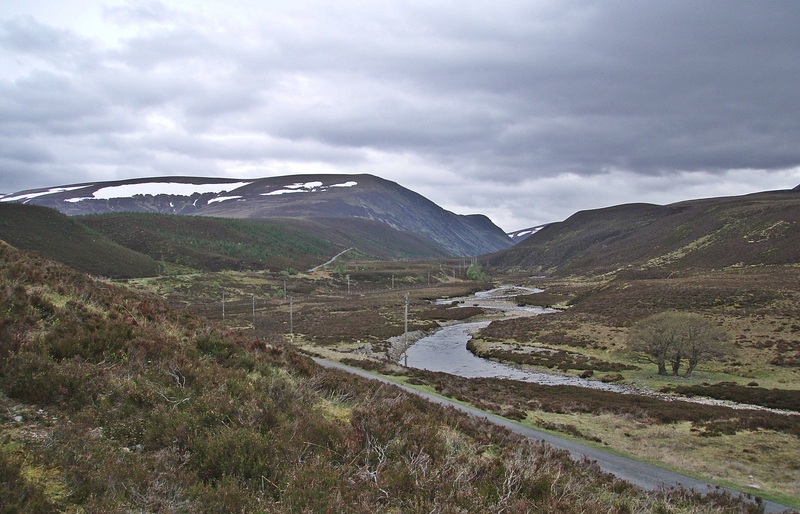 When I reached Gairlochy at 17:30 I noticed I had a phone signal, so I phoned my B & B in Spean Bridge to let them know that I was on my way but would certainly arrive after 18:00. The host was very helpful and offered to come and pick me up, which was tempting but obviously I had to decline his kind offer if I didn’t want to get disqualified from the Challenge! 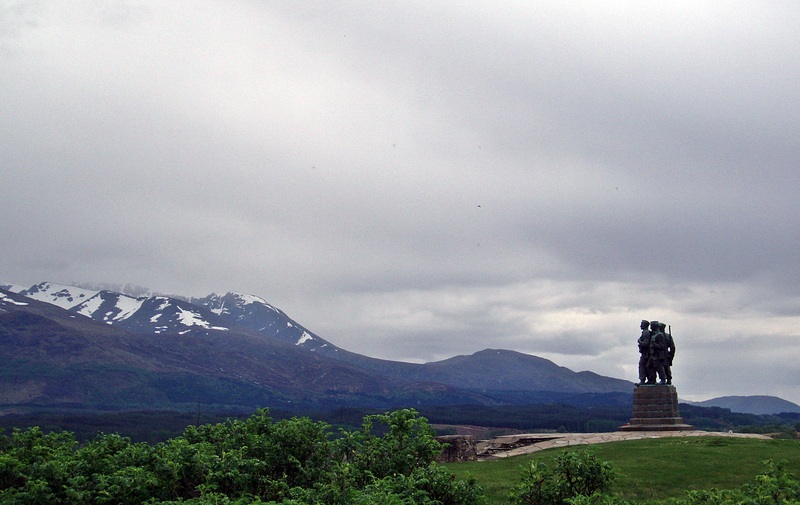 I had a short break by the Commando Memorial, then dragged myself the last couple of kilometres to Spean Bridge. My shoulders and hips were troubling me again, and I had developed a sore spot on my right foot where the boot had been rubbing. It was 18:30 when I finally arrived at the excellent Mahaar B & B. The host provided me with the menus of three restaurants, and when I had made my decision, he phoned ahead and booked a table for me at the Old Station Restaurant just around the corner. Because of my late arrival I only had time to have a shower and wash my hair, sorting out the contents of my rucksack and washing some clothes would have to wait until later. At the restaurant I met Challengers Markus and Philipp from Austria who were sitting at the table next to me, and it was nice to spend the evening in good company. The meal however was average at best, I had Mushrooms Provencale, Jacobean Chicken and Apple Crumble Pie. The dessert was ok, but the rest was quite bland, especially the starter which consisted of a few mushrooms covered in a sauce that looked and tasted like tinned tomatoes. The cider that I had ordered without ice, as usual (as I don’t like it watered-down, not because I enjoy lukewarm cider), was served at room temperature. That put me off from ordering a second one, but when the bill arrived, I had been charged for two – which was corrected when I pointed it out, but all in all a disappointing experience. Back at the B & B I washed a few clothes, hung my tent up to dry and had a wonderful sleep in a nice, comfy bed. At breakfast I spent a long time chatting with two other (non-Challenge) guests and then went to the local shop to buy some food for the next few days. Back at the B & B I struggled to get everything into my rucksack, and in the end I left at 10:00 instead of 09:00 as planned. 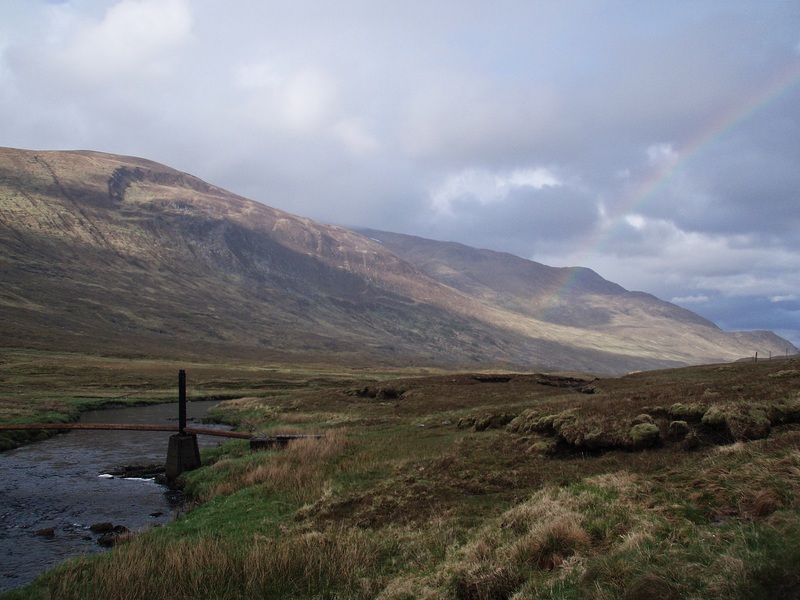 On the road to Coire Choille Farm I noticed two walkers some distance behind me and when I heard them talking I realised it was Markus and Philipp. Soon they fell behind, and instead of waiting for them to catch up I kept walking as we would probably meet at the bothy anyway. 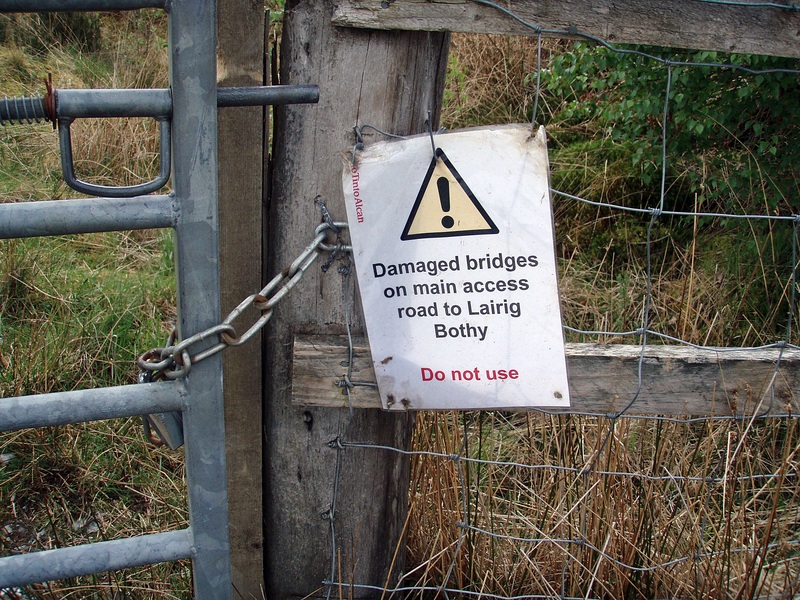 Warning about damaged bridges ahead. 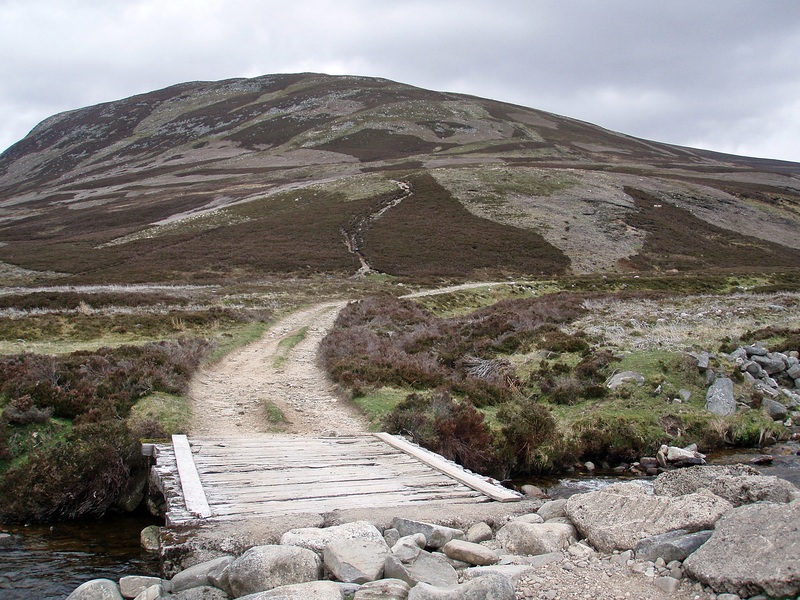 The “Wee Minister” at the start of the Lairig Leacach. 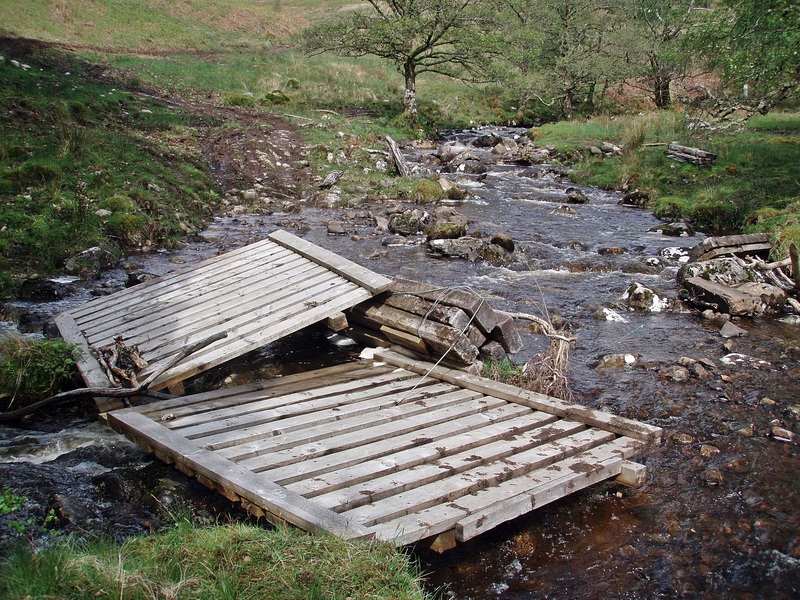 Nothing wrong with this bridge below Cruach Innse, and I didn’t come across any other damaged ones on the way to the bothy. 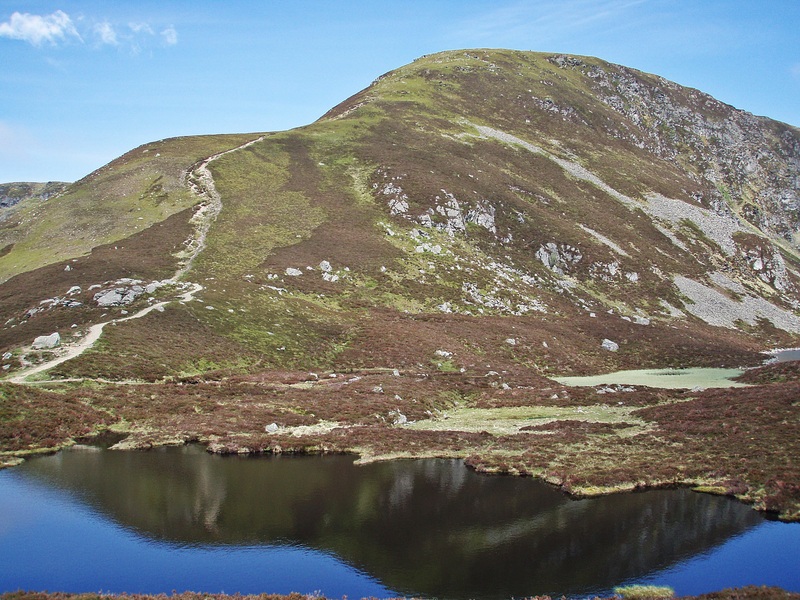 The Munro Top Stob Coire na Ceannain. 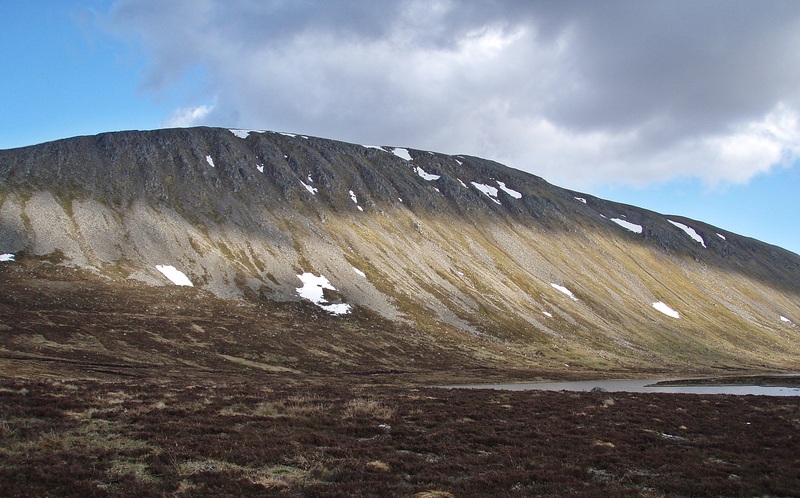 Sgùrr Innse, the more interesting one of the two Corbetts E of the Lairig Leacach. 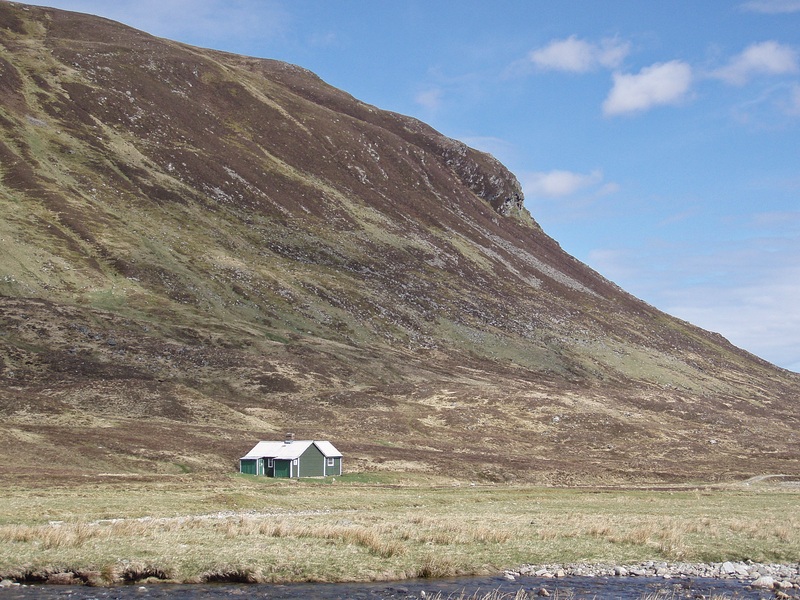 When I arrived at Lairig Leacach Bothy at 13:00 I found Challenger Richard already there, and Markus and Philipp turned up shortly after me. We all had a long lunch break, and I waited until everyone had gone, then checked my right foot which was quite painful, and found that the sore spot was bleeding again. 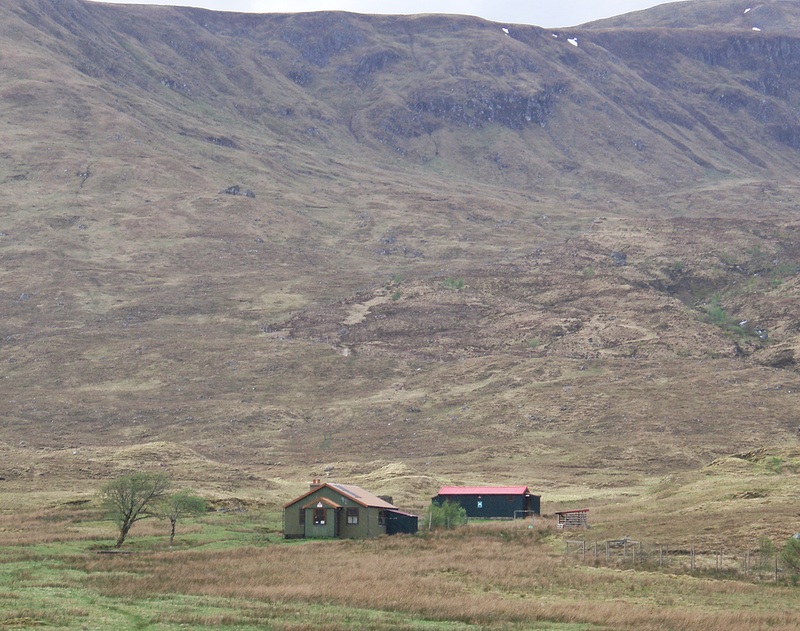 I changed the plaster and left the bothy at around 14:30. 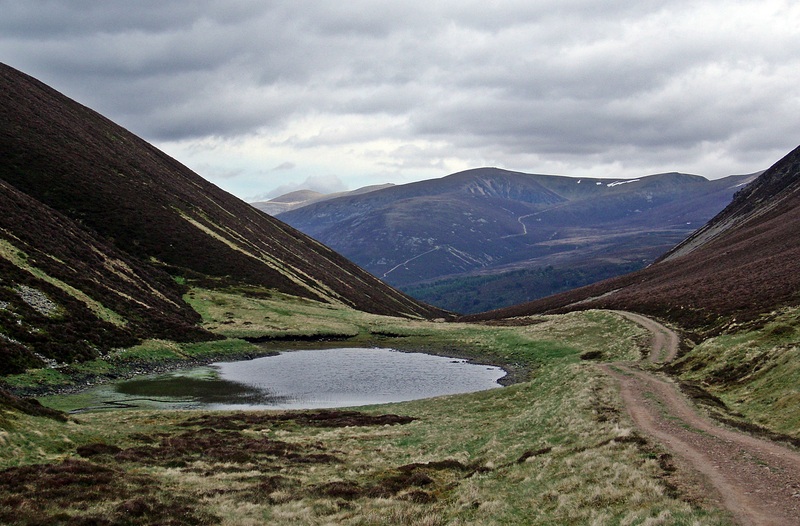 The continuation of the path through the Lairig Leacach was as boggy as ever, and soon it started to drizzle as well. 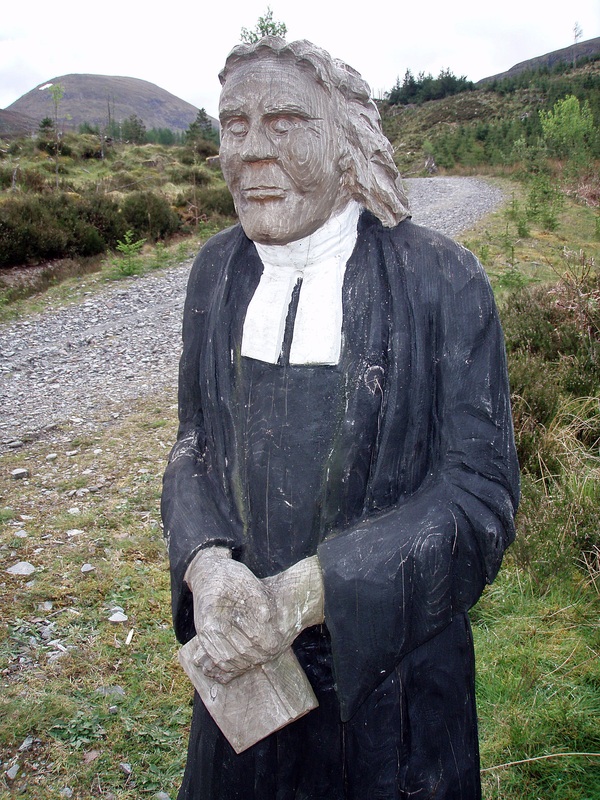 Cruach Innse and Sgùrr Innse. Approaching Loch Treig the weather improved again. 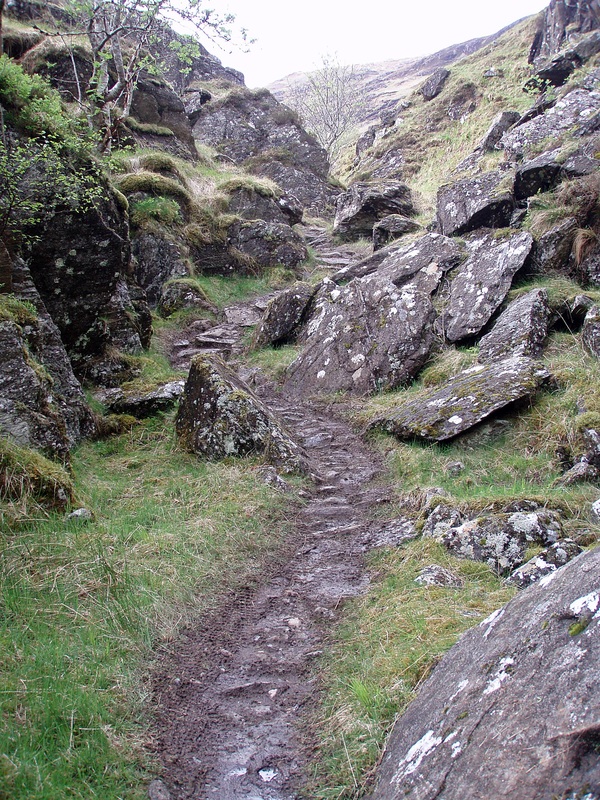 Narrow gorge shortly before Loch Treig. 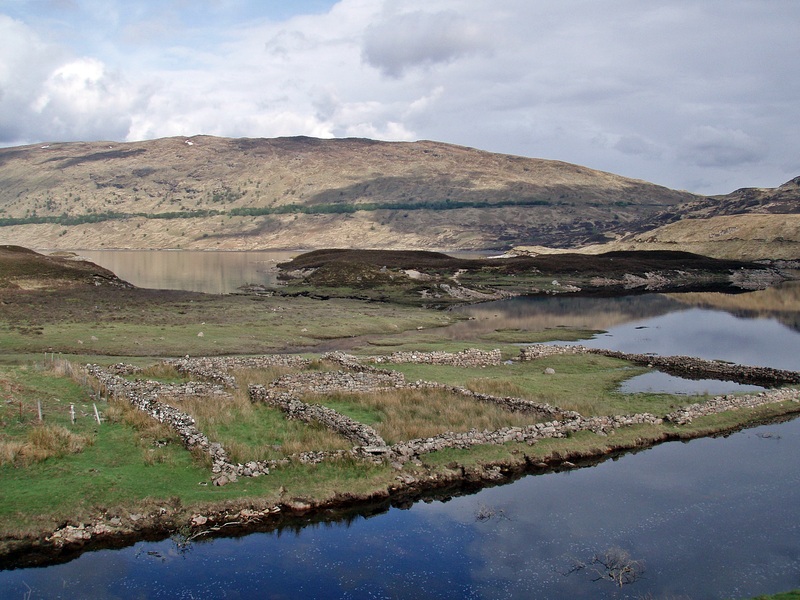 The water level of the loch was low and the sheep pens were visible. 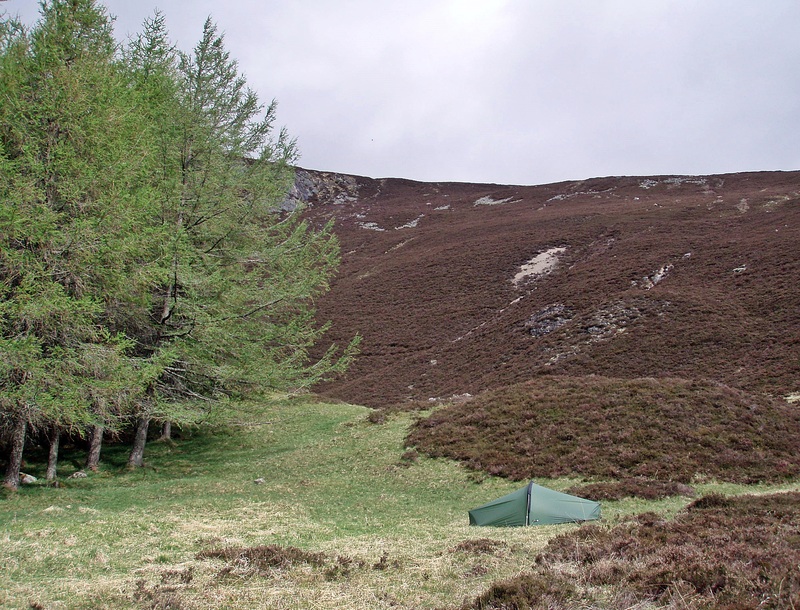 Three tents were already pitched at Creaguaineach Lodge, two belonged to Markus and Philipp, and the other one was David’s who lives at Loch Treig all year round. 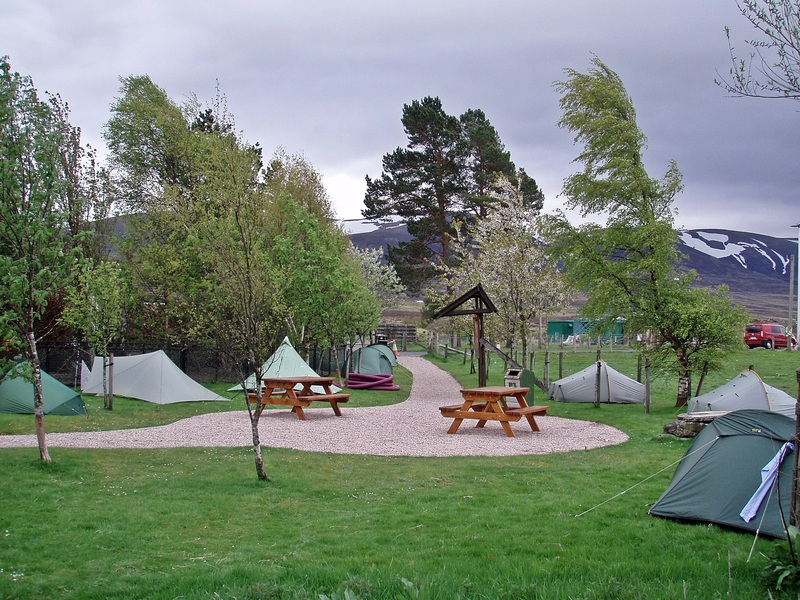 It was interesting to meet David in person as I had seen his tent last September in a different location at the lochside when I was on my way from Glen Nevis to Corrour – I recognised the tent and the trademark clothes line beside it! After a long chat I left at 18:15, I still had a long way to go. 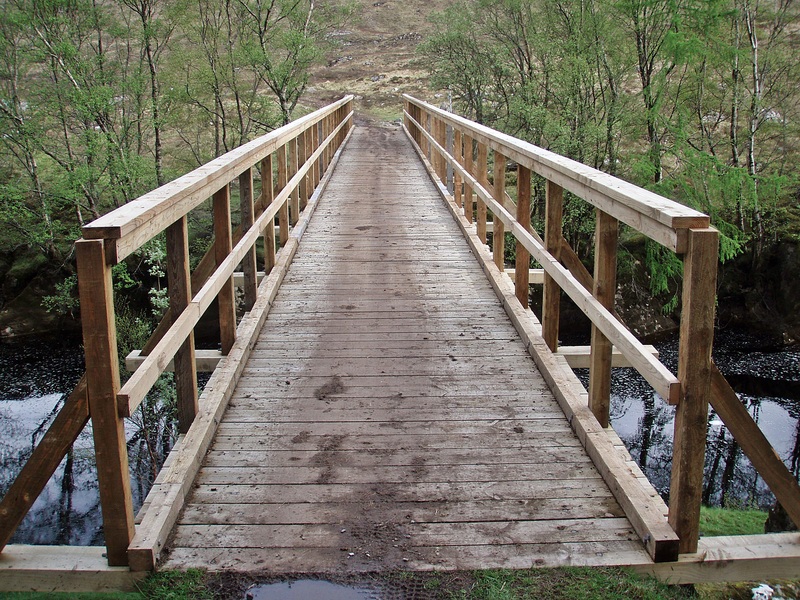 Walking over the bridge across the Abhainn Rath I noticed that a new banister had been attached. Happy campers at Creaguaineach Lodge. 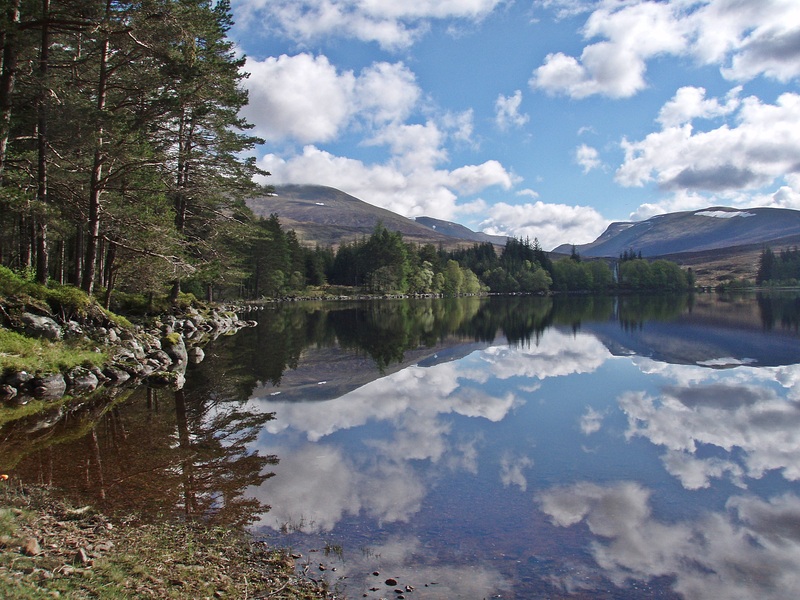 The weather had become very nice and the surface of the loch was smooth like a mirror. 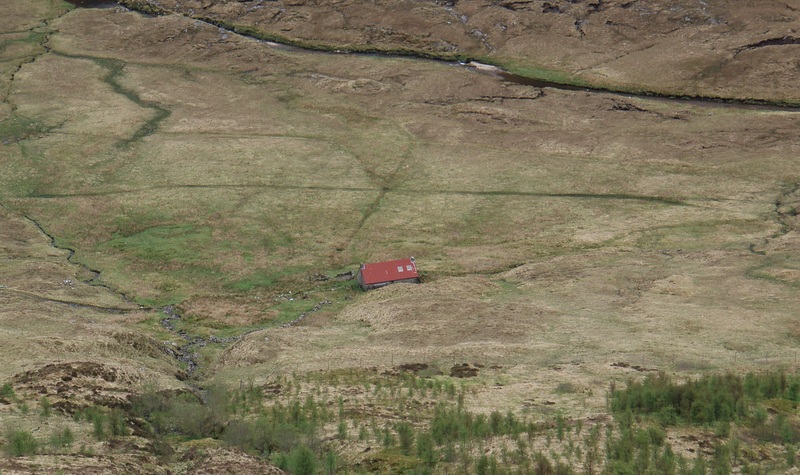 The Graham Creag Ghuanach and Creaguaineach Lodge. 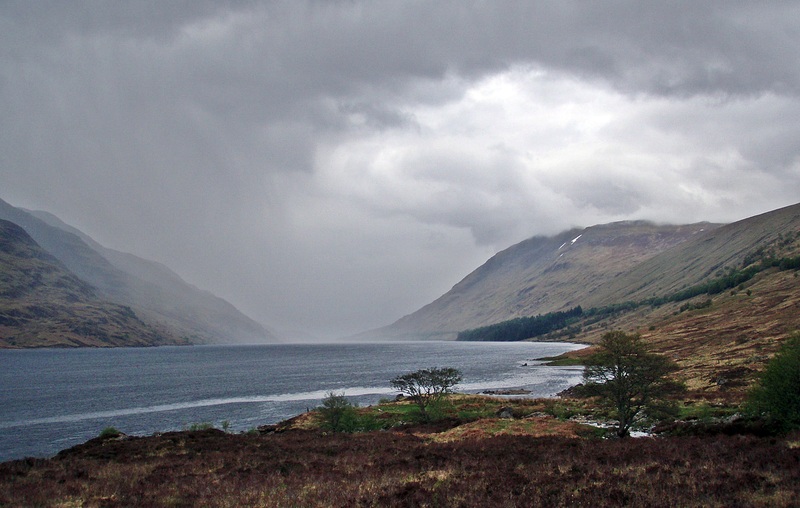 But as I was walking around the S end of the loch, the weather suddenly changed. Dark clouds accumulated and the wind picked up, and soon afterwards it started to rain. 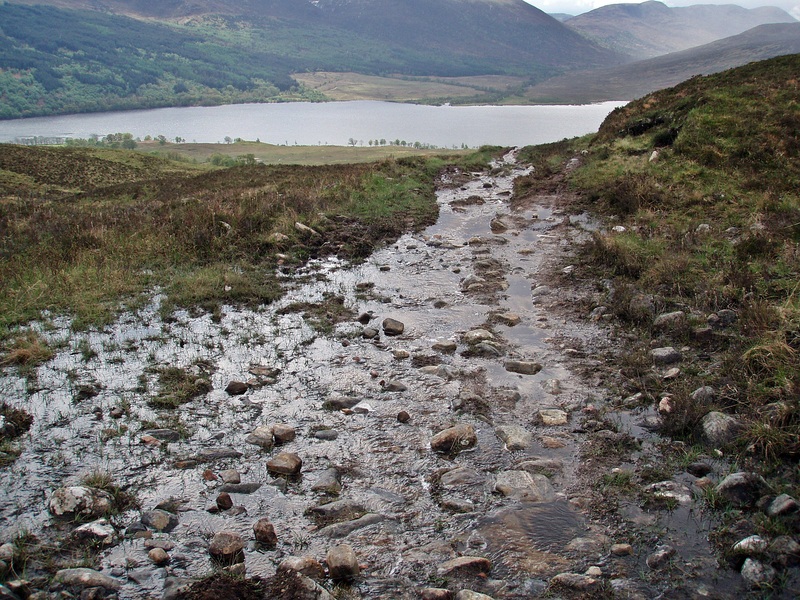 Due to the building of a new hydro scheme the tracks around Loch Treig and Loch Ossian have been “improved”, and I found the surface consisting of large, rough stones awkward and painful to walk on. Near the railway bridge I met Richard again, he had pitched his tent by the ruins beside the track. 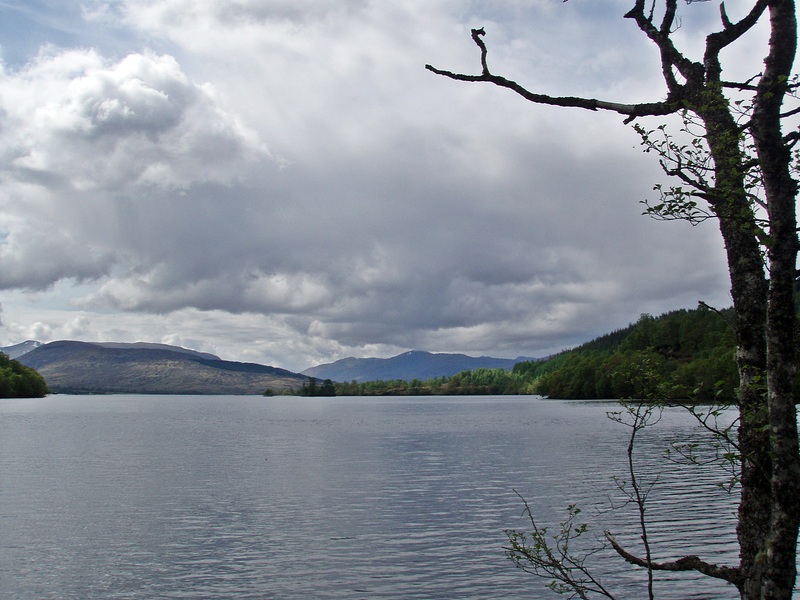 On my way through the forest on the N bank of Loch Ossian the rain became heavier, and I was glad when I reached the camp site I had sussed out during a mountain bike trip back in March, cycling in from Loch Laggan. 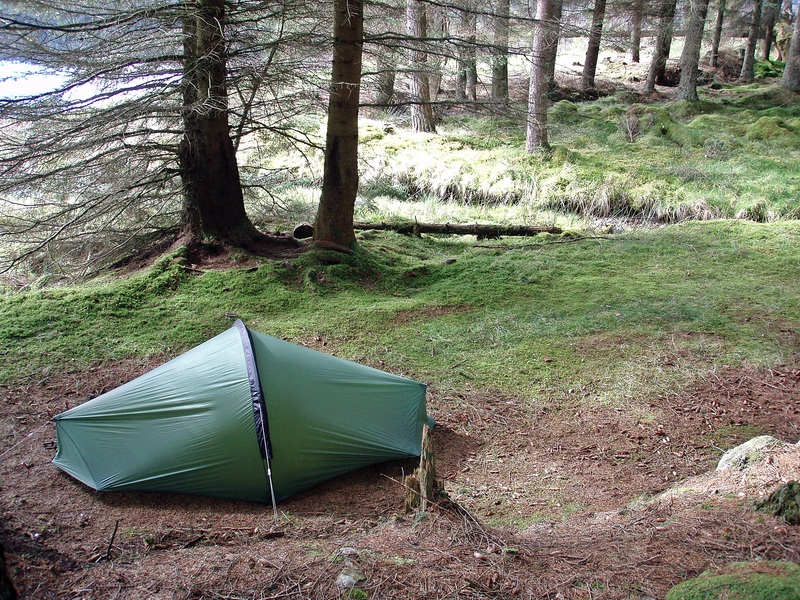 It was nice and sheltered under some dense trees, and my tent stayed almost completely dry. I was struggling to get the tent pegs into the ground, but in that location it was windless so it didn’t matter. The good thing was that my tent was not visible from the road although it was very close to it. 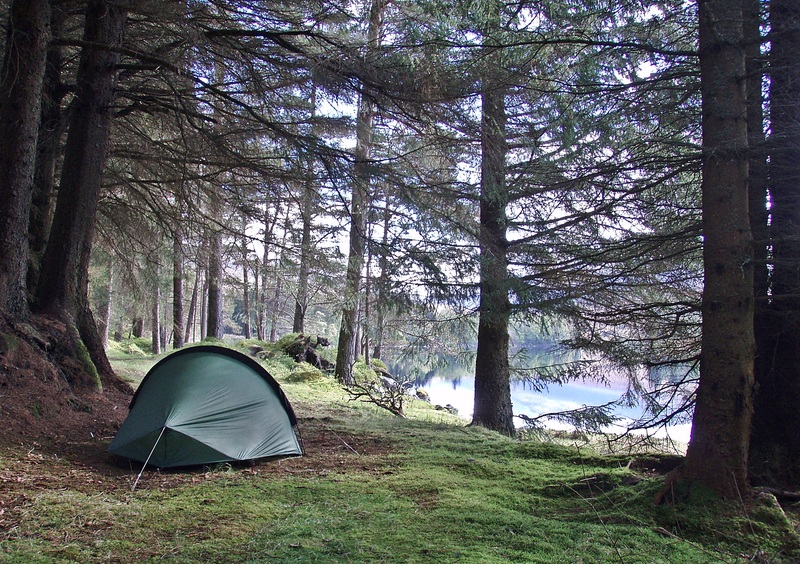 This would have been my camp site if it had not been raining – a nice flat patch of grass right on the banks of Loch Ossian. The one I had used had not been bad either, the only thing missing were the views. 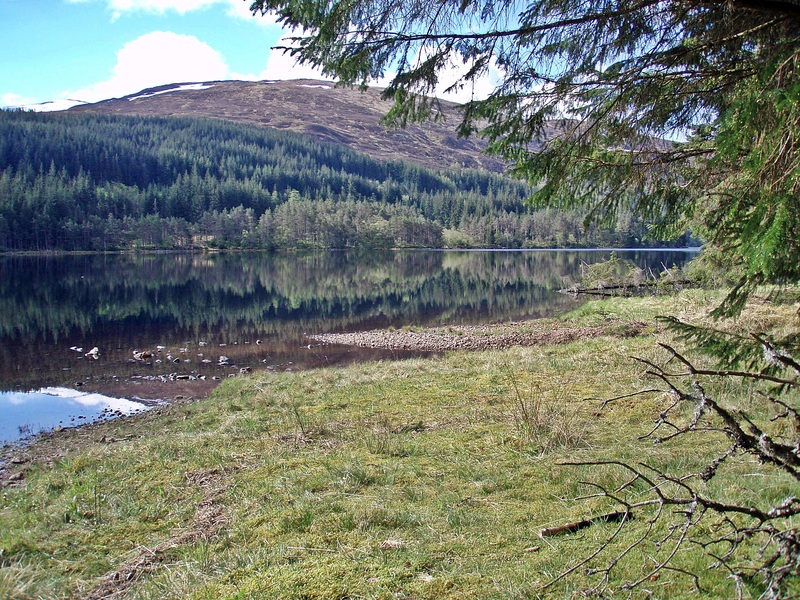 But just a few steps away from my tent I got this wonderful view of Loch Ossian. It was great to wake up to what promised to be a gorgeous day, it felt already warm in the sun and I put suncream on my arms before I left. 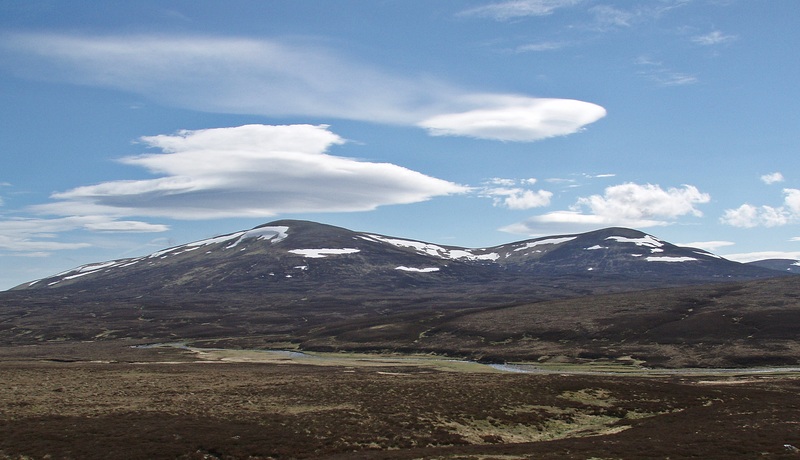 If the weather stayed like this, I would be able to climb the two Munros Ben Alder and Beinn Bheòil as planned! 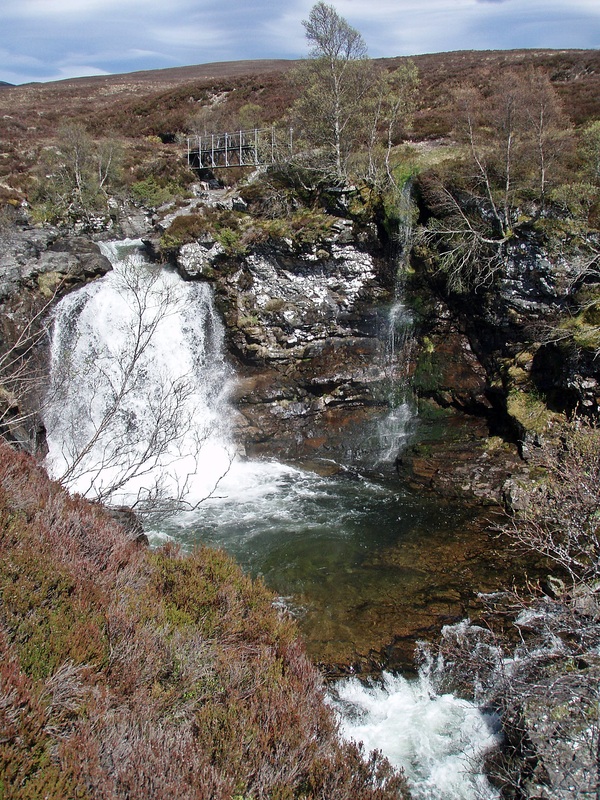 There had been signs around Loch Treig and Loch Ossian explaining that a new hydro scheme was being built and what changes visitors should expect. Walking past Corrour Shooting Lodge I could see the progress of the major construction works that I had first encountered during my last visit here in March. 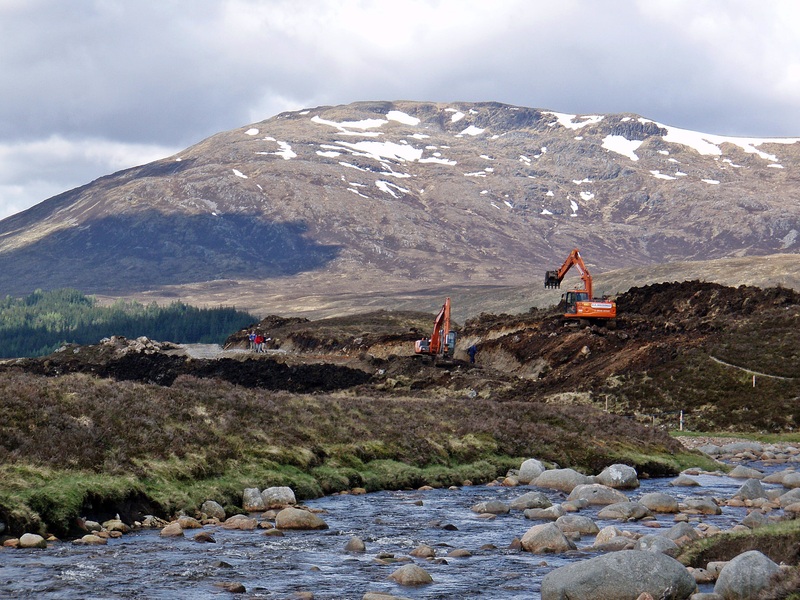 A vehicle track leading from the Lodge up the Uisge Labhair was being built, and I was stopped at the footbridge and given instructions about how to pass the building site safely. 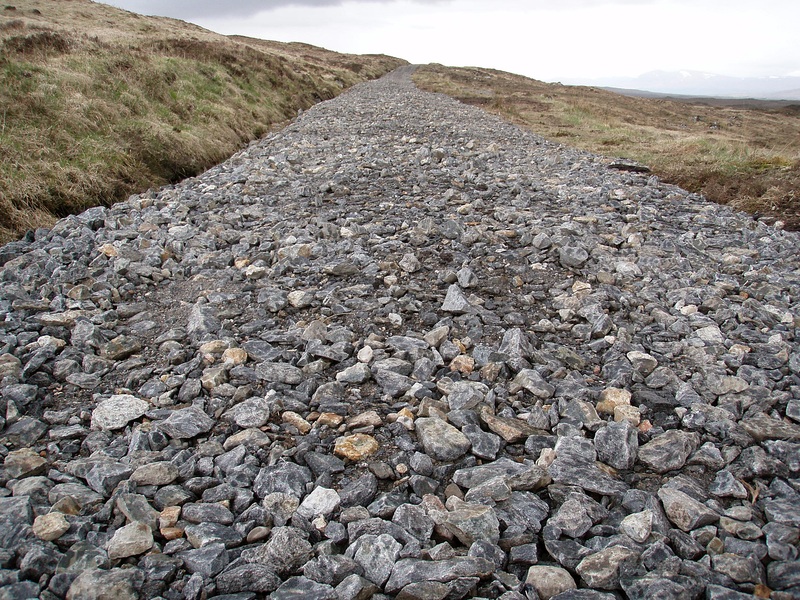 I was told to stay on the newly built track where there would be some heavy machinery after about 1200 metres. Two diggers were at work and I had to wait five minutes, then one of the operators stopped, flattened the ground with the bucket of the digger and let me walk past. The ground was still very soft and I sank in to my ankles, but I was glad I was allowed through without having to make a detour. 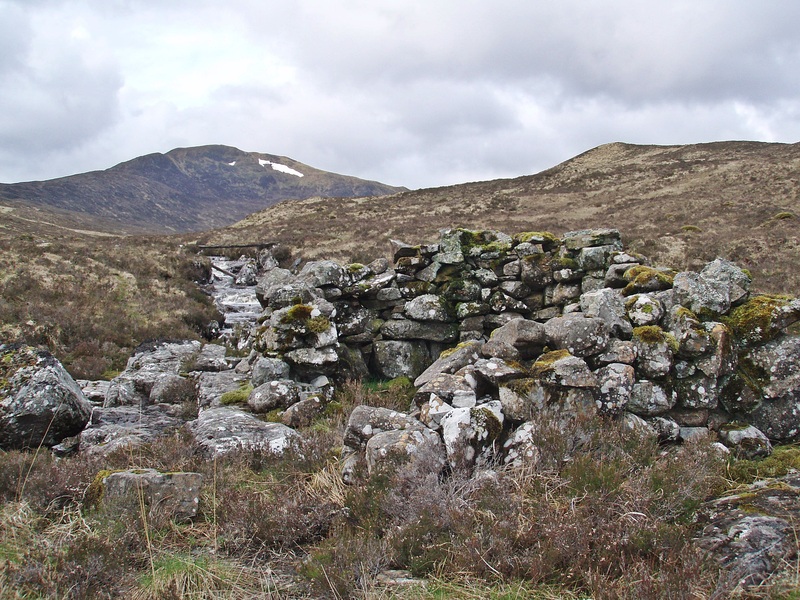 After this, I strangely enjoyed to be on the usual boggy path along the Uisge Labhair again, and to leave the signs of civilisation behind! 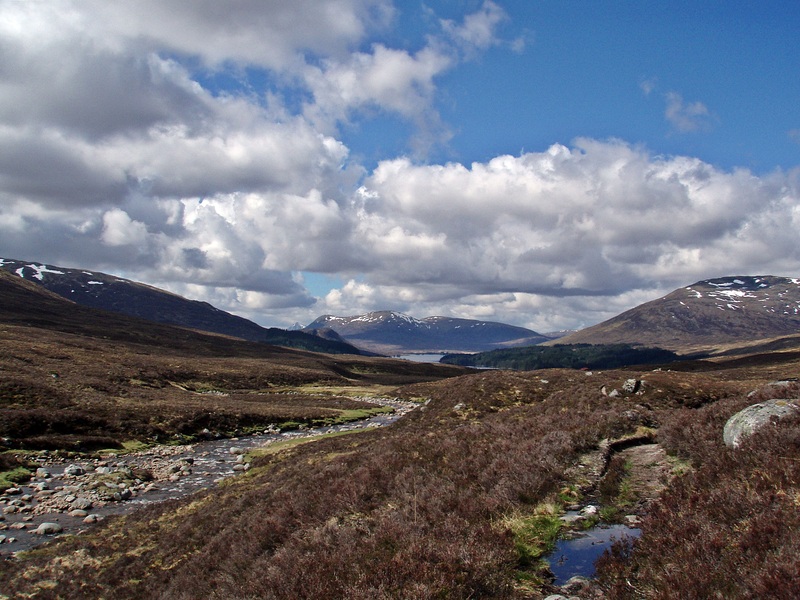 Looking back to Loch Ossian. 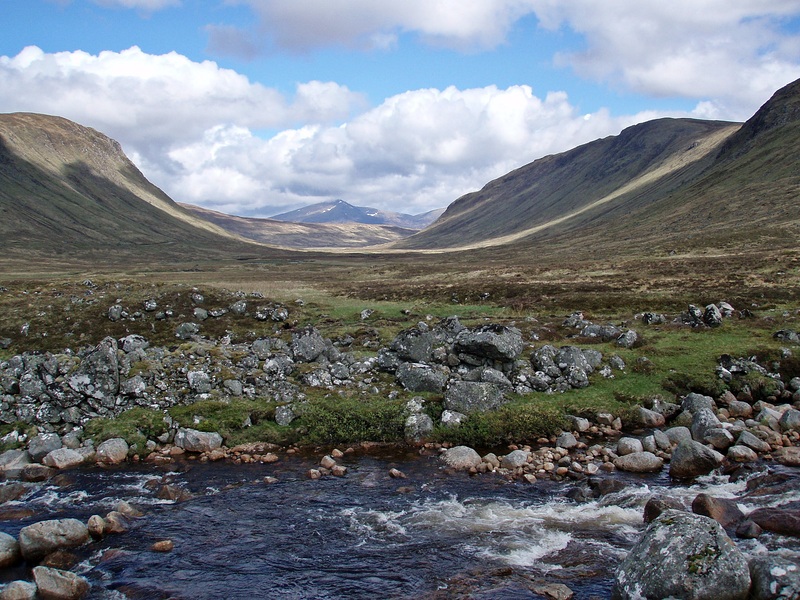 Walking towards the Bealach Dubh there are plenty of nice camp spots on both sides of the river. 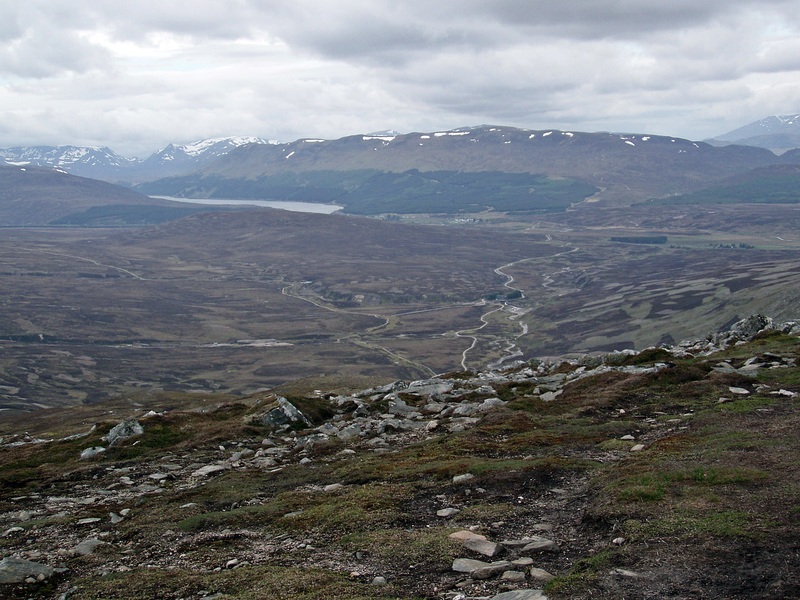 I forded the Uisge Labhair and climbed up to the path from where I was going to ascend the W ridge of Ben Alder. 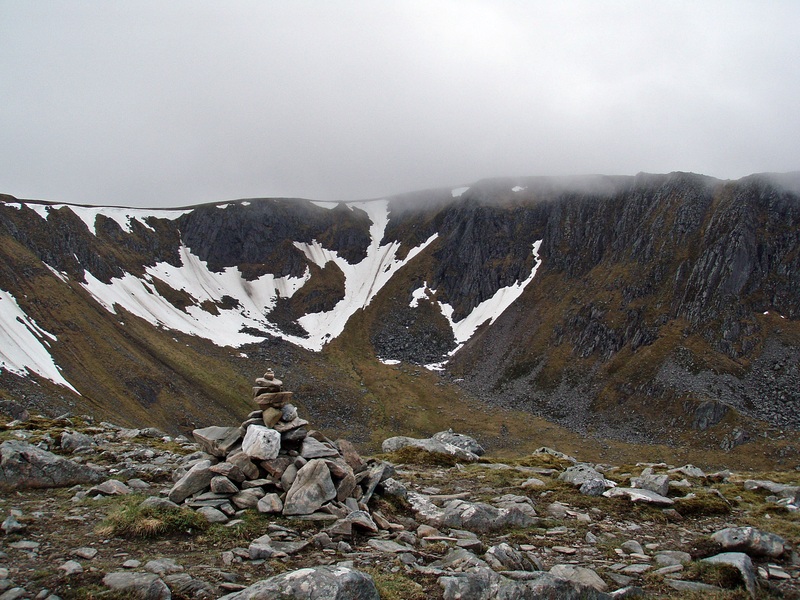 Aonach Beag and Geal-Chàrn above Coire a’ Chàrra Bhig. 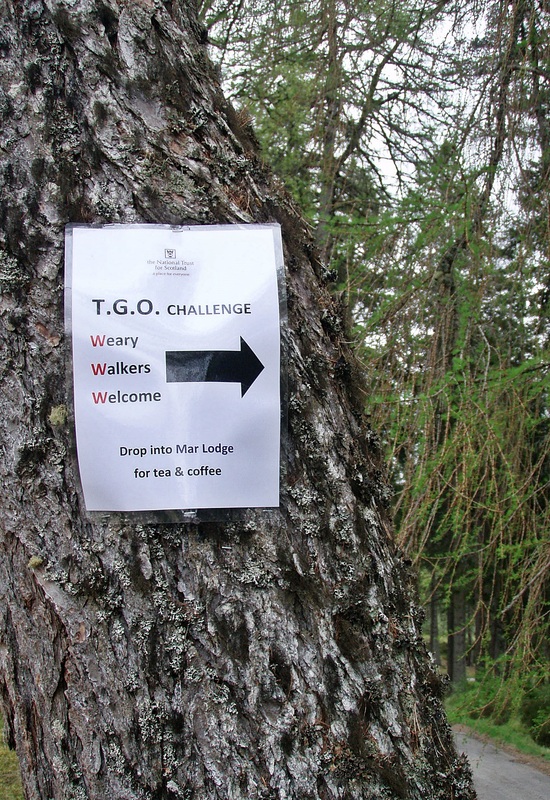 I was caught up by Challenger “Mole” who I had first met during TGOC 2011, and who was also planning to climb Ben Alder. He stopped for a lunch break on the path while I started the ascent. 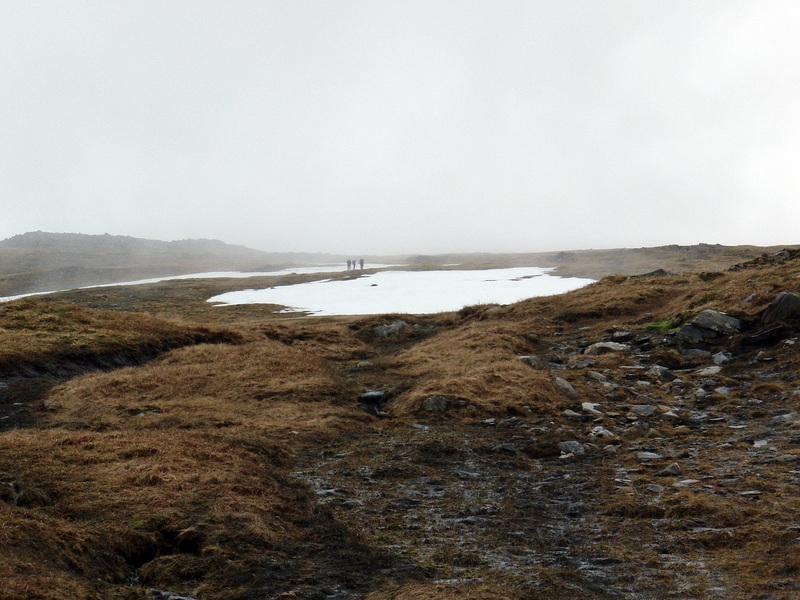 The terrain wasn’t too steep, it was mainly covered with grass and moss and I could walk around most of the snow patches. 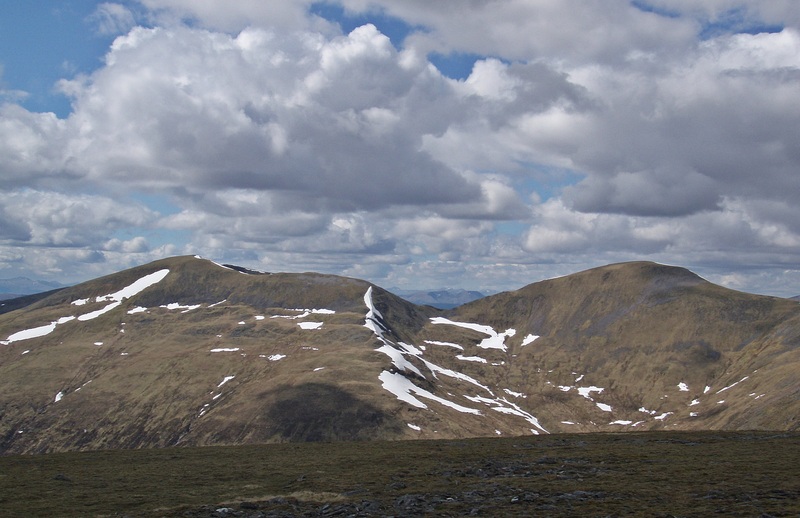 View SW to the Munros Carn Dearg and Sgòr Gaibhre – Mole had walked along this whole ridge in the morning…! 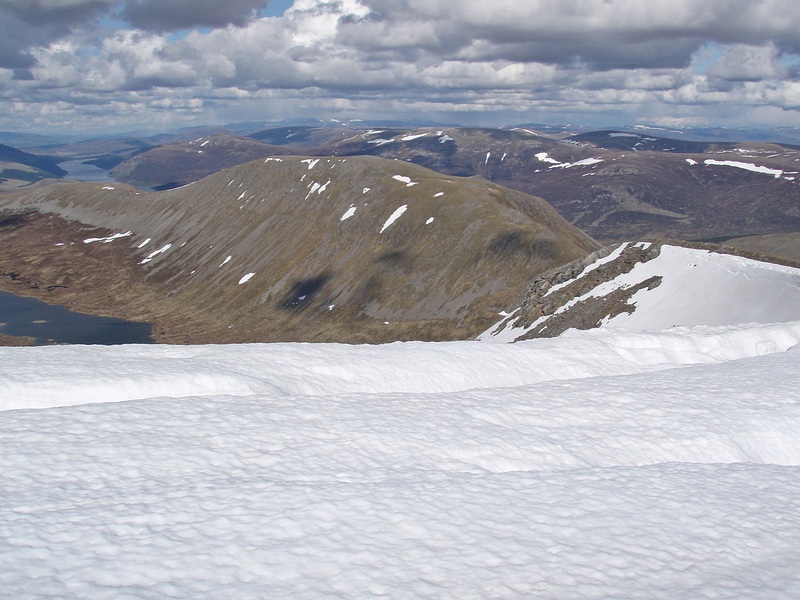 Soon he arrived on the slope behind me and took a more direct route upwards while I made a detour to the edge of the crags to look down to Loch Ericht. 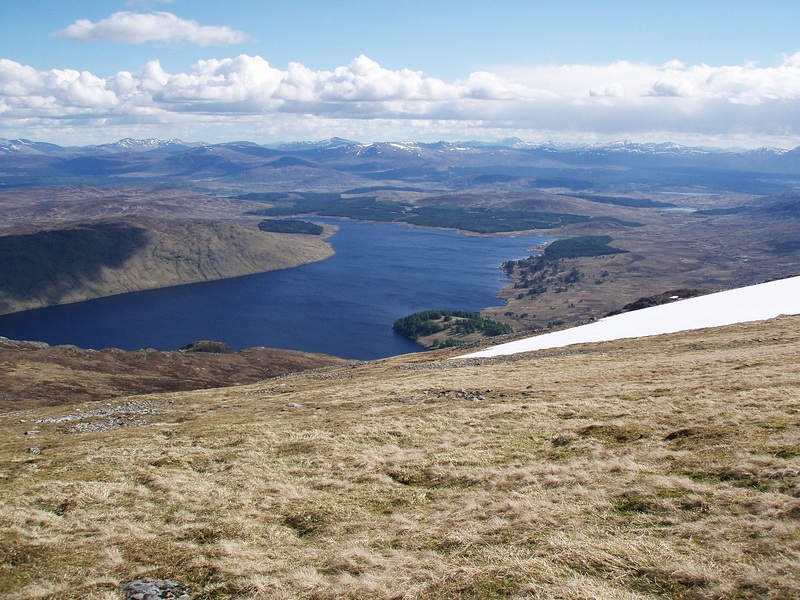 Loch Ossian behind Beinn a’ Chumhainn. 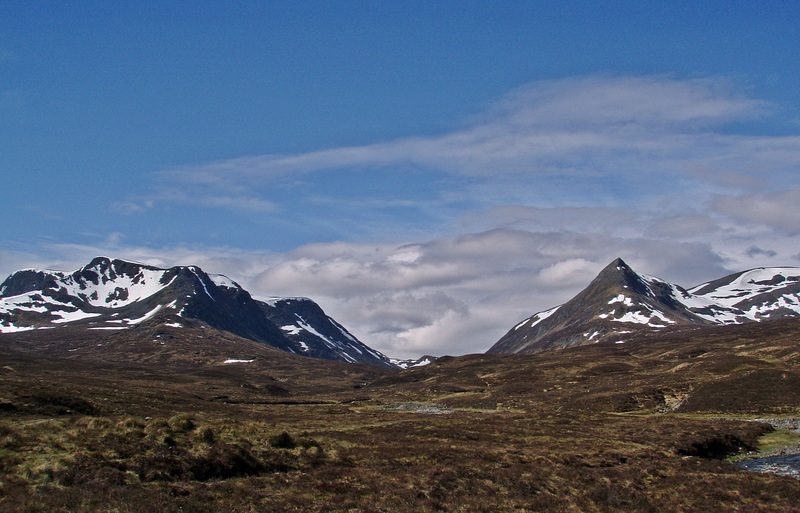 Beinn Eibhinn and Aonach Beag. On the plateau it was very windy and cold in spite of the sun, and in hindsight I should have stopped and put an extra layer on. 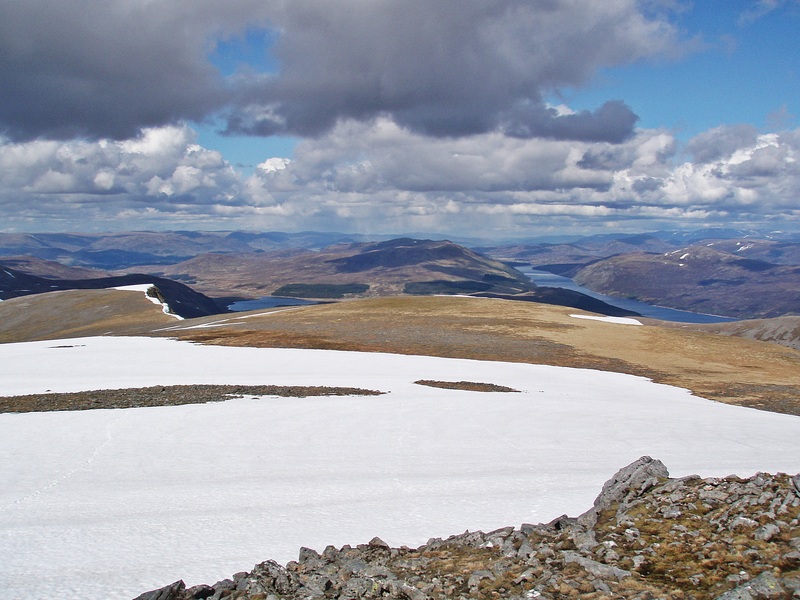 But I was overwhelmed by the amazing views all around and couldn’t wait to get to the summit. 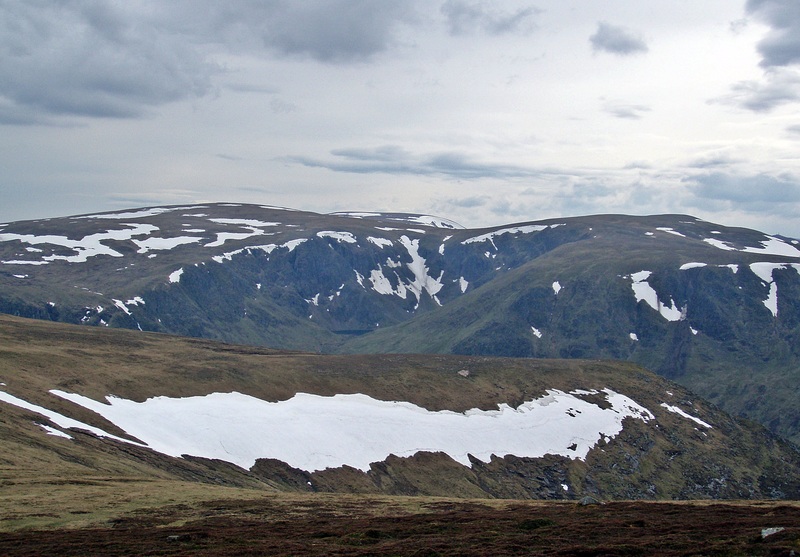 Sgòr Iutharn seen across the Bealach Dubh. 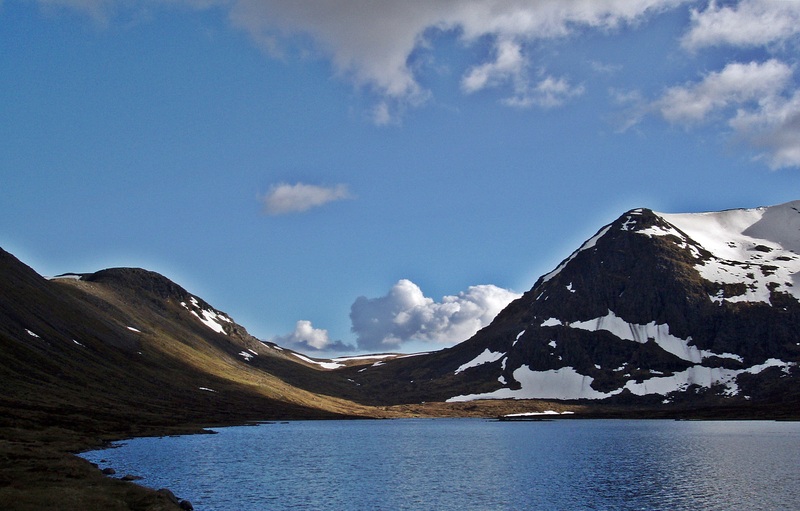 Loch Pattack and Loch Ericht in the distance. 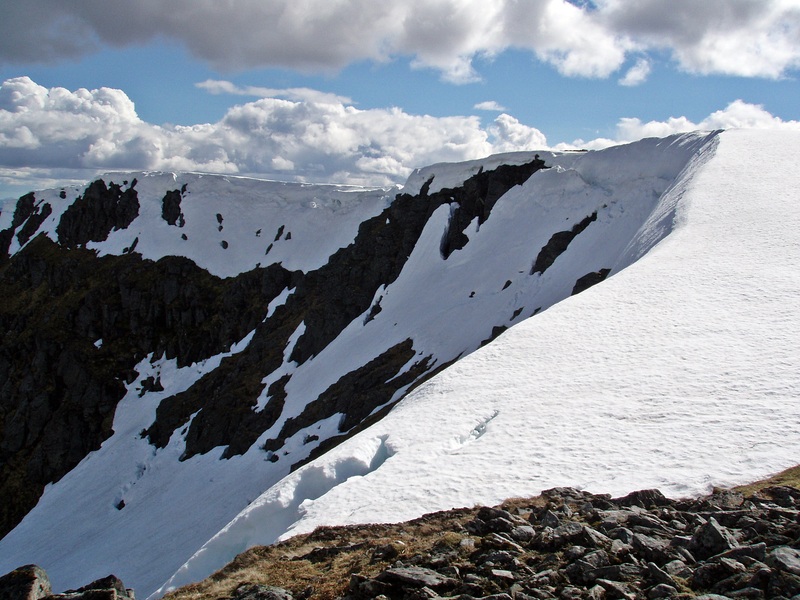 I continued around the edge of the cliffs, staying well clear of the huge cornices. 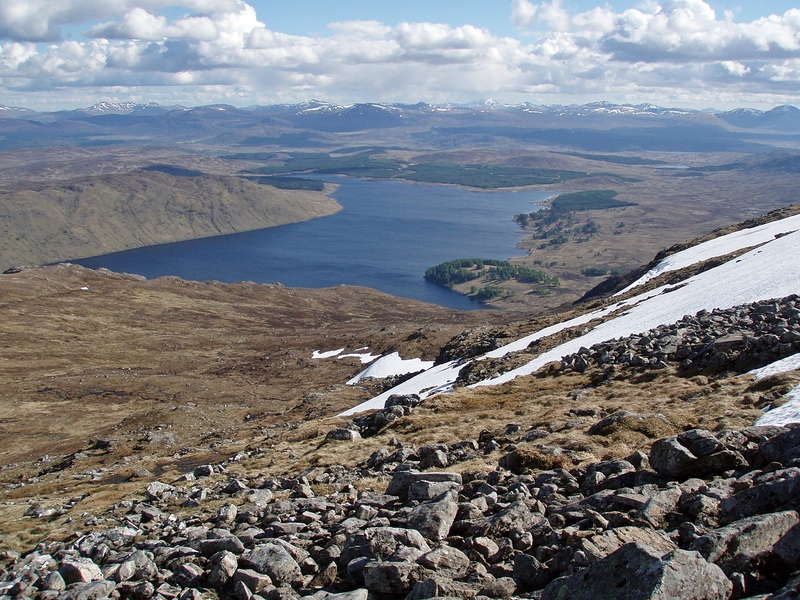 Loch a’ Bhealaich Bheithe and Beinn Bheòil. 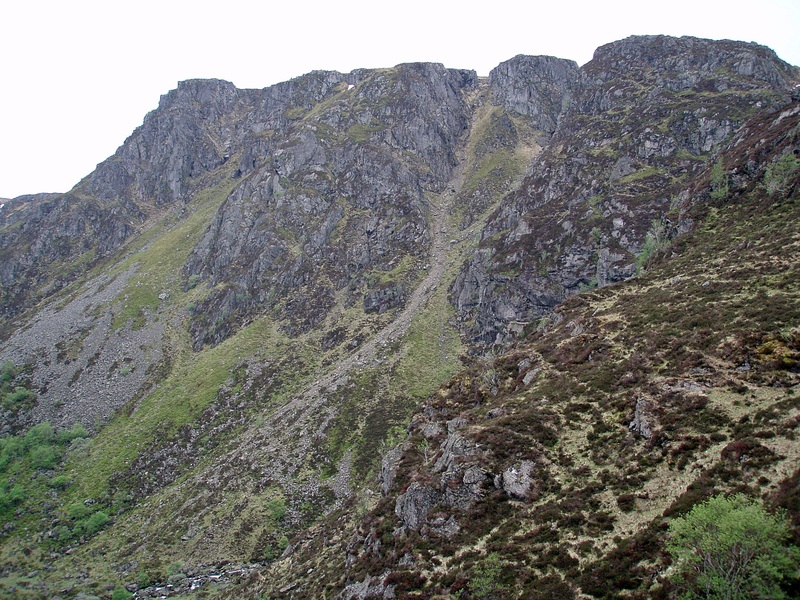 I was aware of the steep cliffs below Sròn Bealach Beithe and that I had to walk SSW for a few hundred metres to reach easier ground. 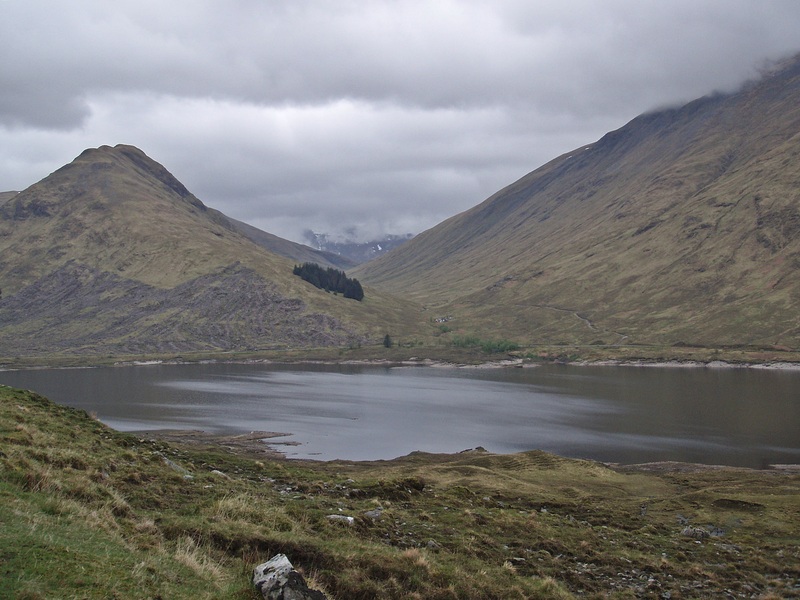 At first I made good progress on the grassy slope, enjoying the good views across Loch Ericht and Alder Bay. 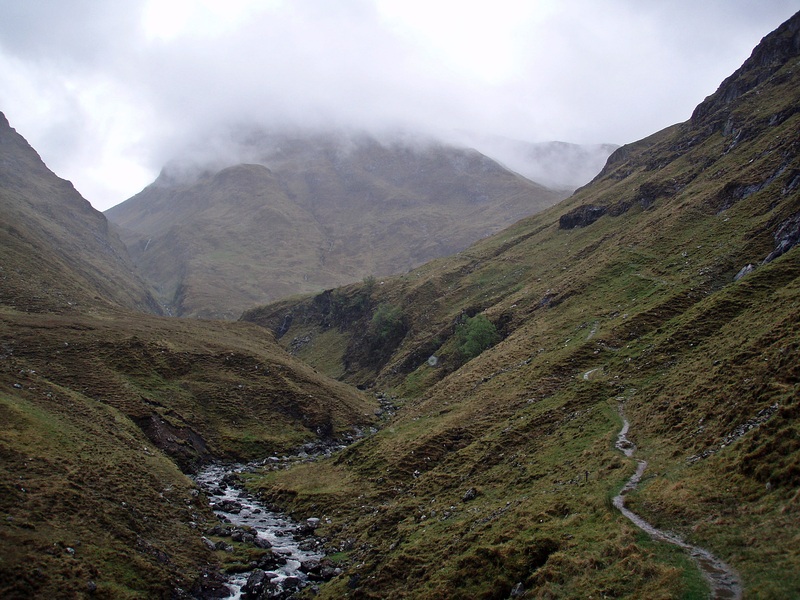 My first thought was that I would have to walk all the way back and descend to the Bealach Dubh. 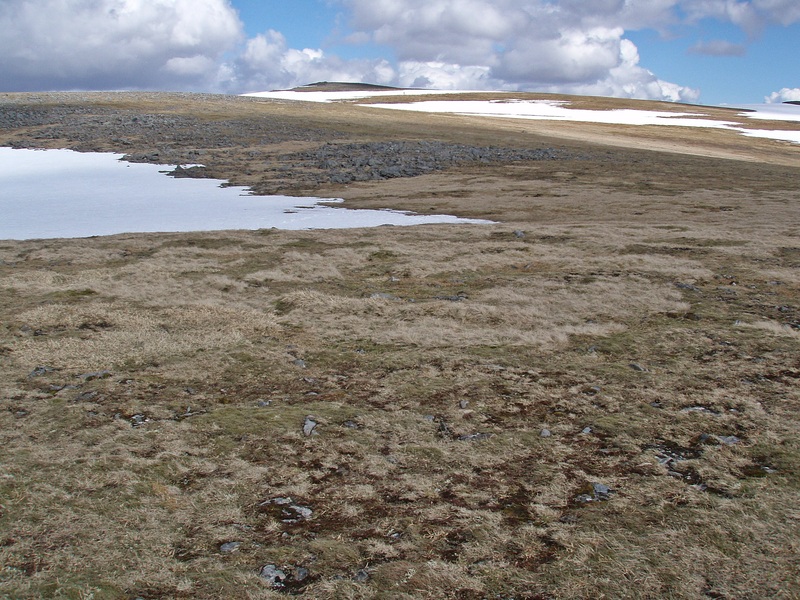 But while I was standing above the snow patch and contemplating my options, I suddenly noticed Mole way below, he was waving and pointing to my left with his trekking pole. If he had made it down safely, then surely I could manage it as well? I waved back to signal that I had understood, and made my way carefully to the left. 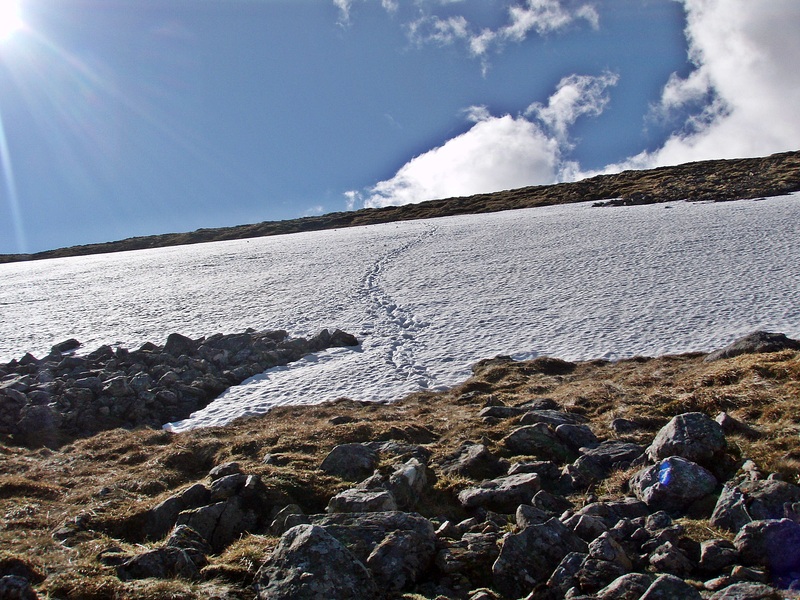 There I found a line of footprints which I thought were his, so I made an attempt to descend along that line. 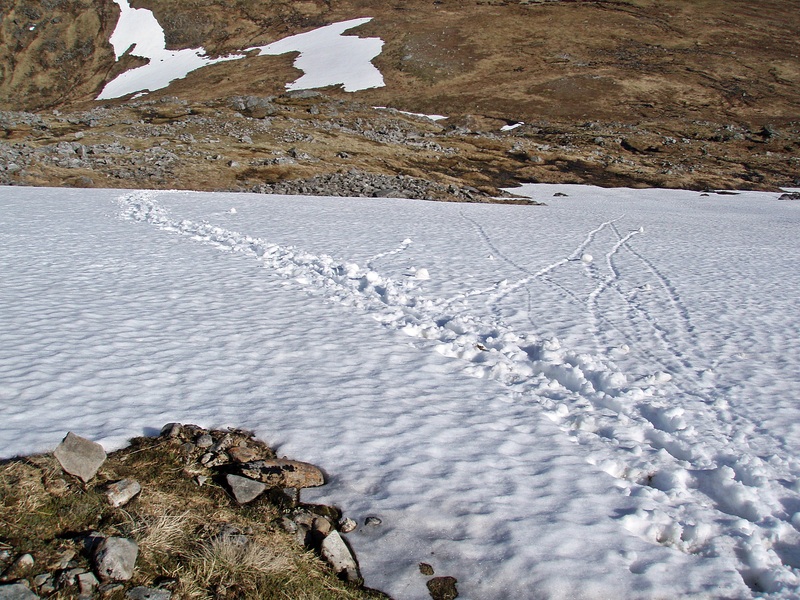 But as soon as I made the first step, I started slipping on the soft snow and stepped quickly back onto solid ground. The slope looked almost vertical from above and the only things that would stop a slide would be the rocks at the bottom – no way I was going down there! 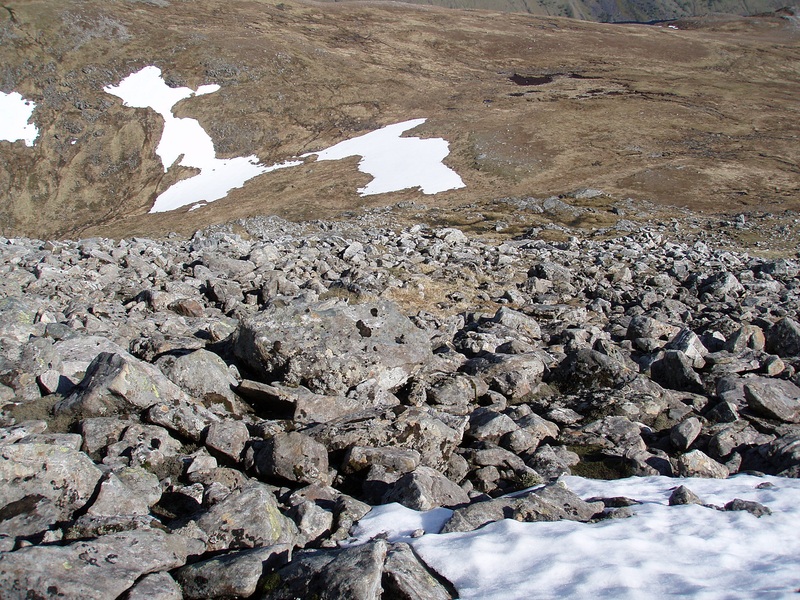 I walked along the upper edge of the snow patch until I reached the rocky section to the left of it. This wouldn’t normally be my choice of descent, but in this case it seemed to be the safer option. Very slowly I made my way down the boulders, mostly not in an upright position but bum sliding or lowering myself from one rock to the next. 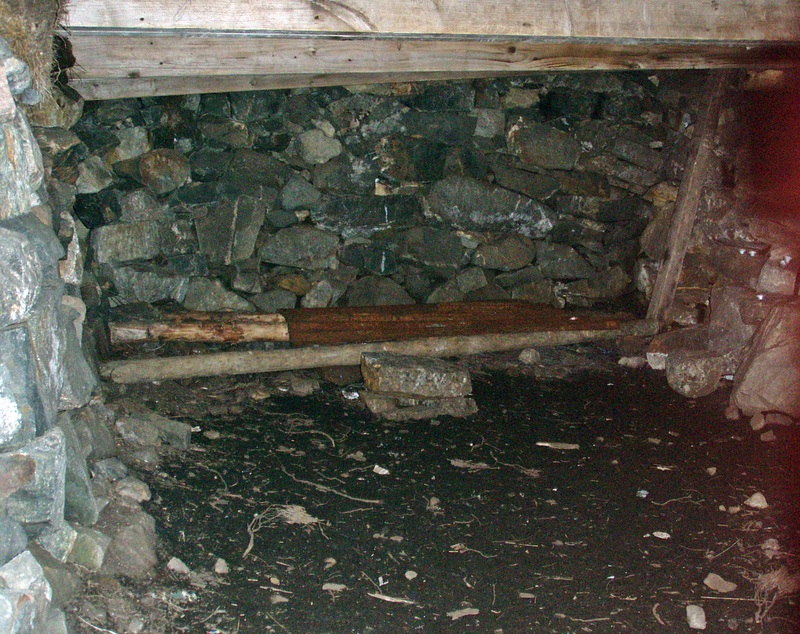 Even this was quite scary in places as some of the larger rocks were unstable and moved when I stepped on them. 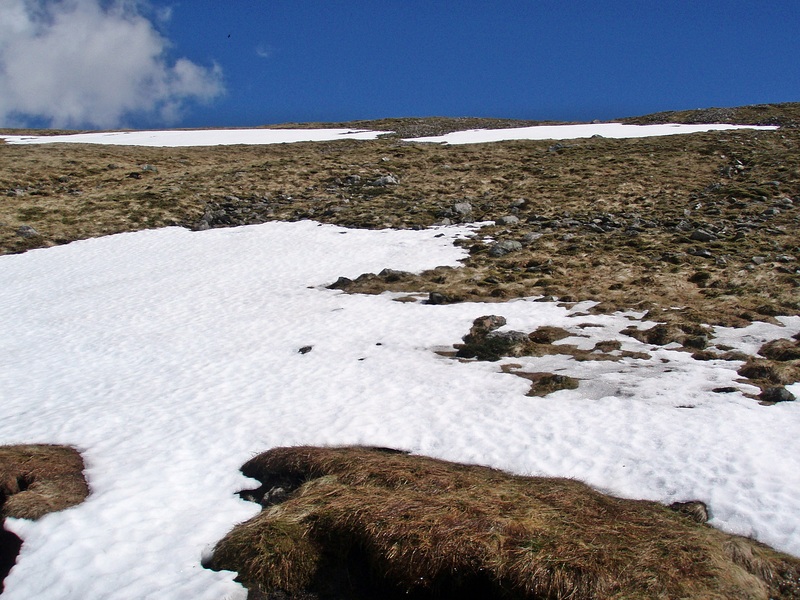 After what seemed like an eternity I reached safer ground below the snow. Looking back up I wondered how anyone could possibly have descended this way? 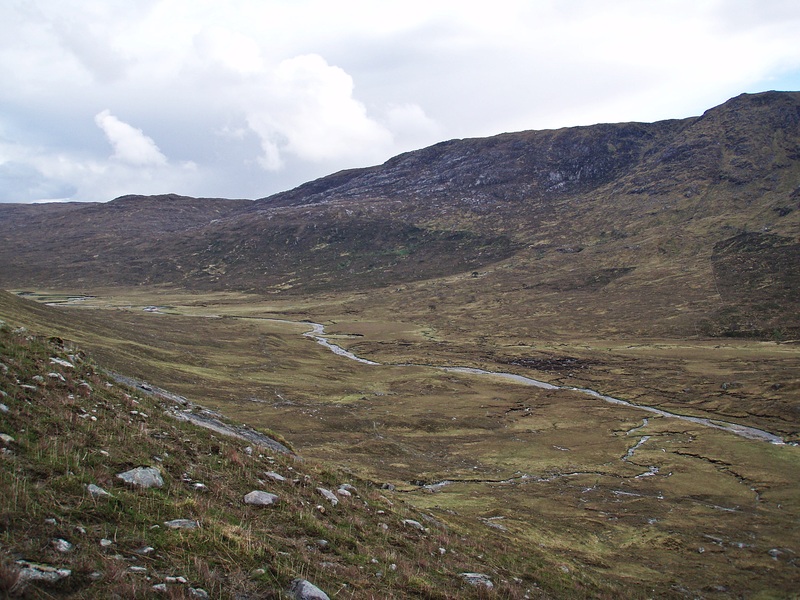 When I finally reached the bealach it was already after 17:00 and I felt not only physically but also mentally exhausted after having to concentrate so hard on every move of the difficult descent. 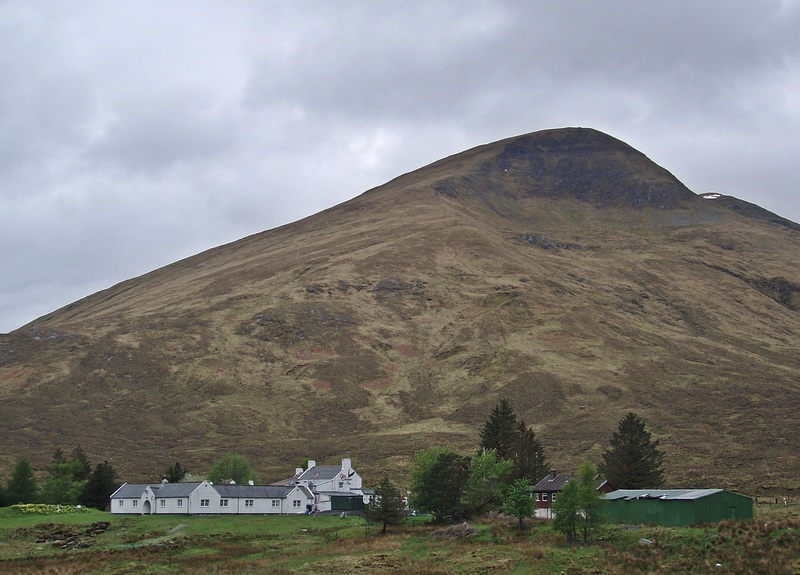 I had planned to climb Beinn Bheòil as well, but now I didn’t have much energy left and it was getting too late anyway, so I decided against it. At the S end of Loch a’ Bhealaich Bheithe I met Mole again who was putting up his tent. It turned out that the footprints I had seen were not his, and he had also walked around the snow. 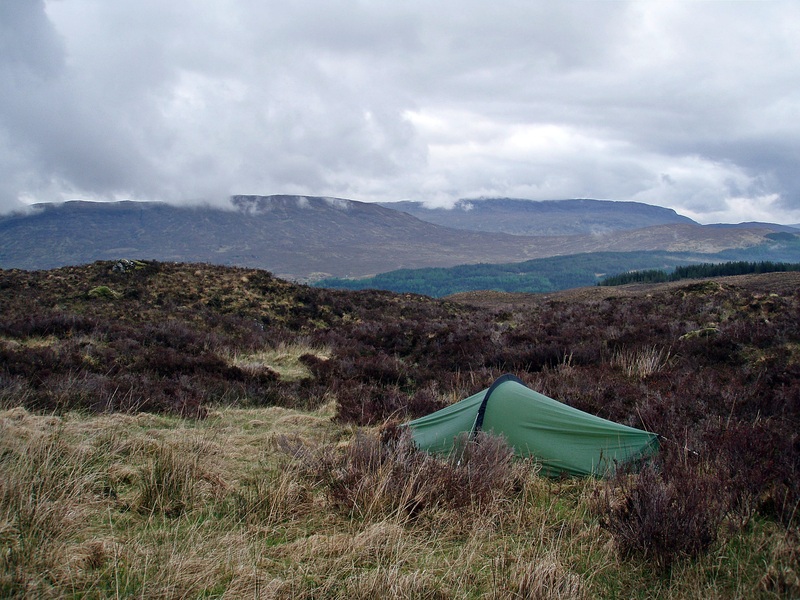 We had an interesting conversation, mainly about tents and other gear, but after a while I started freezing as the location at the head of the loch acted like a wind funnel. I said my goodbyes and continued on the path towards Culra. 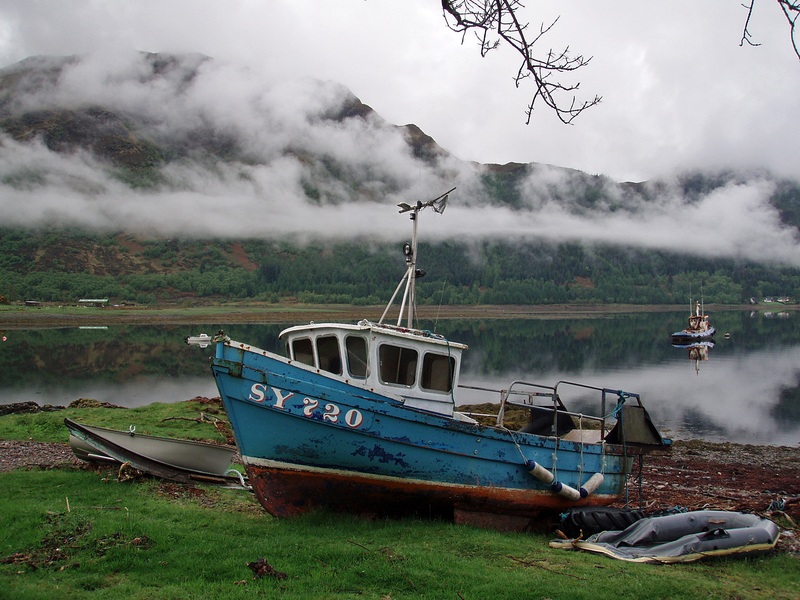 Loch Pattack and The Fara. 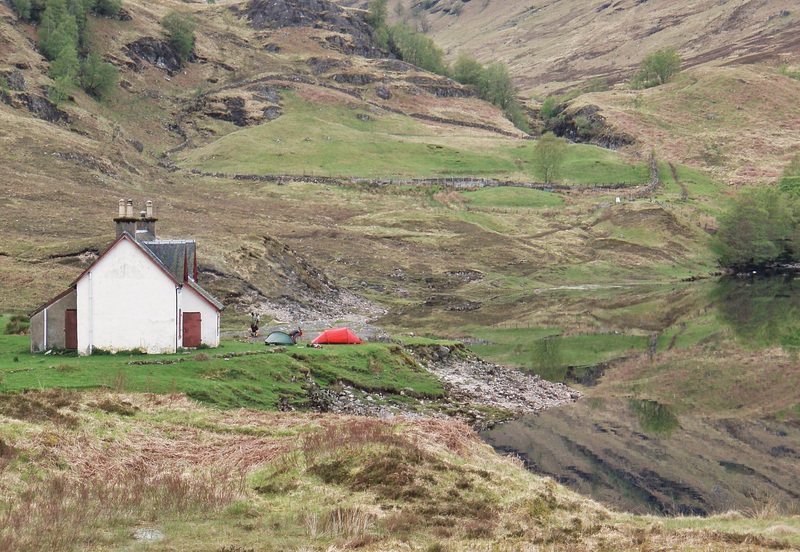 I saw several tents pitched by Culra Bothy and I had planned to stay there as well. But now I felt tired and cold, and all I wanted was to put up my tent, get into warm clothes and my sleeping bag and have dinner. Chatting to the other campers would have delayed all this, and so I camped around a kilometre upstream from Culra. I did feel slightly unsociable for not joining the others, but I would probably meet most of them in Dalwhinnie the next day anyway. Although I could have done with a little less excitement it had been a fantastic day and the highlight of the Challenge so far – this would be hard to beat! I woke up with puffy eyes, a sore throat and generally feeling unwell, and I thought I might be coming down with a cold. I had a few Strepsils lozenges in my First Aid Kit but they would only last me a couple of days, and I also took some Paracetamol with my breakfast. It was already 10:30 when I was finally ready to go, but it didn’t matter as I only had a short day ahead of me. 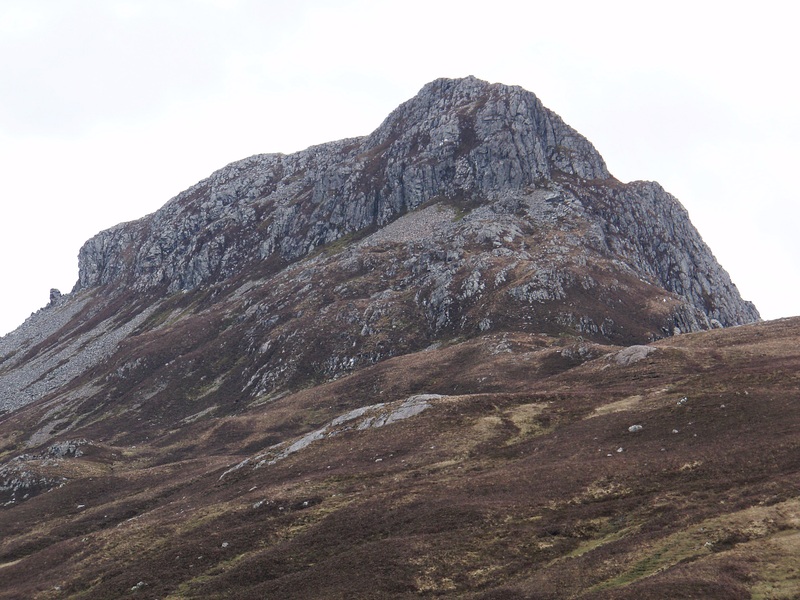 The Corbett The Fara which I had planned to climb today would still be there another time. 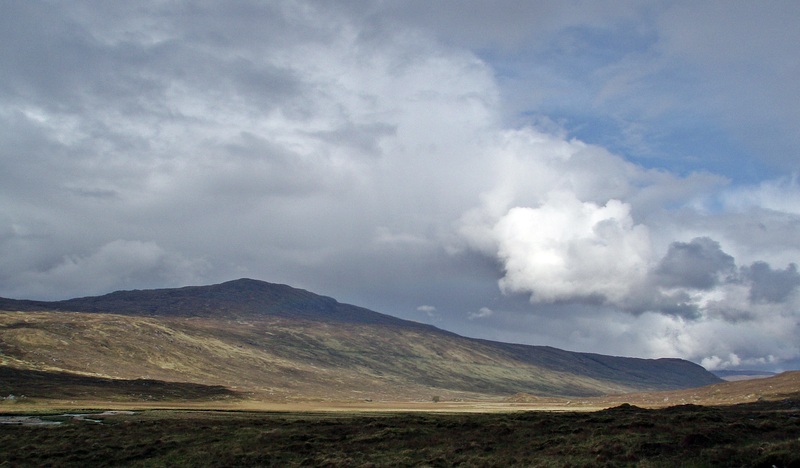 The day had started a bit dull but later it cleared and when I looked back, Ben Alder and Sgòr Iutharn looked great under a blue sky. 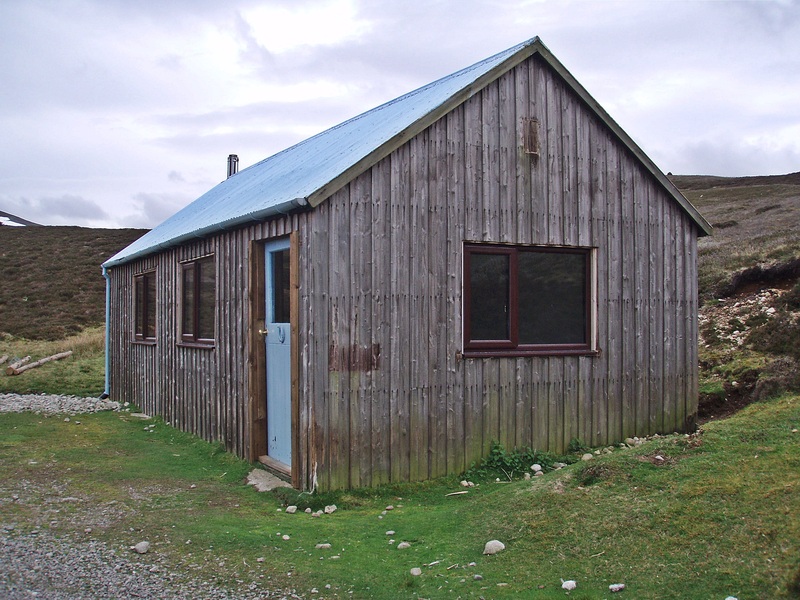 Culra Bothy had been officially closed in March because asbestos had been found in its walls but it was left unlocked and could still be used in an emergency. The tents I had seen pitched around it last night had all gone by now. 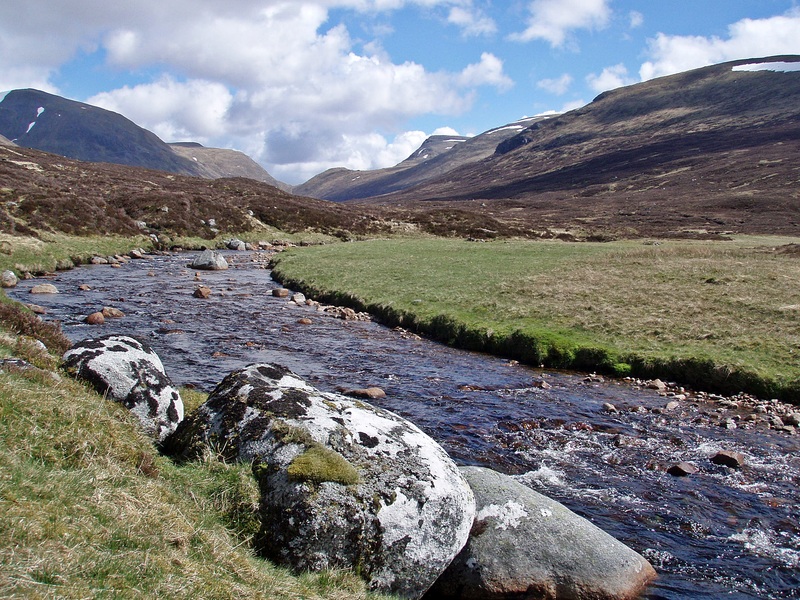 I passed a few more good camp spots by the Allt a’ Chaoil-rèidhe near Loch Pattack. 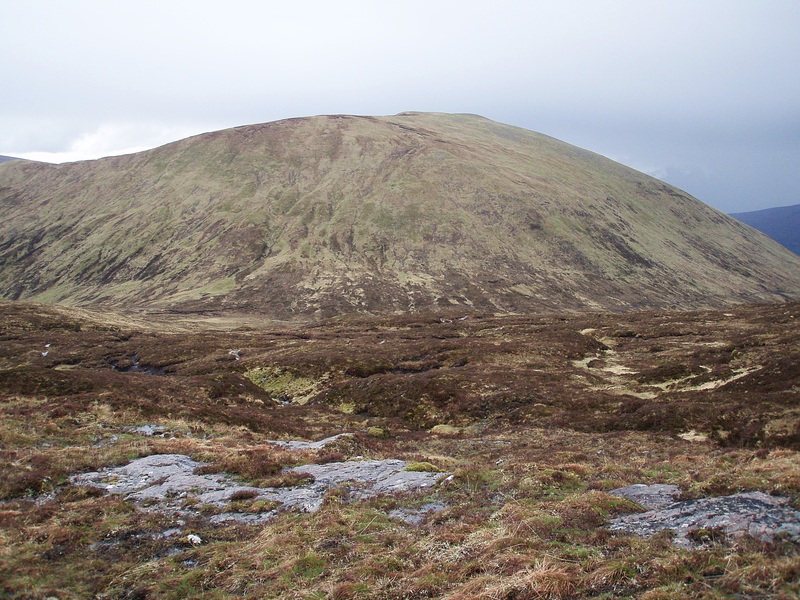 I met several walkers and cyclists on their way to Culra, and at Ben Alder Lodge I was caught up by Mole. We walked together for a while until he stopped for a break by Loch Ericht. I carried on for another hour and then sat on one of the small stone walls beside the road for a late lunch. 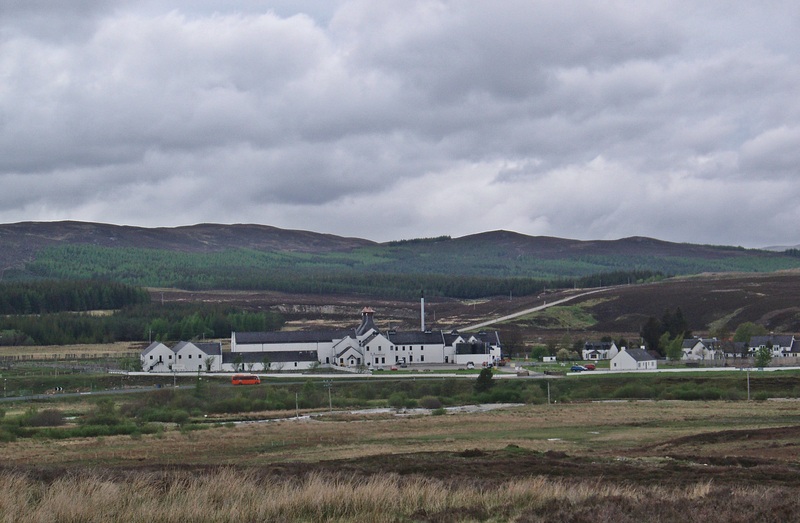 I arrived in Dalwhinnie at 15:00 and went to the Dalwhinnie Bunkhouse to collect the food parcel I had sent and to ask about where to camp. 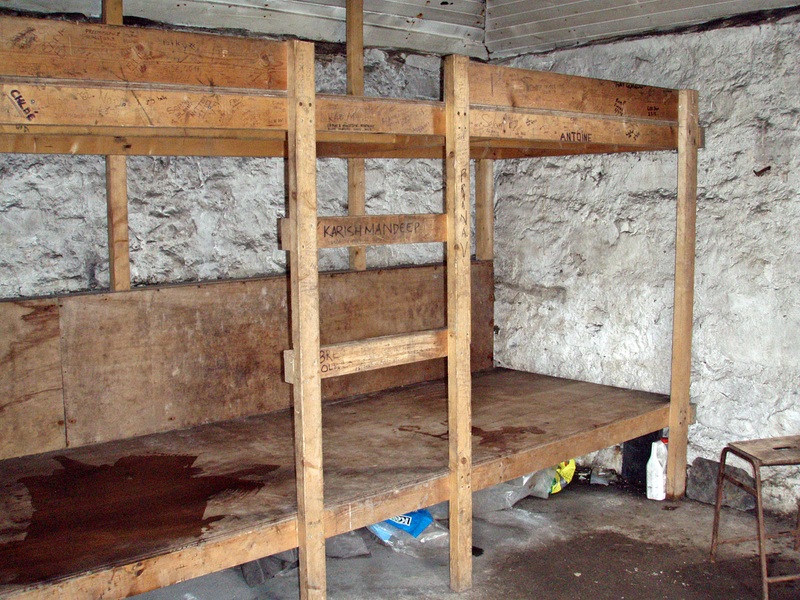 I was told we could camp at the picnic area across the road and were also allowed to use the showers in the bunkhouse for free. In the restaurant I met Markus and Philipp having a meal while they were waiting for a bus (or train?) to Newtonmore to spend the night in Sue and Ali’s Newtonmore Hostel and return the next morning. 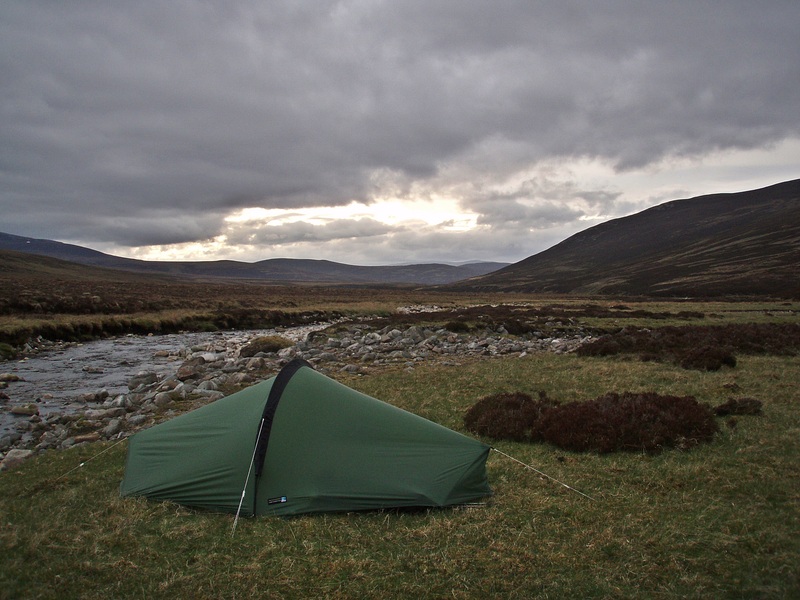 It was cold and windy again by now, and I tried unsuccessfully to find a sheltered place for my tent. In the end I put it up behind the bus shelter on the main street which is easily the most public place I ever camped in, but it was surprisingly quiet and secluded. Then I walked to the petrol station, hoping to stock up on plasters and something for my sore throat in the shop. I could only get Halls lozenges but they would have to do until I got to the pharmacy in Braemar. After a copious dinner of scampi and chips, apple pie and cream, followed by shortbread and millionaire’s shortcake (I was getting really greedy now), together with two ciders, I went back to my tent and had an early night. 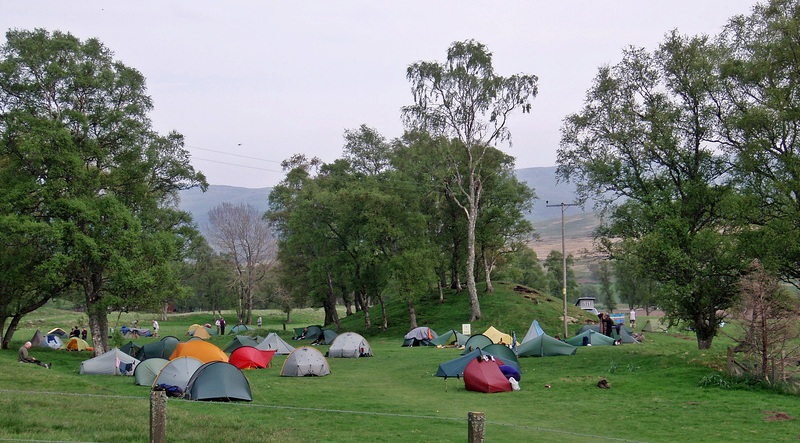 Later in the evening there were about twice as many tents as in the photo! Back at my tent I started packing up and was amazed that I managed to fit the contents of my food parcel into my rucksack without problems. 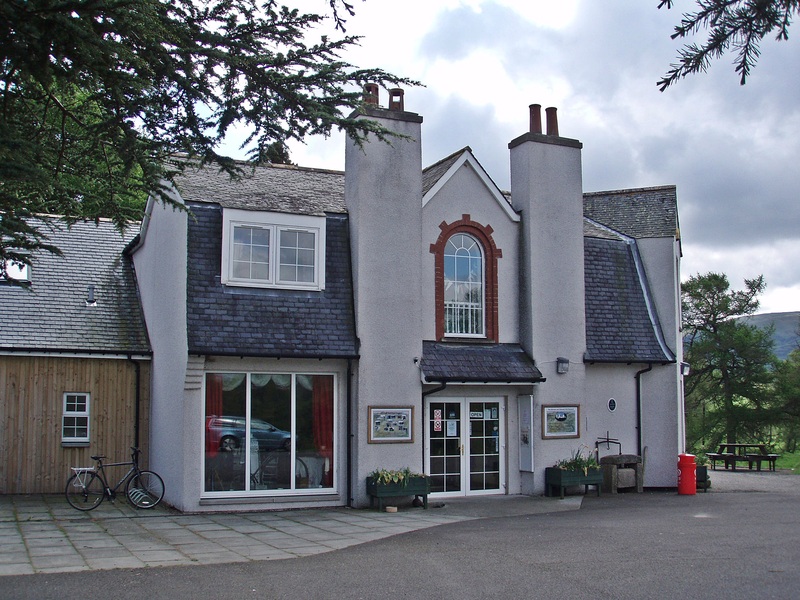 I used the outside water tap at the village hall to fill my water bottle and was ready to go. Everyone else was gone by now apart from Rob, a first-timer who in spite of his huge and heavy rucksack had climbed several Munros so far and now had a well-deserved rest day in Dalwhinnie. I was finally on my way at 10:15, and as soon as I made the first steps with my rucksack on, my left knee started hurting. 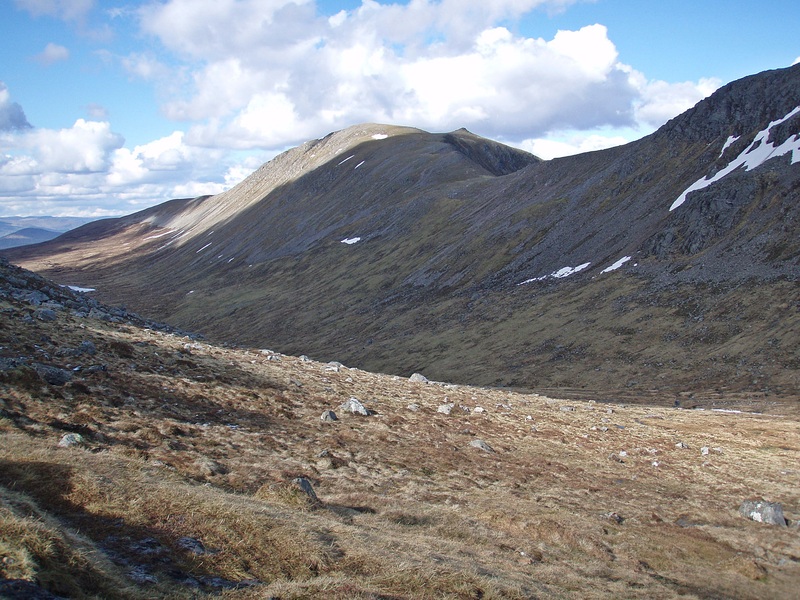 It was a stabbing pain on the outside of the knee, and I was wondering if I had damaged a ligament during the awkward descent over the steep boulder field on Ben Alder two days ago. I kept walking carefully, but I realised that I wouldn’t be able to follow my planned route for today. 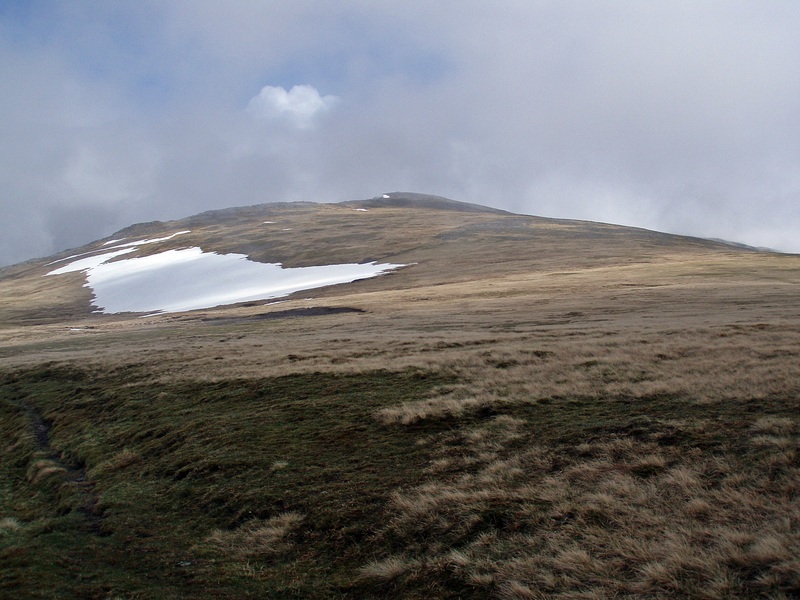 After climbing Meall Chuaich I was going to descend to the Gaick Pass, a route I had walked before that involved a very steep and loose path down to Gaick Lodge. 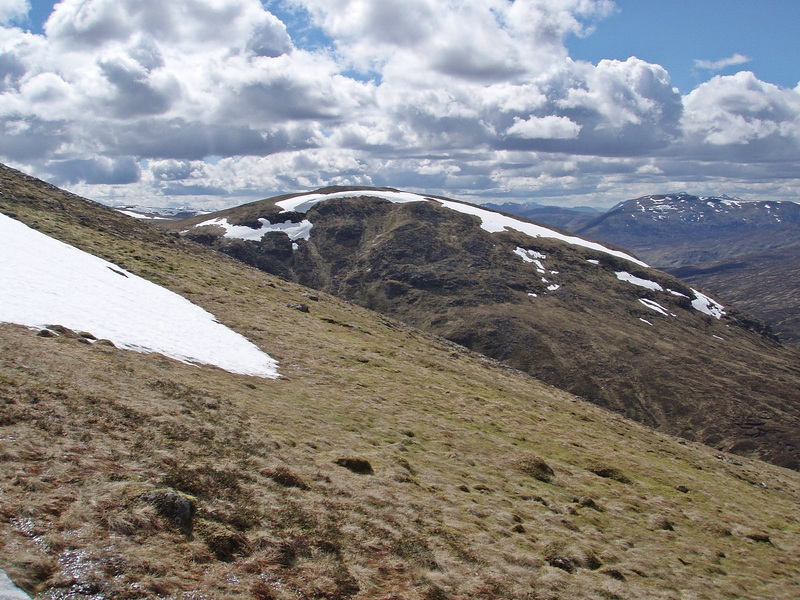 This wouldn’t be a good idea with a sore knee, so after consulting the map I decided to use Meall Chuaich’s easy-angled NE ridge to get to Glen Tromie. I walked along the track beside the Aqueduct and was caught up by Mole and his friend who joined him on the Challenge for a few days. After they disappeared in the distance I didn’t see any more Challengers that day. 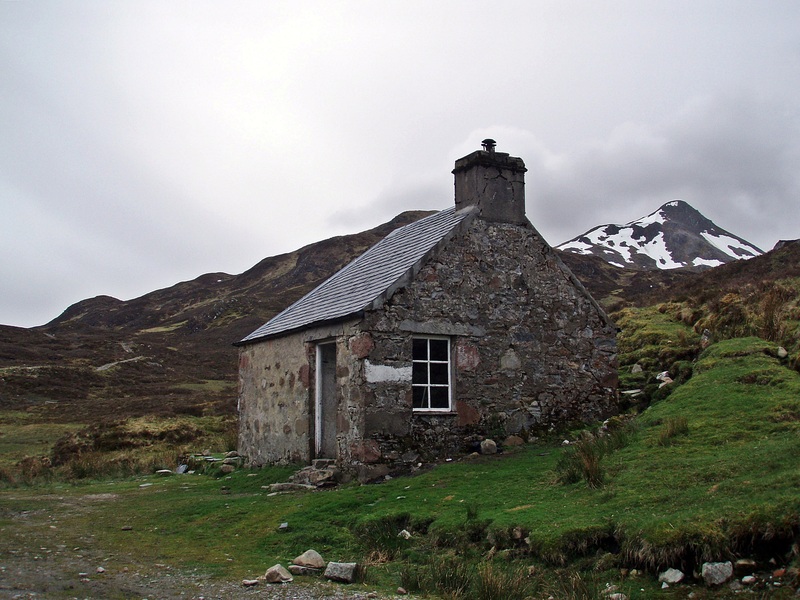 Locked (private) bothy by Loch Cuaich. 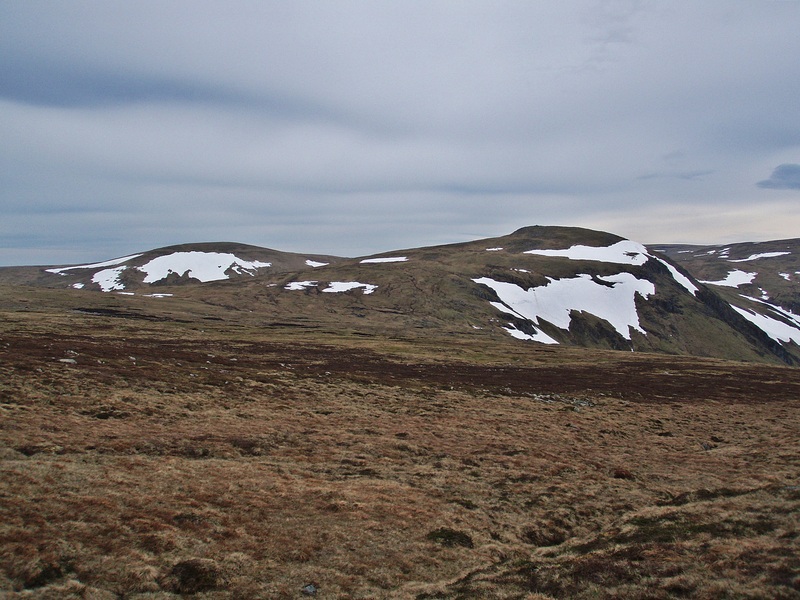 When it came to ascending the eroded path up Meall Chuaich, I climbed slowly and carefully, trying not to put too much strain on my left knee. 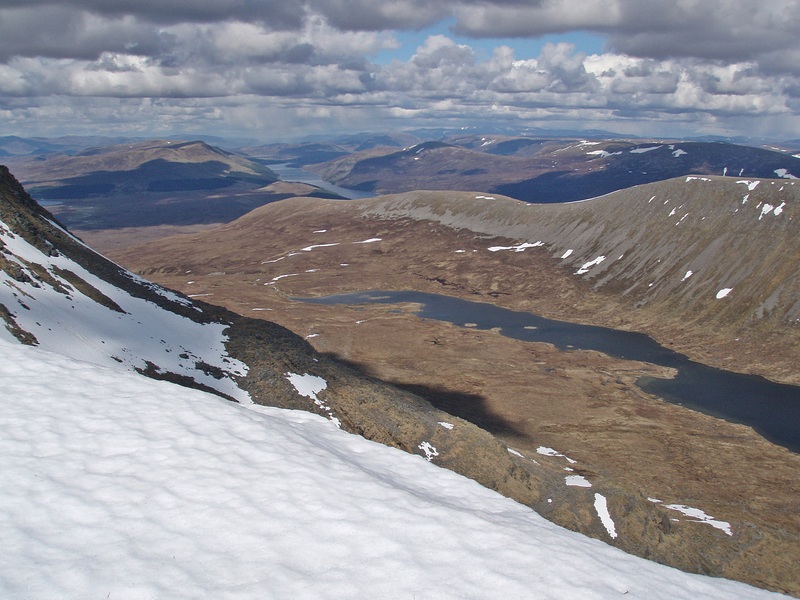 View back to Loch Ericht and the Ben Alder group. Progress was very slow, and to make things worse I suddenly started feeling sick, with painful cramps in my stomach. I was glad when I reached the summit, exhausted, at 15:00. 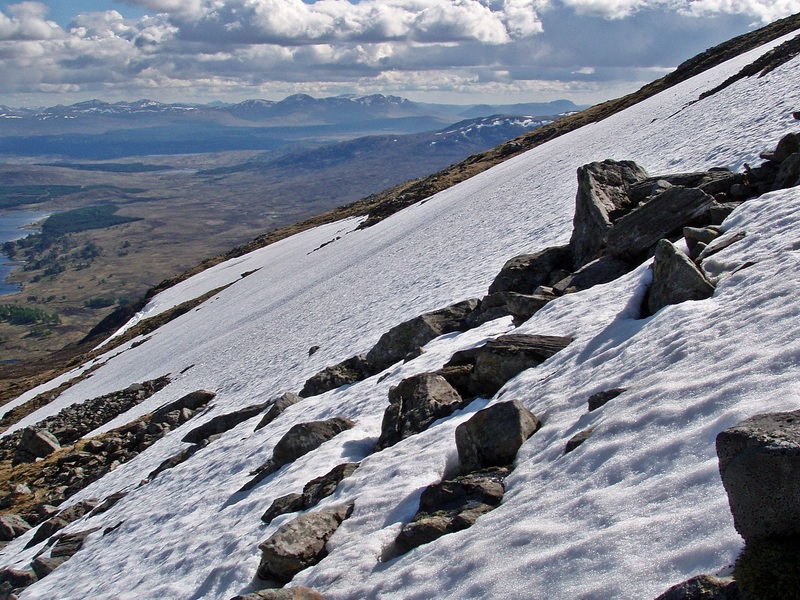 The NE ridge is not very scenic but at least it is an easy descent route! After two impromptu toilet breaks on the hill, I stopped by the river opposite Bhran Cottage, filtered some water and mixed it with a rehydration sachet. 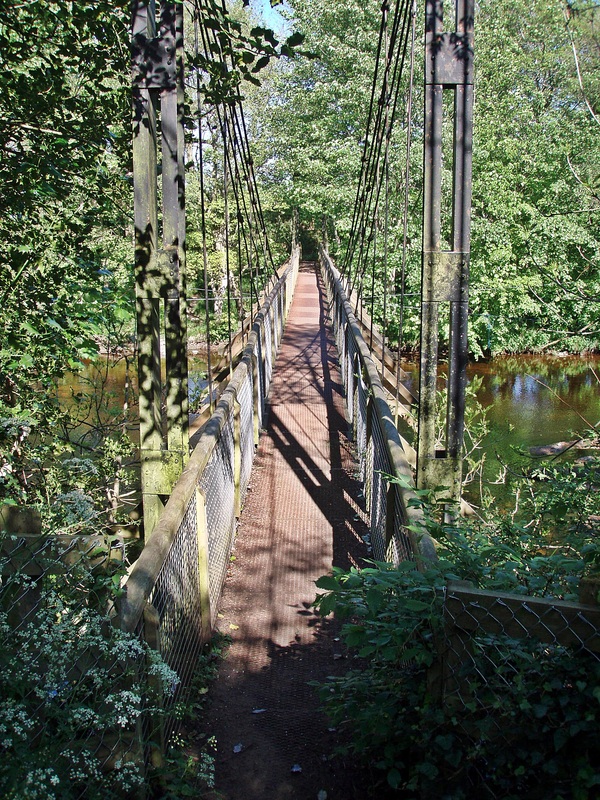 Then I continued along the River Tromie and was relieved to find that the bridge marked on the map actually exists. And I even made it across without incident! 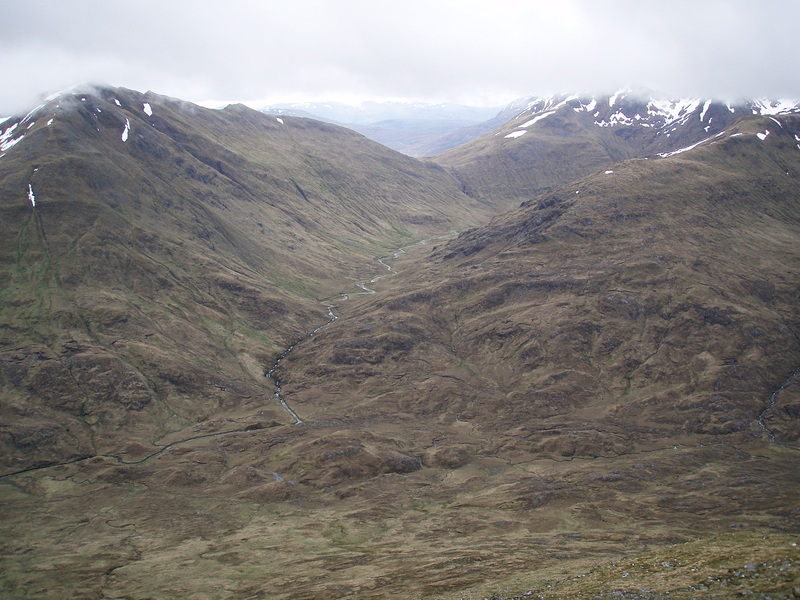 Looking up Glen Tromie towards the Gaick Pass, my original route for today. 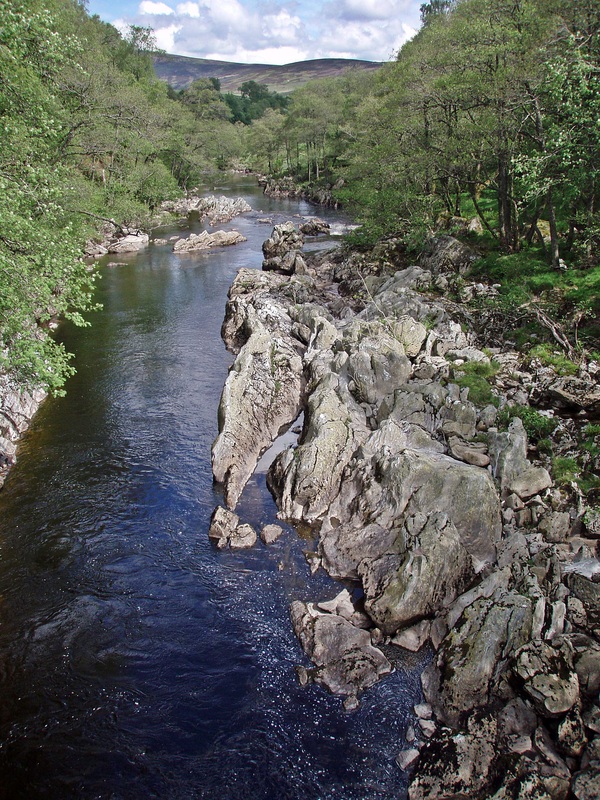 I walked upstream on the W bank of the Allt Bhran and had to ford the river by the dam. The water level was higher than during my last visit but I managed to get across with only slightly wet feet. 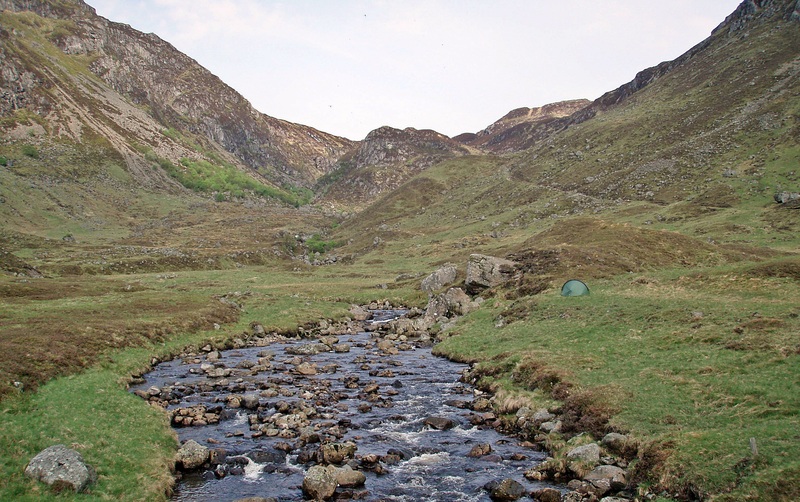 Further upstream I saw a tent already pitched in the area where I had planned to camp. After breakfast + more Imodium I set off at 08:50 along the edge of the forest and up to the track running along the flank of Carn Dearg Mòr. 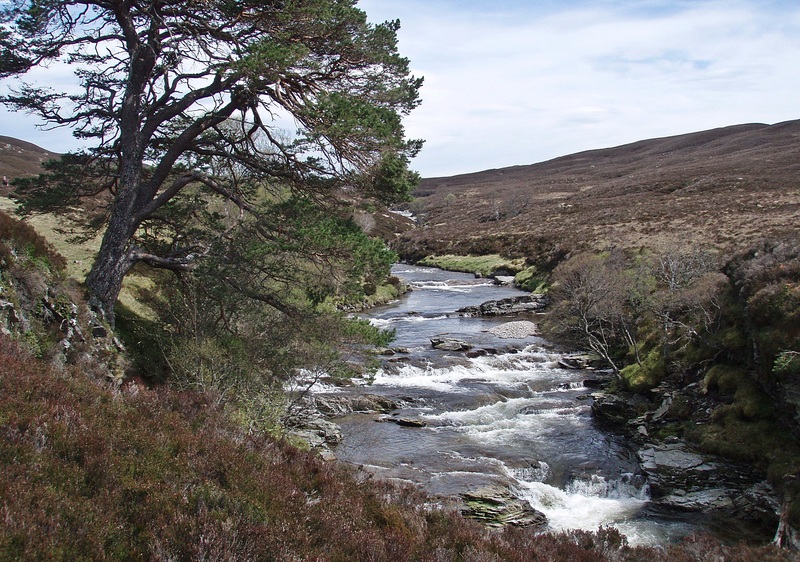 I felt very weak and slow, and it took me almost three hours to reach the ford across the River Feshie. 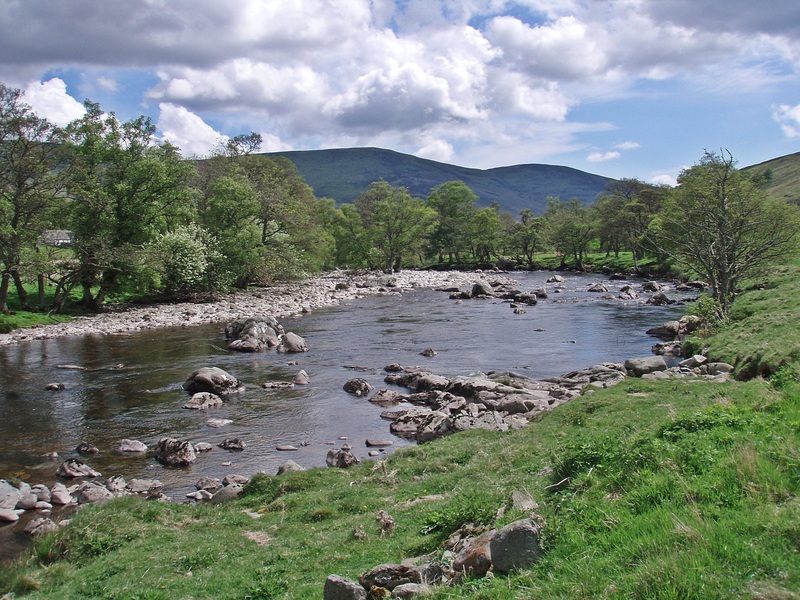 At first I managed to get across using stepping stones, but at about two thirds of the distance I got stuck on an island, and after wandering up and down for a while I resigned to the fact that I had to wade. 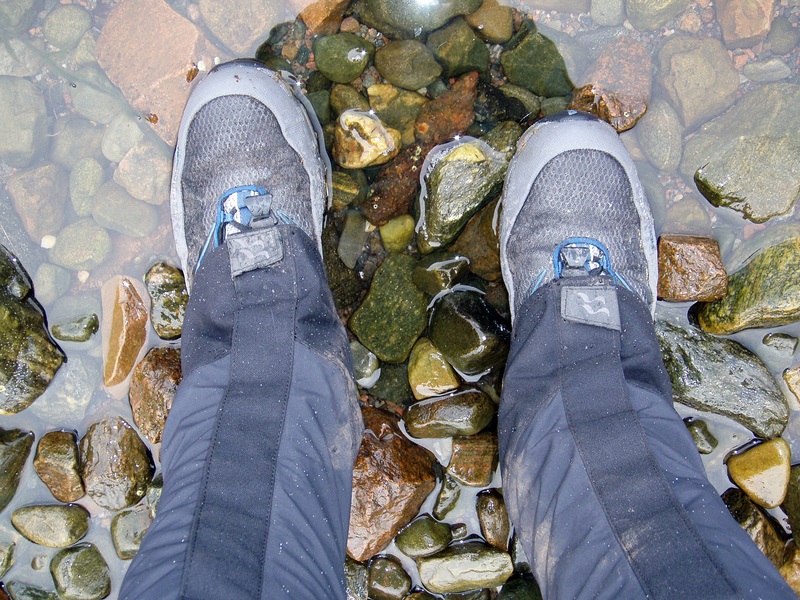 I changed into Crocs, rolled up my trouser legs and entered the last channel of the braided river. Unfortunately the water was thigh-deep and my trousers got quite wet, but being Páramo Cascada’s I knew they would dry quickly. While I was sitting on a rock beside the path to dry my feet and put new plasters on, Marian and Mike walked past. 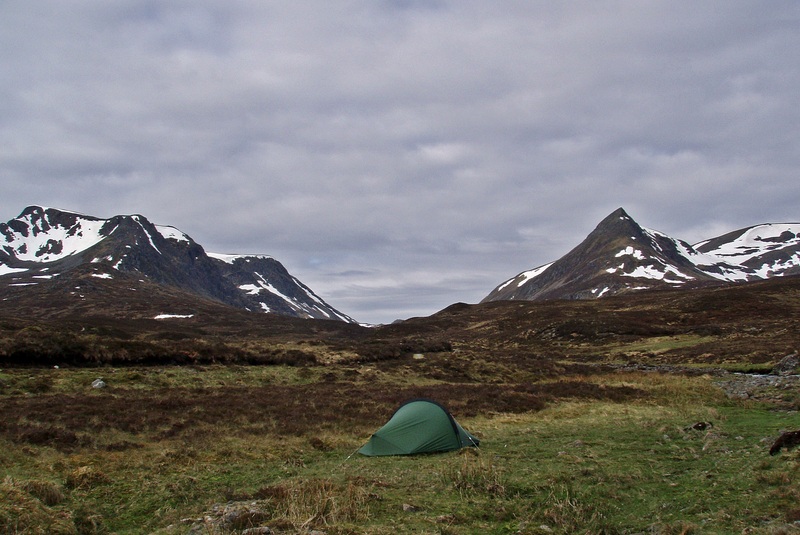 It turned out they had been the campers in the tent by the Allt Bhran last night. It was rather windy to start with, but when the sun came out it became pleasant and warm. 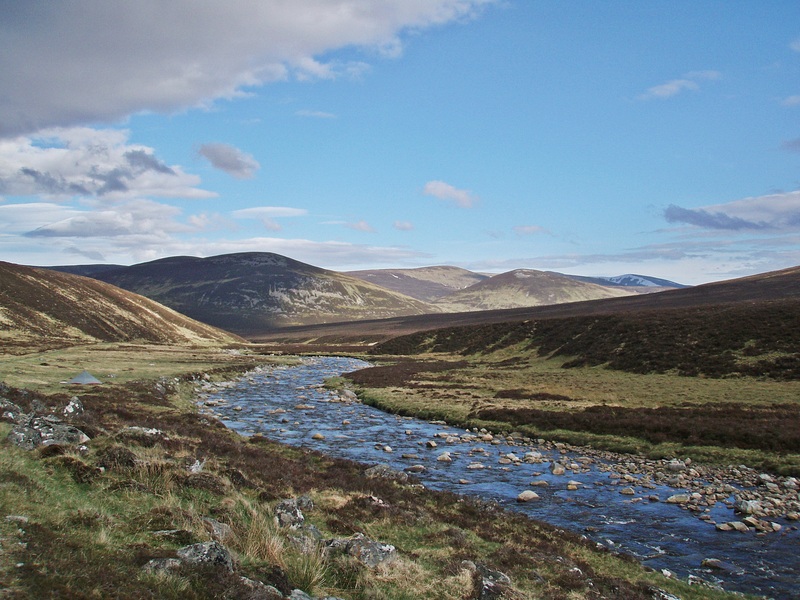 During the walk along Glen Feshie I met several other Challengers and chatted on and off with Marian and Mike, as well as with Tina, Graham and Peter, but most of the time I walked on my own. Bridge across the River Eidart. 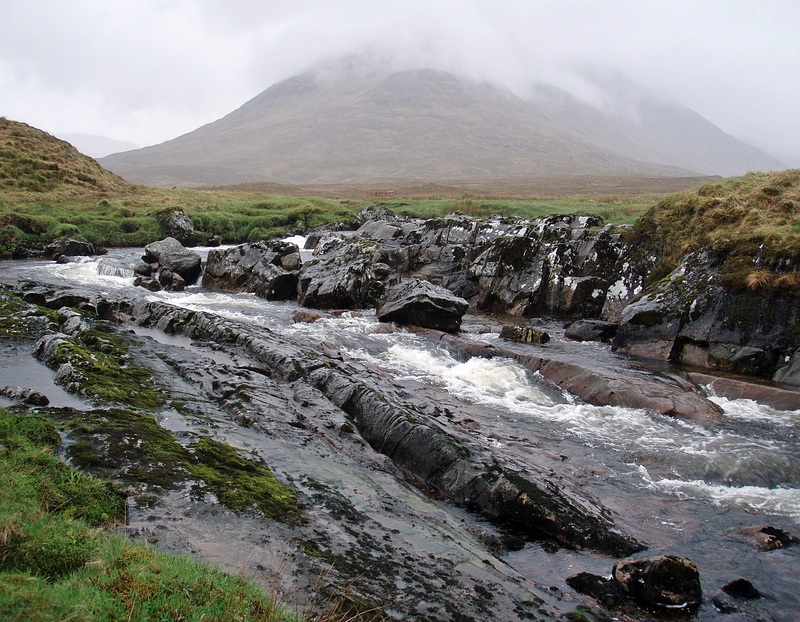 An Sgarsoch and Carn an Fhidhleir. At least my knee was not quite as painful as yesterday, and after a couple more rehydration sachets and Imodium I started to feel better late in the afternoon. 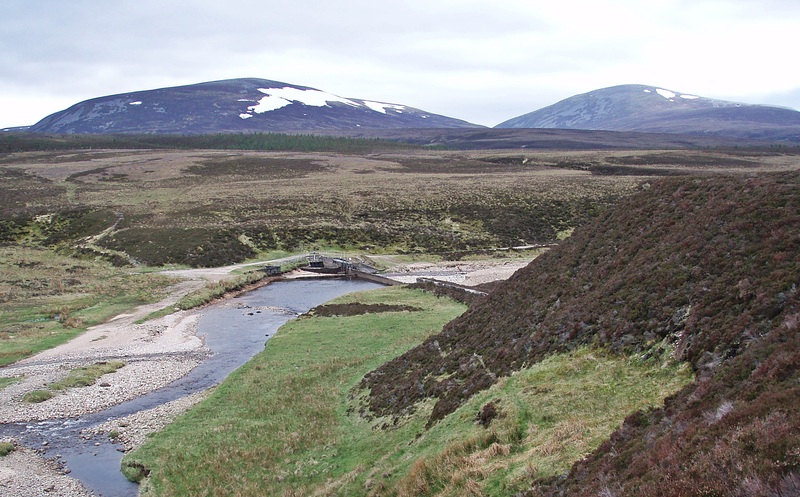 Surprisingly, there were no tents by the “Dangerous Building” near the confluence of Geldie Burn and Bynack Burn, nor at White Bridge, both of which are normally popular with Challengers. 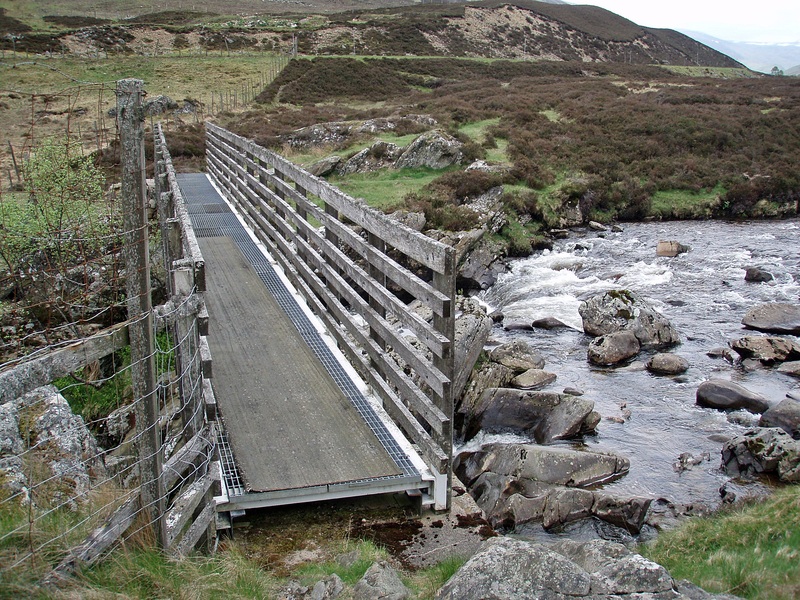 Although it was still very windy, Tina, Graham and Peter decided to camp at White Bridge. 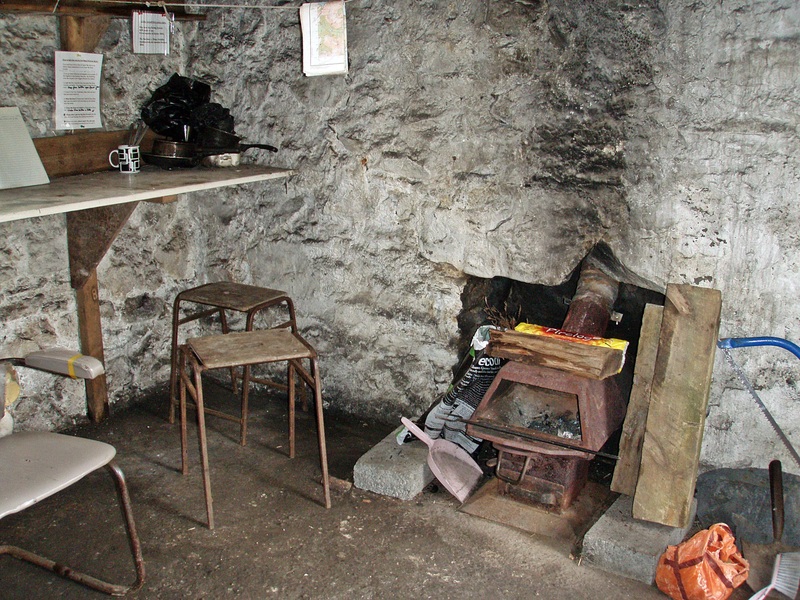 I thought the location was too exposed and continued, hoping to find a more sheltered place. When the sun started shining on my tent in the morning, it soon became far too warm inside because it was so sheltered from the wind. While I was packing my rucksack two Challengers stopped for a break on the path right below my camp site. One of them was Andrew who was also having trouble with his knee and was wearing a bandage. 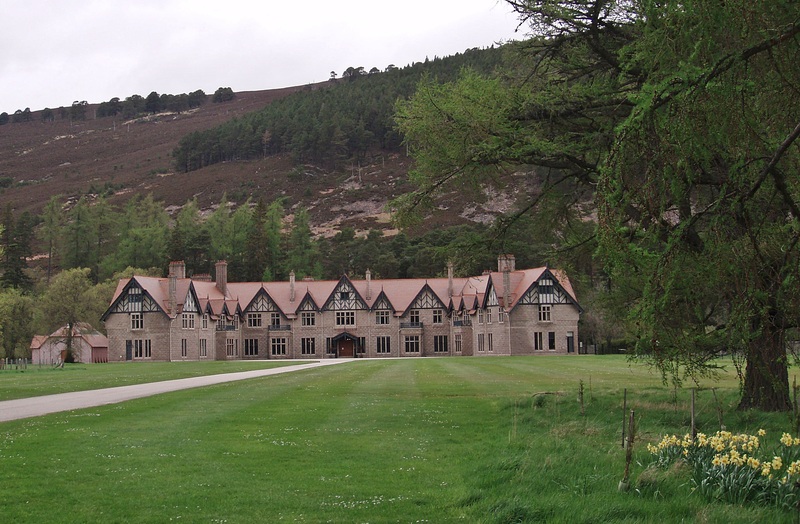 My next stop was Mar Lodge where I expected to meet lots of Challengers. I was surprised to find only Liz who was walking solo after her walking partner Sue had to retire from the Challenge, but Sue was going to join her again on the last few days to walk to the coast together. I had a cup of tea and enjoyed exchanging Challenge stories with Liz, and was particularly impressed about her completing a previous crossing with a serious foot injury! Just when I was leaving, a whole bunch of Challengers arrived: Marian and Mike, Alan, Phil and Alistair and a few others. 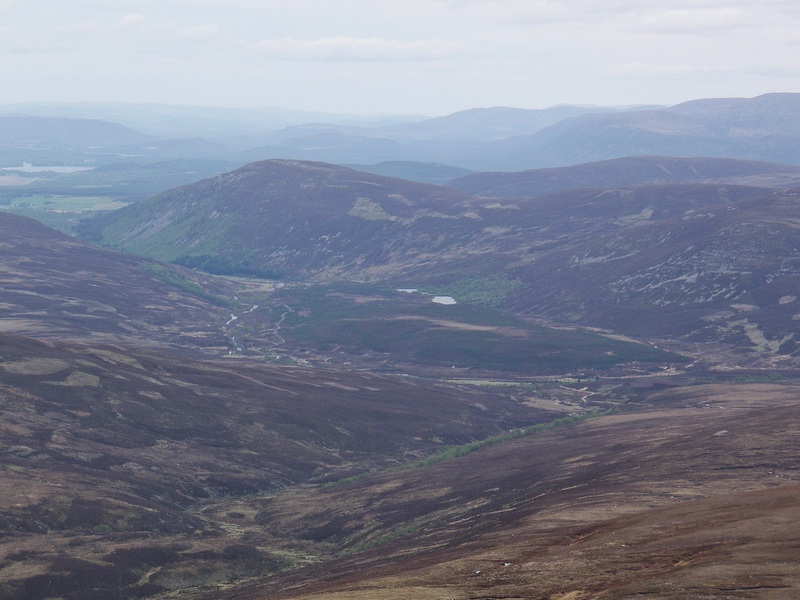 On the long road walk to Braemar I was caught up by Martin who soon headed into the Morrone Birkwood. In Braemar I first went to the pharmacy to stock up on all the medicines I had used from my First Aid Kit in the last few days, and I was hoping to buy a knee support. 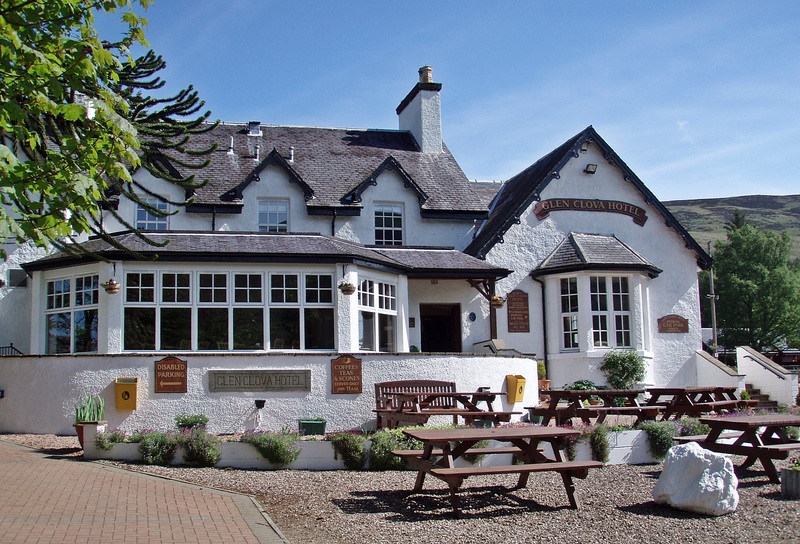 After a quick stop at the Coop for food and Braemar Mountain Sports for a gas cartridge I went to the Invercauld Arms Hotel to see if they had any last minute rooms left. I had intended to stay at the campsite and had even sent a food parcel there, but after all the ailments of the last few days the prospect of a bit of luxury was just too tempting. 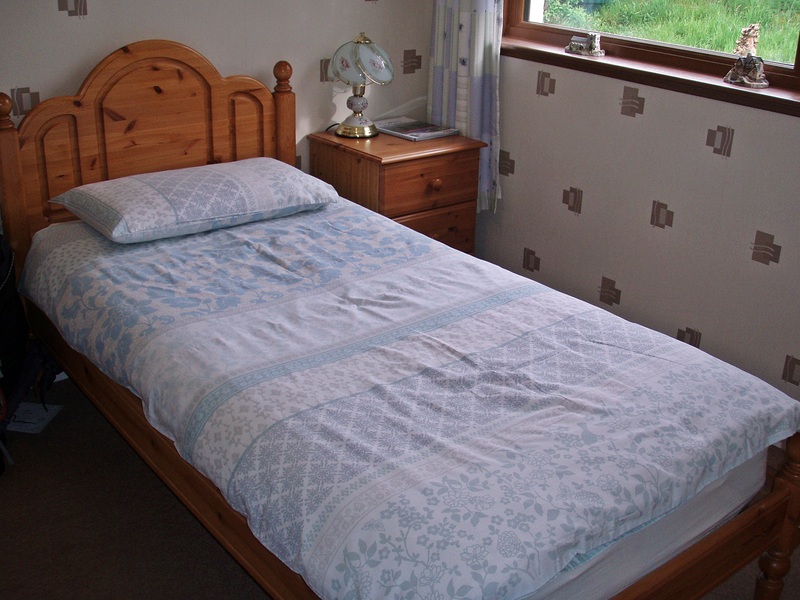 I couldn’t believe my luck when I was offered an ensuite twin room for £ 30 B & B, or £ 45 half-board. I was going to have a meal at the hotel anyway, so I went for the latter option. 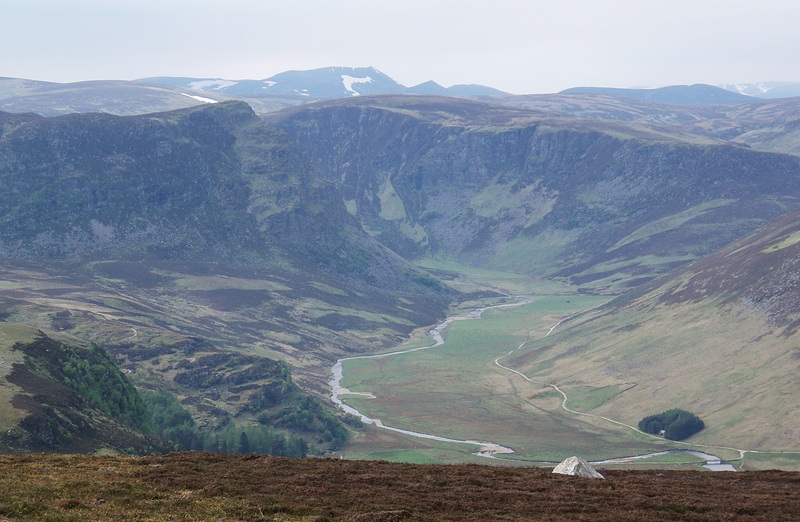 The room was spacious enough to spread out and sort the contents of my rucksack, and it even had a nice view to Braemar Castle. The interior design could have been a little more contemporary but I was very happy with my room, it had everything I needed. After checking in I walked to the campsite to collect my food parcel and then had lunch at the Old Bakery where I joined Margaret and Mole at their table. Back at the hotel I had a good rest, did some laundry and had a nice long shower. At 19:00 I went down to the large dining room to have a three course meal, but the choice was very limited (which was to be expected) and for salmon as a main course I had to pay a £ 7.95 supplement. Although it was still good value, the next time I would rather book B & B only and have a meal in the cosy bar where the menu offers a bigger choice. When I had finished I noticed Marian and Mike at a table nearby and went over for a chat, but I left when their meals arrived. Then it was time for a little socialising at the Fife Arms where I met Laura and Louise, Peter and Jayme, Mole, Ian, Croydon, Fred and many others. I was glad that I was feeling well enough again to drink cider but I was careful not to overdo it and was back in my room at 23:00. At breakfast I started with cereal, fruit and orange juice, but as I wasn’t sure if my stomach would cope with a full cooked breakfast yet, I only had scrambled eggs and toast with jam afterwards. Back at my room I unpacked my food parcel and tried hard to get everything into my rucksack, together with yesterday’s shopping. In the end I had no choice but to throw some things out, mainly oatcakes of which I had packed plenty but had hardly eaten any. There is no WiFi in the hotel rooms, only in the lounge downstairs, so I sat there for a while after checking out. 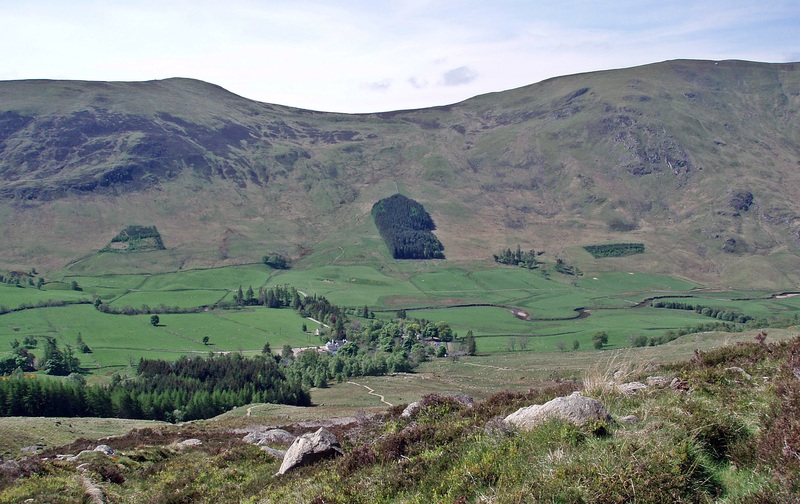 I needed to check the weather forecast to decide about my route for the next two days, because I had planned to have an easy day and camp at Lochcallater Lodge tonight and walk to Glen Clova via Jock’s Road tomorrow. Depending on the weather I would walk over the hills today instead. 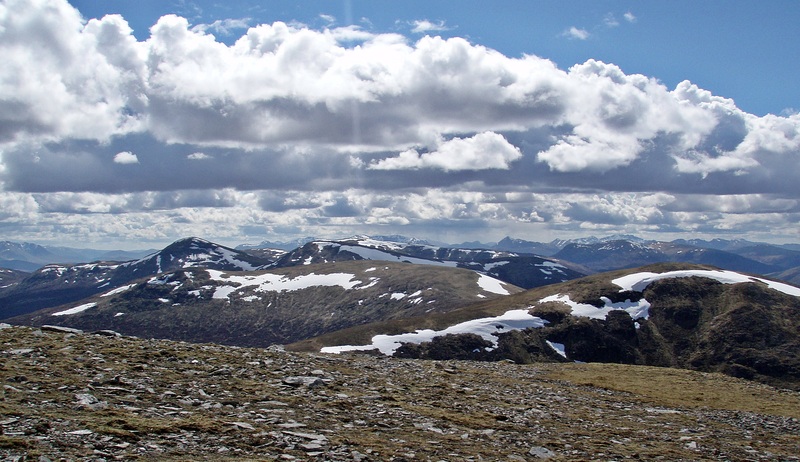 The forecast was for 40 mph winds today and decreasing, and 80 % chance of cloud free Munros, however tomorrow would have 25 to 30 mph winds but increasing, with only 30 % chance of cloud free hills. 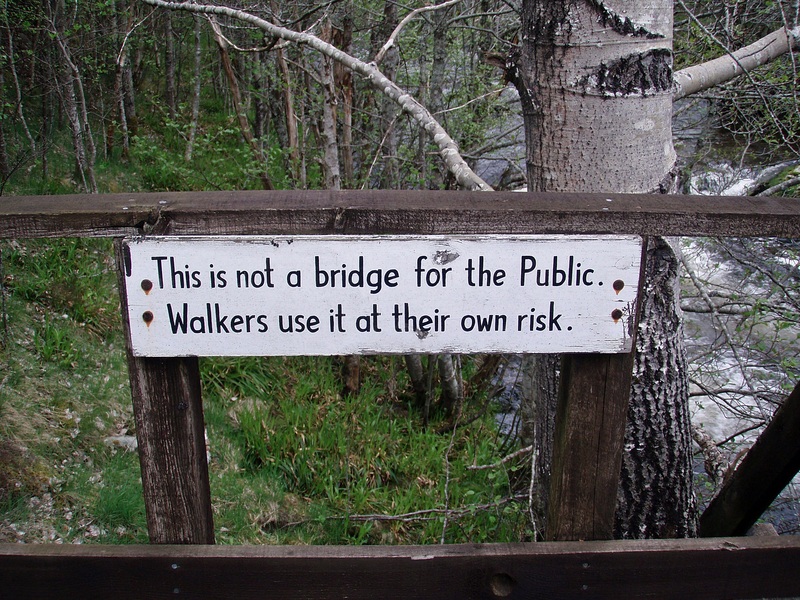 I would make up my mind later, and started walking along the minor road beside the golf course. 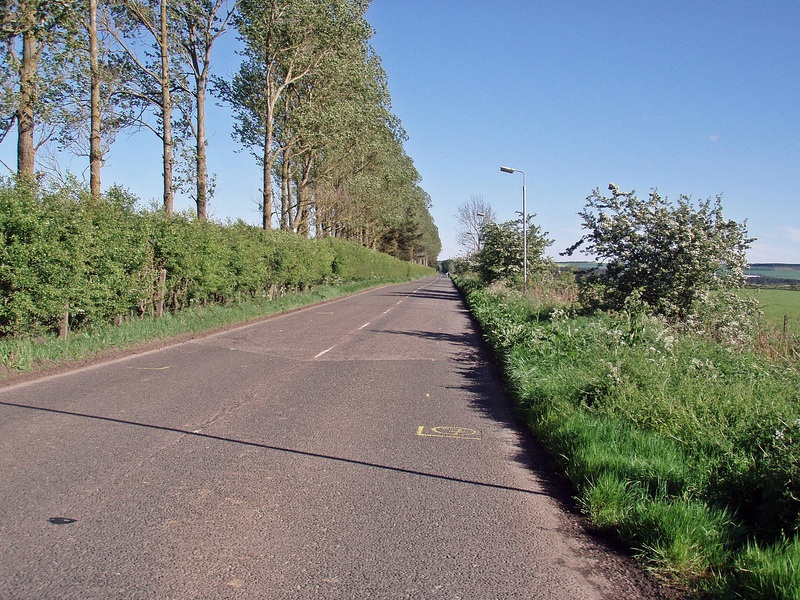 In previous years I had walked along the A93 but this route was more scenic and certainly safer as well. 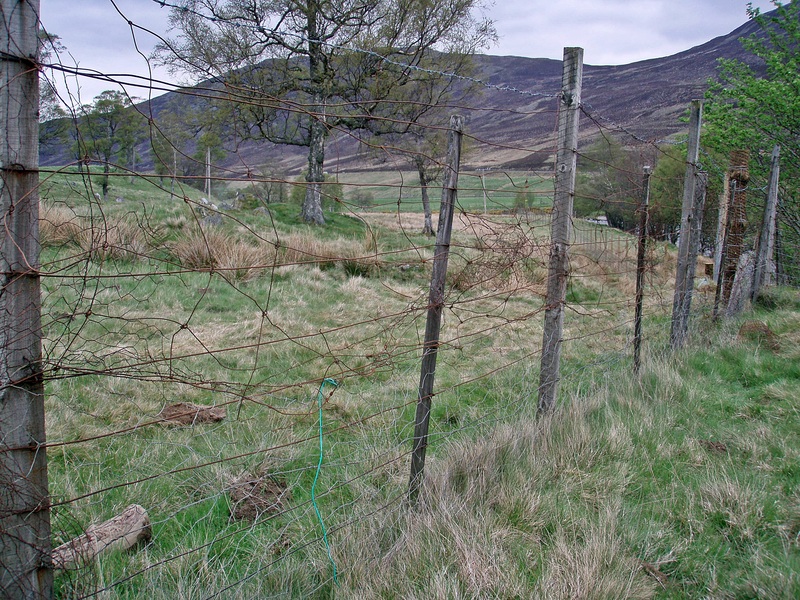 But when I reached the footbridge near Auchallater the way was blocked by an old fence with barbed wire on top. 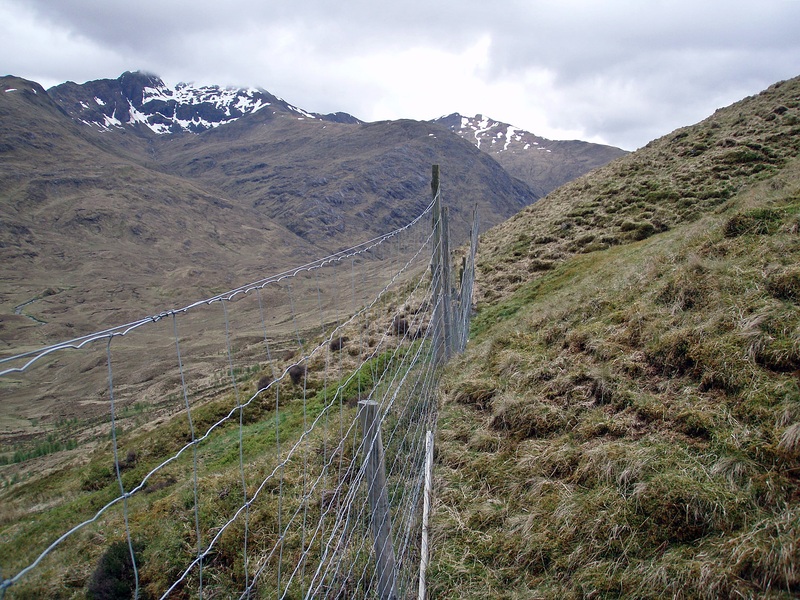 After walking up and down it without finding a gate or a way around it I had to throw my rucksack through a gap in the fence and climb through – I wonder where I went wrong or if this is the normal route? 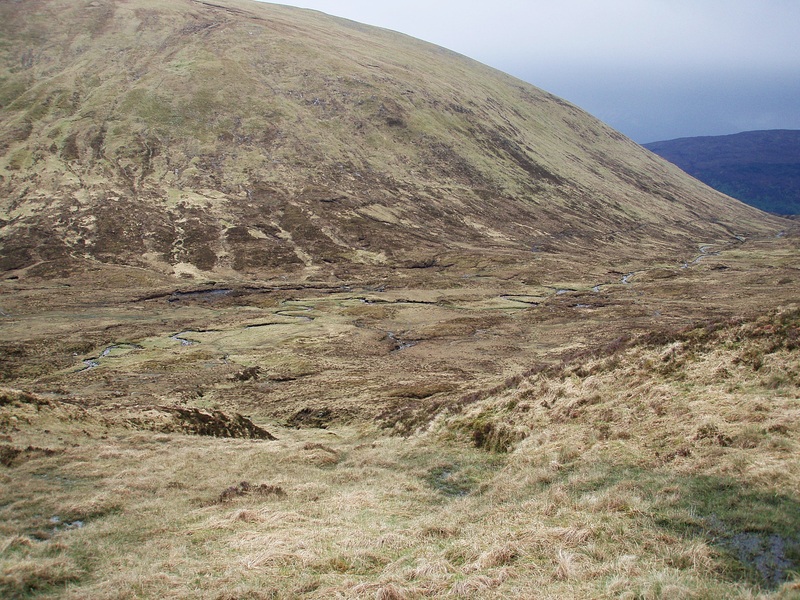 The car park at the start of Glen Callater was full and some day walkers were already coming back along the track. Near the Lodge Bill and two friends came towards me, they had just gone out to walk their dogs, but he assured me that the Lodge was open and he would be back soon. Inside Jeanette was serving tea, coffee and biscuits, and I joined Challengers Norma and John for a long lunch break. The weather looked good, and reluctantly I decided to head over the hills today and take advantage of the good visibility, who knew how it would be tomorrow? After signing the visitor’s book I left at 14:00. 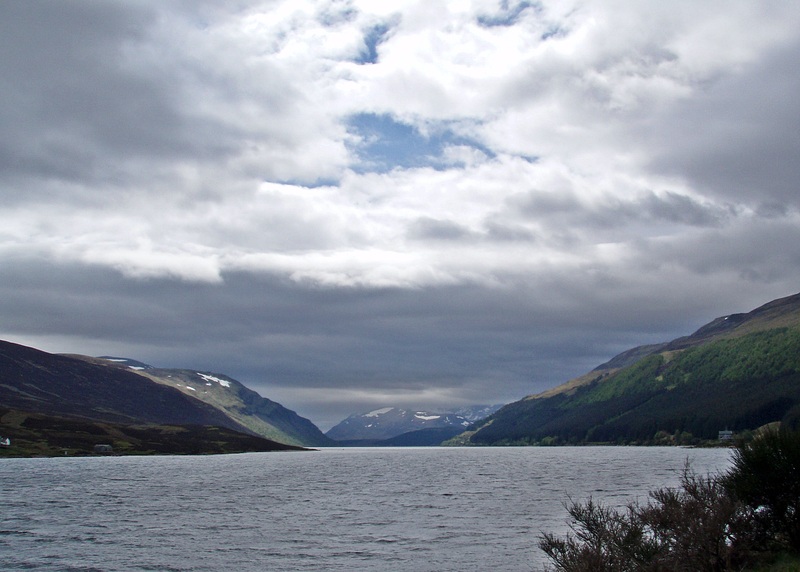 S end of Loch Callater. 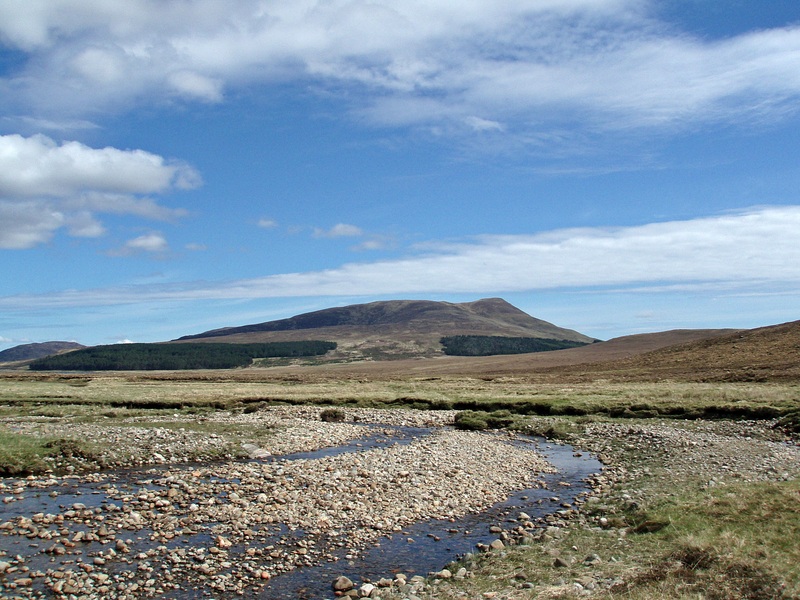 View across to Cairn of Claise and Carn an Tuirc. 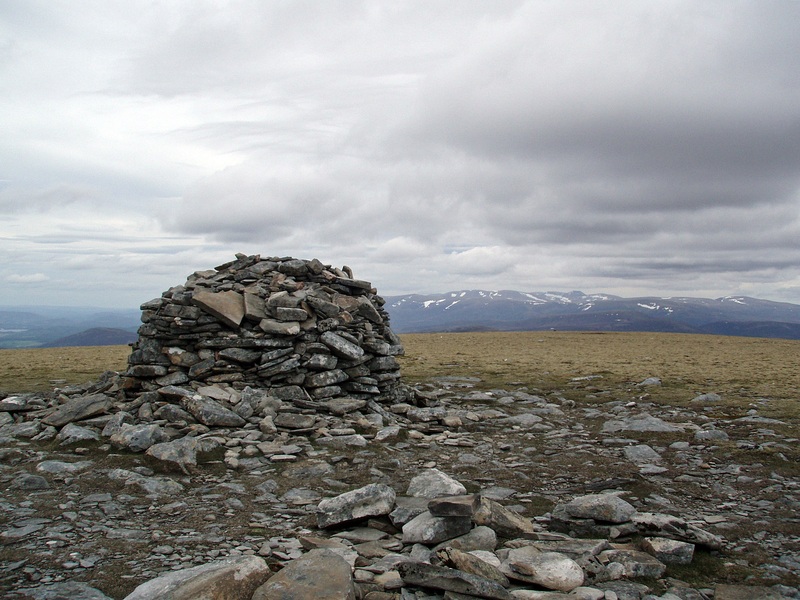 Juniper Cairn with Cairn Bannoch on the left. 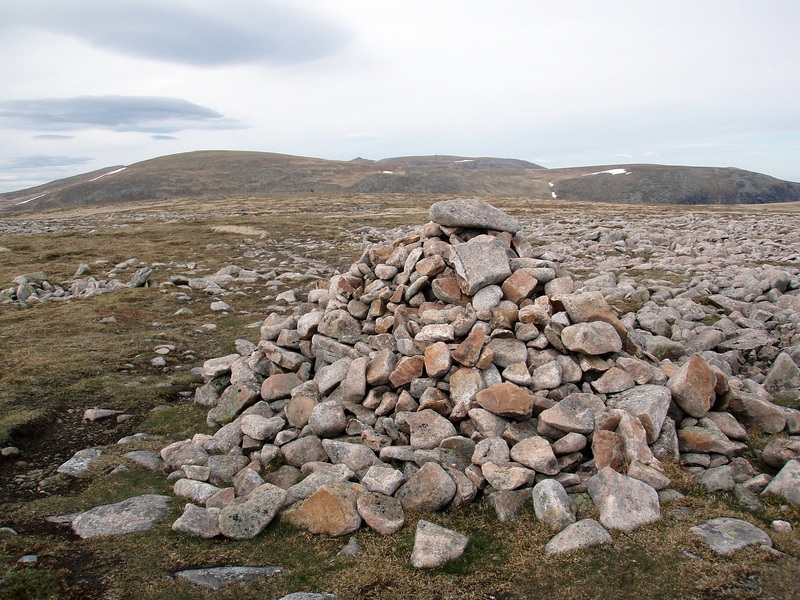 It would have been only a small detour to climb Cairn Bannoch but I had a plan for a backpacking trip over all the White Mounth Munros and Tops (which I actually did the week after the Challenge), and I wanted to leave the Munro for that occasion. 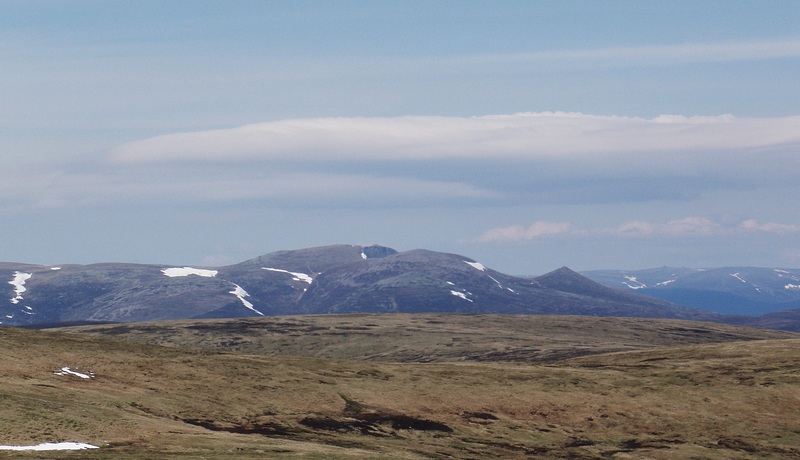 Fafernie, one of Cairn Bannoch’s Munro Tops, and Lochnagar in the distance. 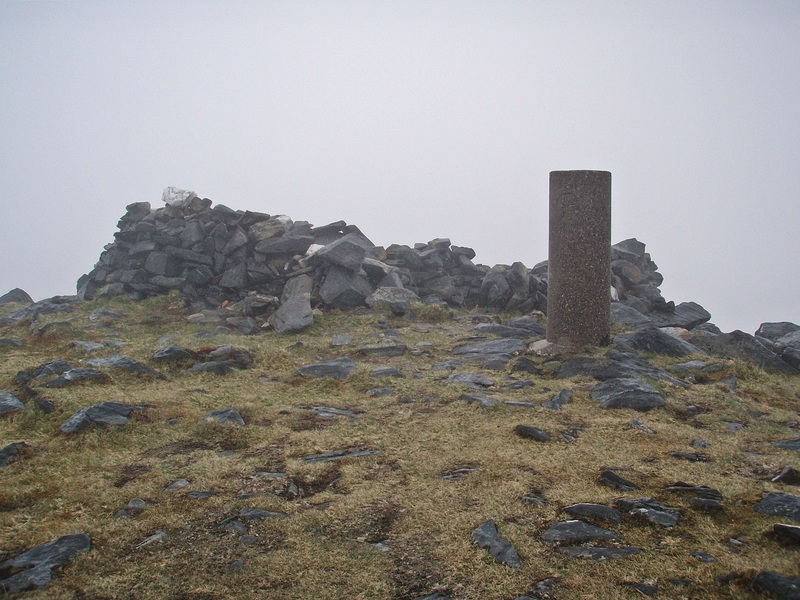 Tolmount’s Munro Top Crow Craigies. 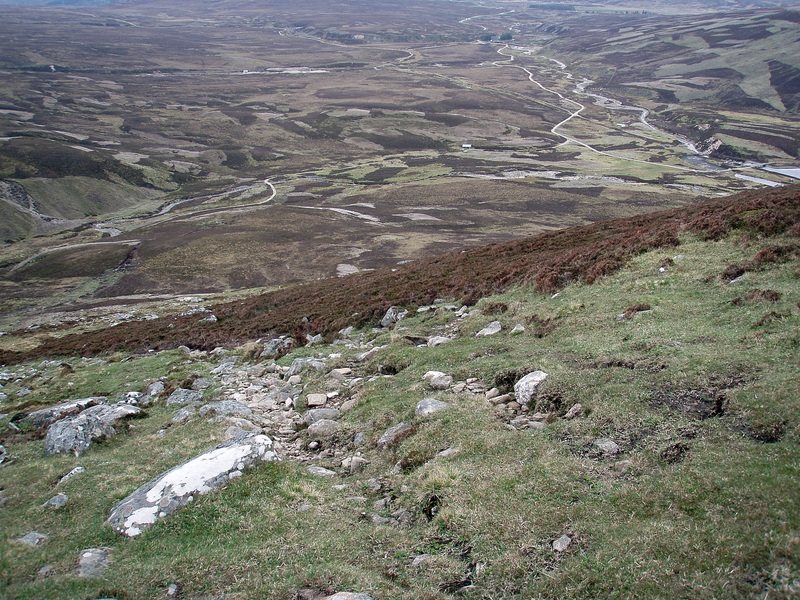 From Crow Craigies on, Jock’s Road is a clear path which contours around the boggy areas on the next bealach. 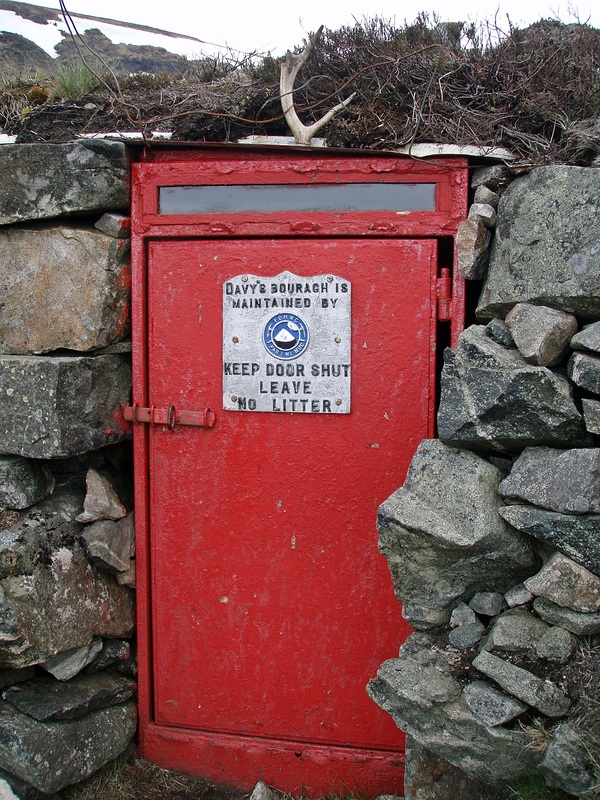 The path soon passes by Davy’s Bourach, a very basic shelter. At least this time there was no rubbish lying inside. 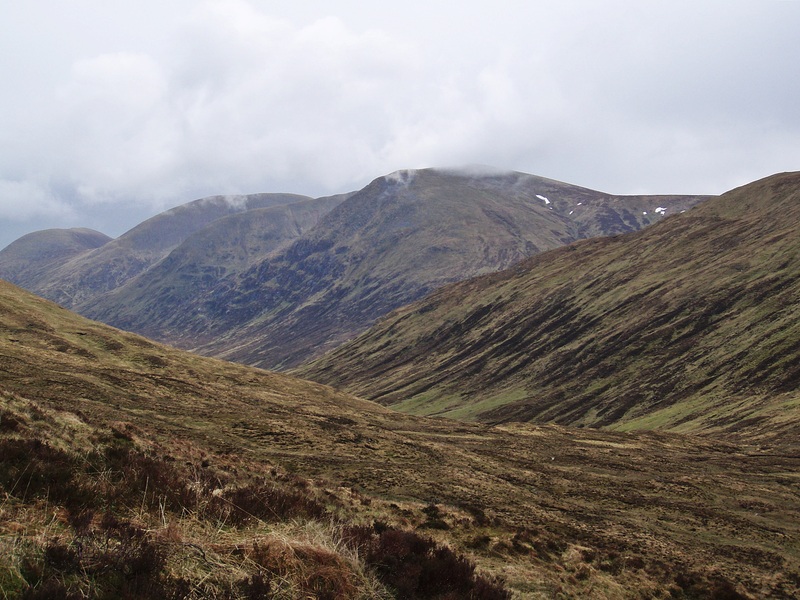 As soon as I started descending into the shelter of Glen Doll, the wind calmed down and I could shed some layers. 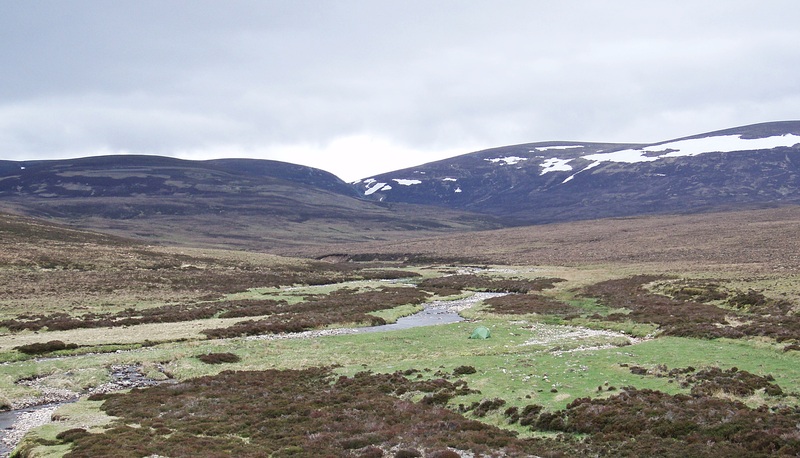 My favourite camp of this Challenge – the location, the views and the weather were just perfect! It was nice and warm in the morning and after a leisurely breakfast I had a very late start at 10:40. 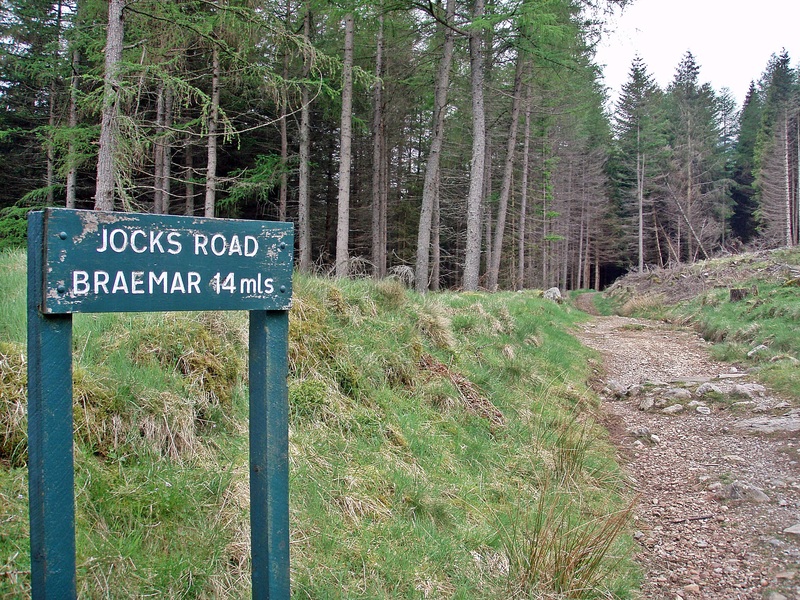 The start of Jock’s Road. 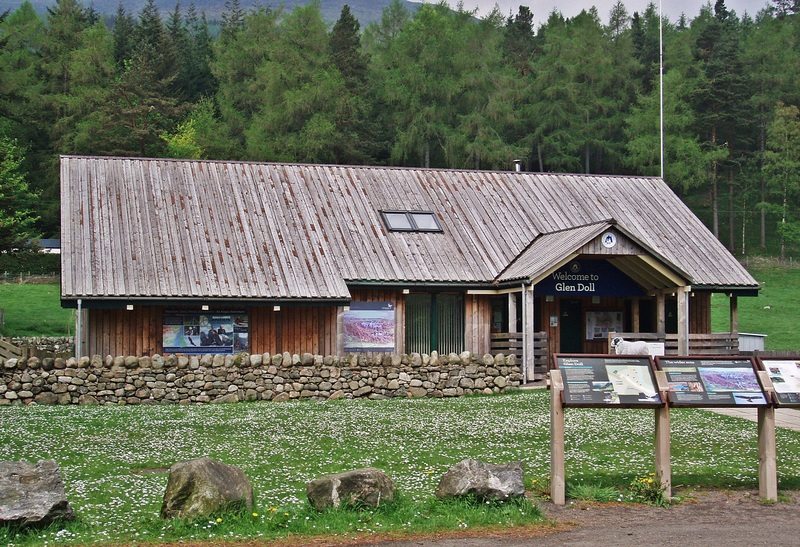 I stopped at the Glen Doll Visitor Centre for a second breakfast, sitting on the bench outside. 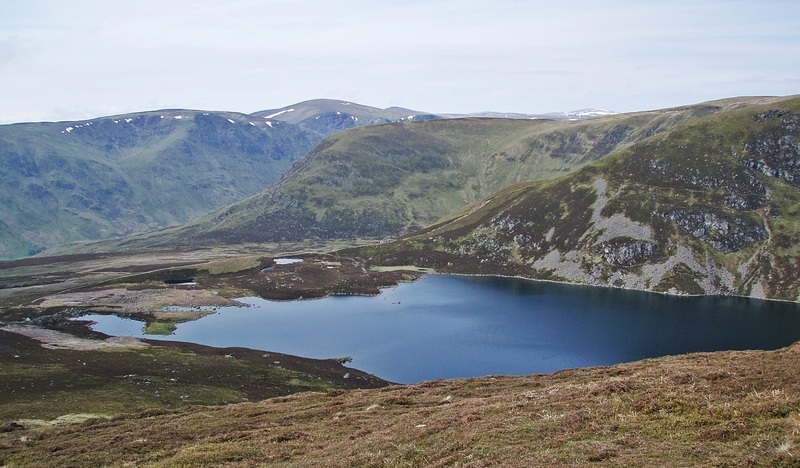 Apparently the weather forecast had been wrong because it turned out to be a much nicer day than yesterday, but I was glad I had walked over from Glen Callater the previous day so I could now enjoy an unofficial rest day in the sun. The best thing was that for the first time since the start I was feeling really good, I had not got the cold I had been worried about, my upset stomach seemed to have settled and even my knee was slightly better although walking still hurt and I kept wearing the knee support until the end of the Challenge. I unpacked my rucksack, had a shower and washed (and dried!) my hair, and then went back to the terrace where I met Norma and John and sat chatting with them until it got too chilly outside. Quite a few Challengers were already in the bar, Peter and Jayme, Emma, Lindy, Ian, Heather and Stephen and some others. I wasn’t really hungry but still had a steak and ale pie, followed by rhubarb crumble with cream. I would have liked to stay longer but after all this food I could hardly keep my eyes open and went to sleep at about 21:30. 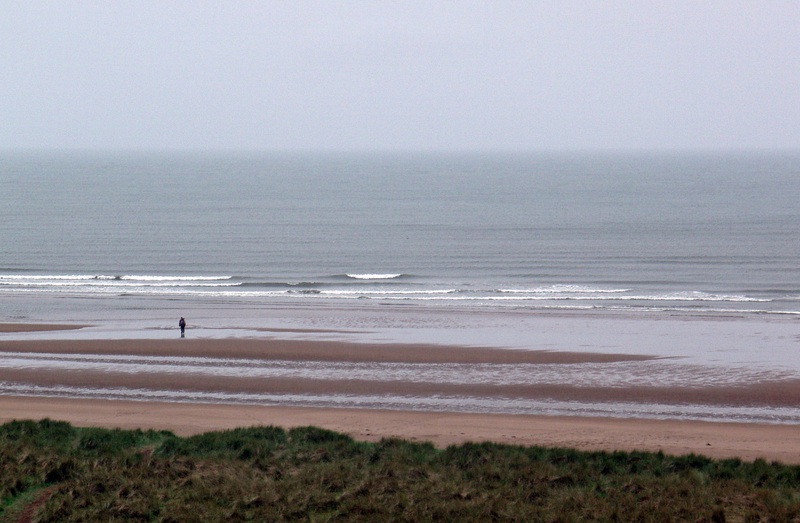 Shortly after 08:00 I went over to the hotel for breakfast and sat with Norma, John and Ian. Maybe my order got lost on the way to the kitchen, because for some reason it took a very long time for my breakfast to arrive and everyone else had finished by then. However, Heather and Stephen turned up even later and kept me company, and after some more chatting I had another late start at 10:40. It was already hot and sunny, and I started walking with my sleeves rolled up and suncream on my arms. 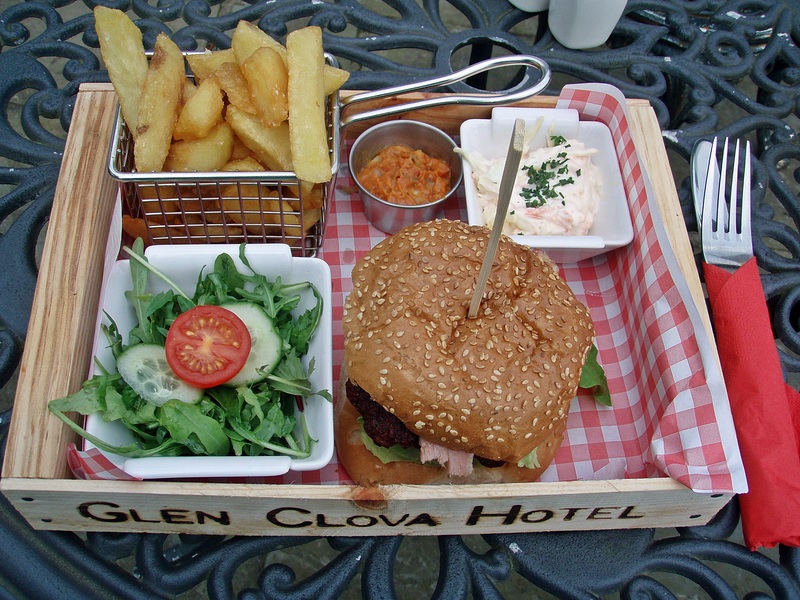 As usual I found it hard to leave – Clova is probably my favourite place on the Challenge, it has a very idyllic feel to it and I was glad that this time I could spend a little more time here in wonderful weather. 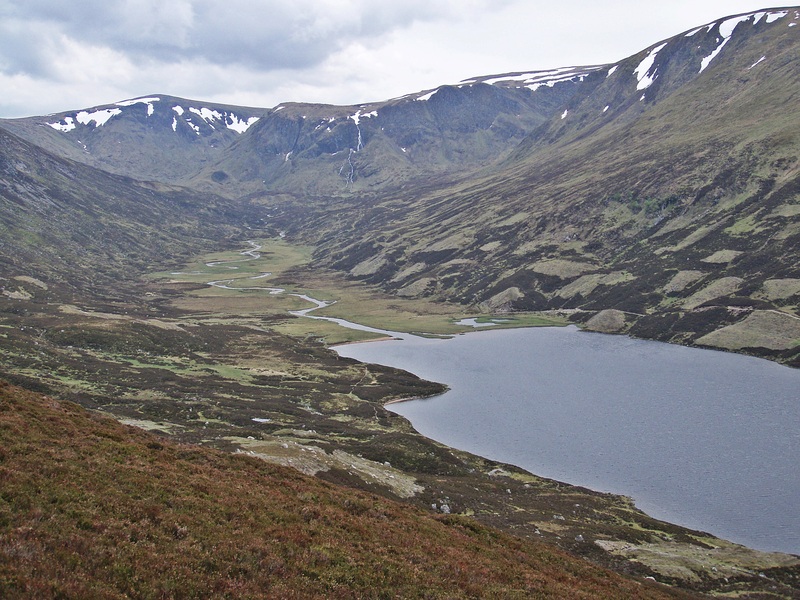 On the way up to Loch Brandy I was caught up by Heather and Stephen and we stopped for a short break and to take some photos. 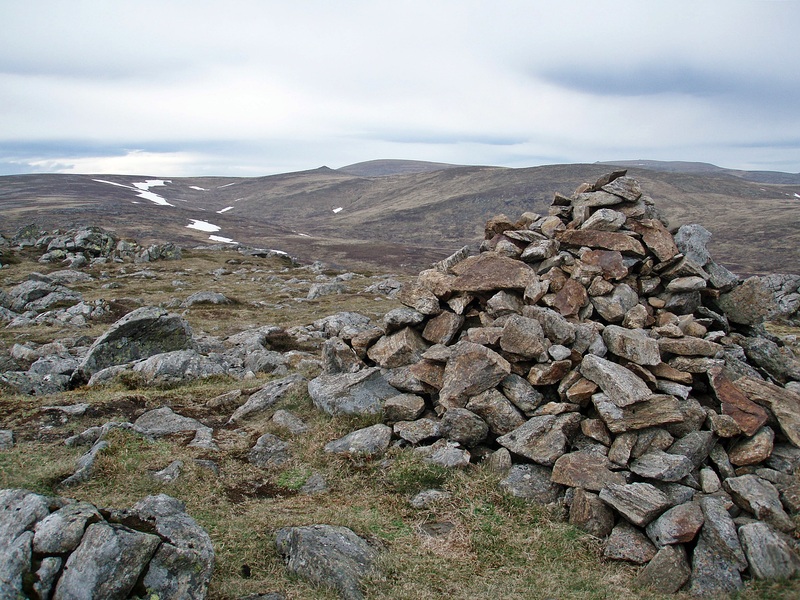 At the top of Green Hill we parted ways and I continued on my own towards Muckle Cairn. Somewhere around here I had lost my way on my first Challenge in 2011, and at the same place I got lost again this time (I even recognised the same large peat hag)! 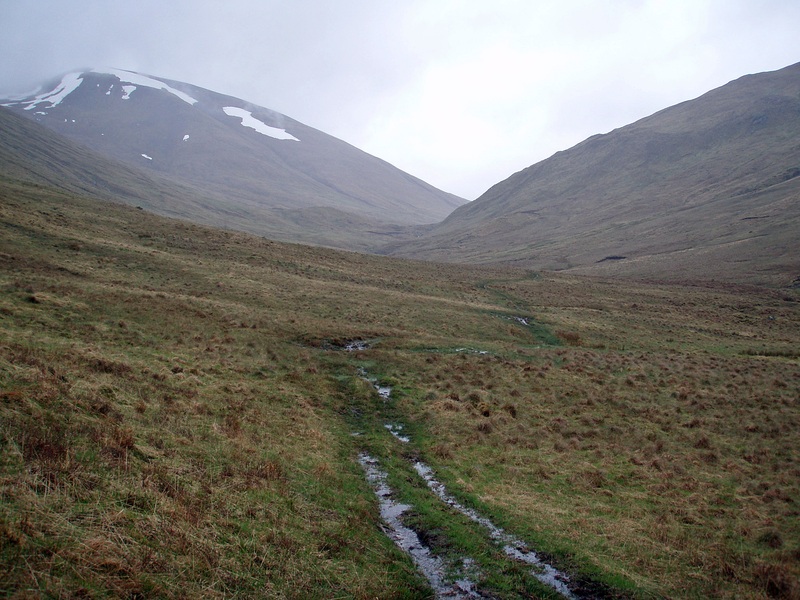 With the help of ViewRanger I found the path again and stayed on it until Skuiley where I left it as it descends towards Glen Lee. 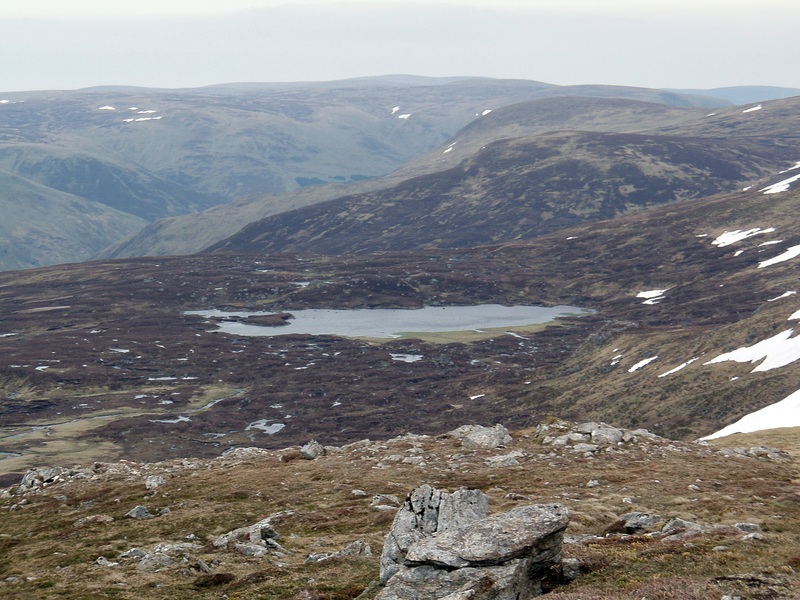 I kept walking along the ridge towards Cairn Caidloch which was very pleasant in spite of the peat hags and large areas of heather. Most of the time I could follow deer tracks or faint paths and most of the ground was quite dry, even the bogholes looked somewhat attractive and could easily be bypassed. 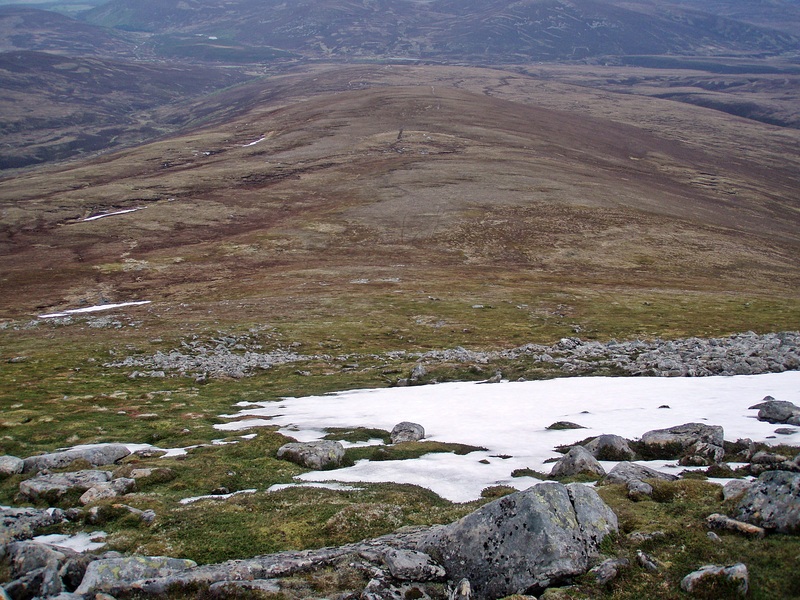 A landrover track leads to Cairn Caidloch and all the way down to the road near Gleneffock Farm. 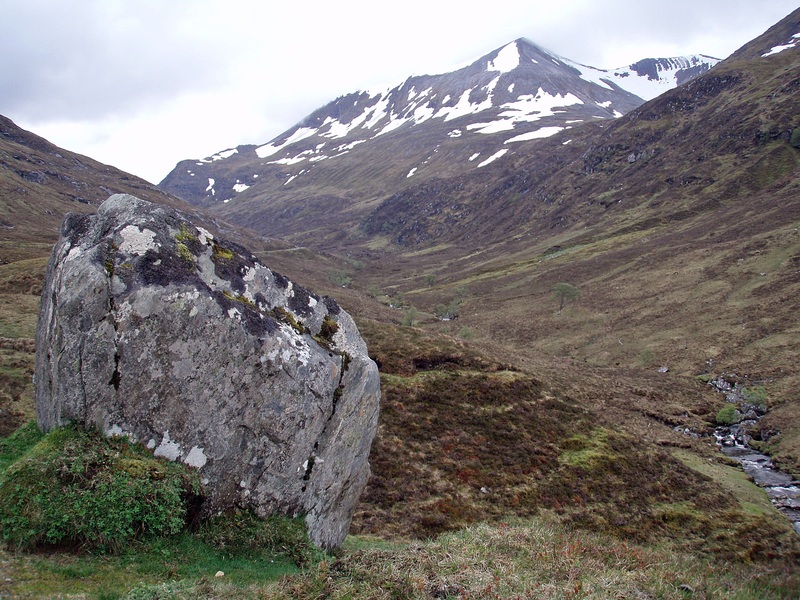 Shortly after Cairn Caidloch I caught up with Dutchman Charles whose walking partners Hendrik and David had walked ahead. 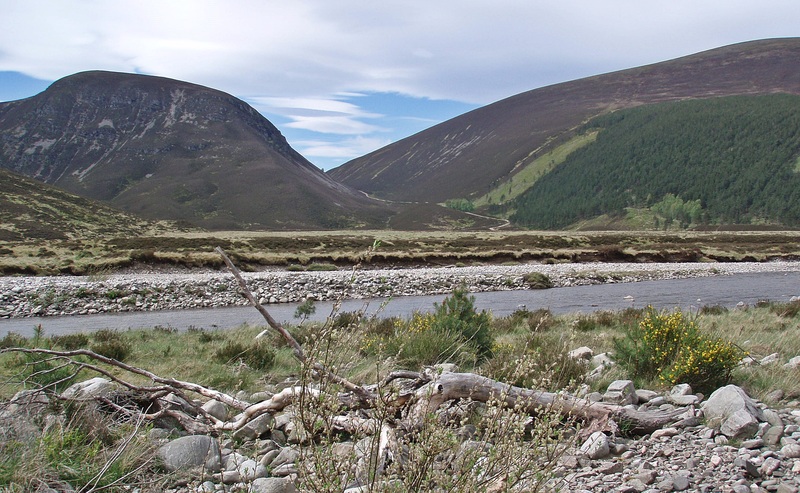 I remembered reading about Charles’ son David who had risen to fame during last year’s Challenge when he managed to catch a disoriented duck flying about in the Fife Arms in Braemar…! The walk to Tarfside passed quickly with interesting conversation and great views. 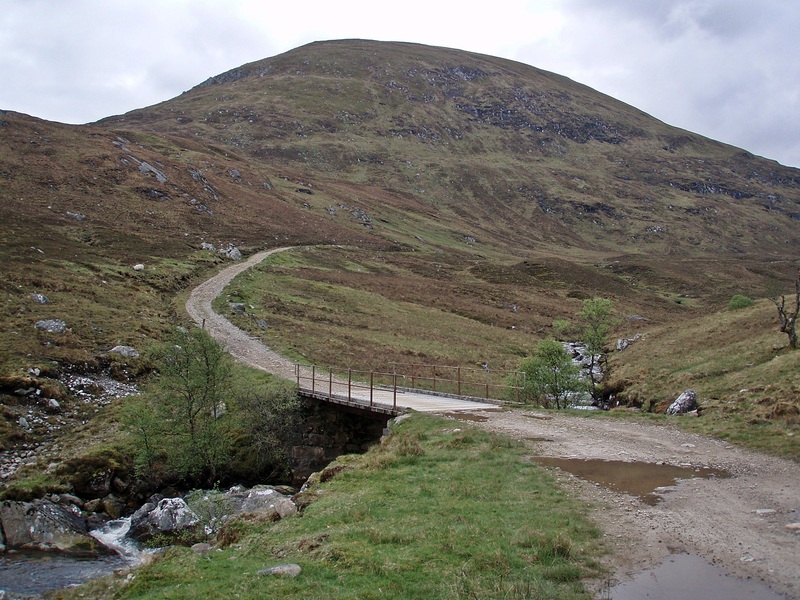 I had walked along Glen Lee before but I much preferred this high-level route. 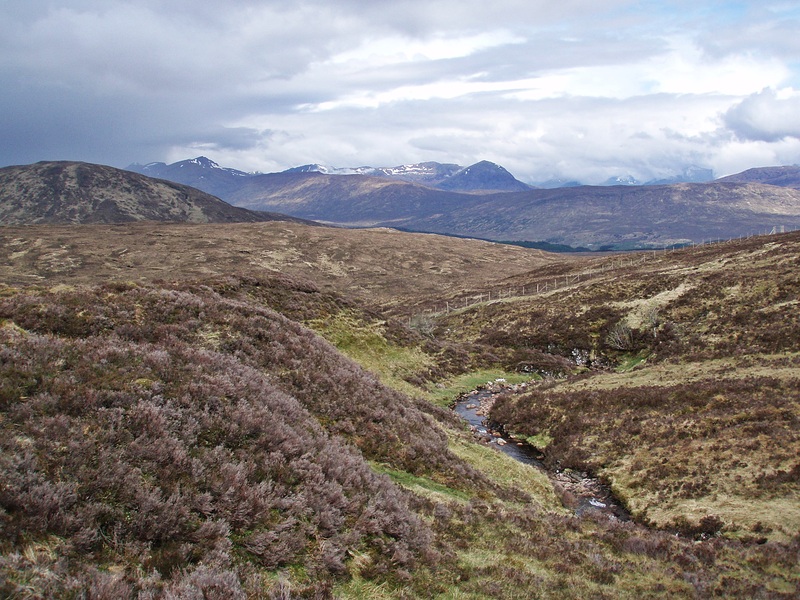 Glen Lee with Invermark Castle on the right. Glen Lee with Craig Maskeldie and Hunt Hill. 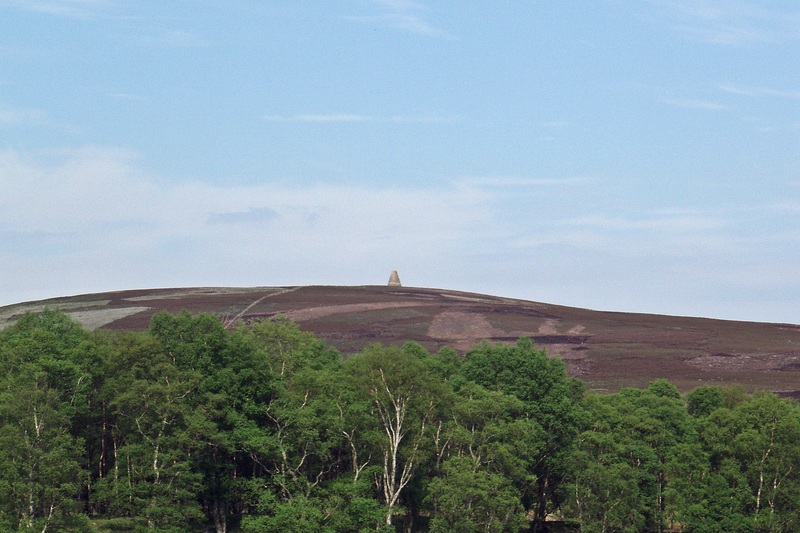 The Hill of Rowan with the Maule Monument. 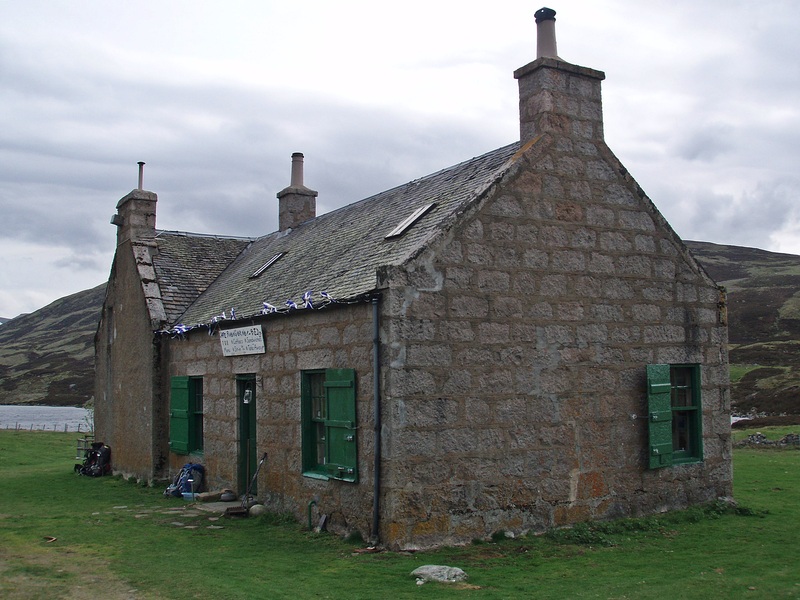 When we arrived in Tarfside I first went to St. Drostan’s Hostel while the Dutch trio headed to the campsite. At the hostel I met lots of Challengers, but just like last year I was too late for tea or cake as the preparations for dinner were already under way. As usual John D. wrote down my name and TGO number to save me making my fourth and last phone call to Challenge Control, but I thought I needed to call anyway to let them know about my route change. 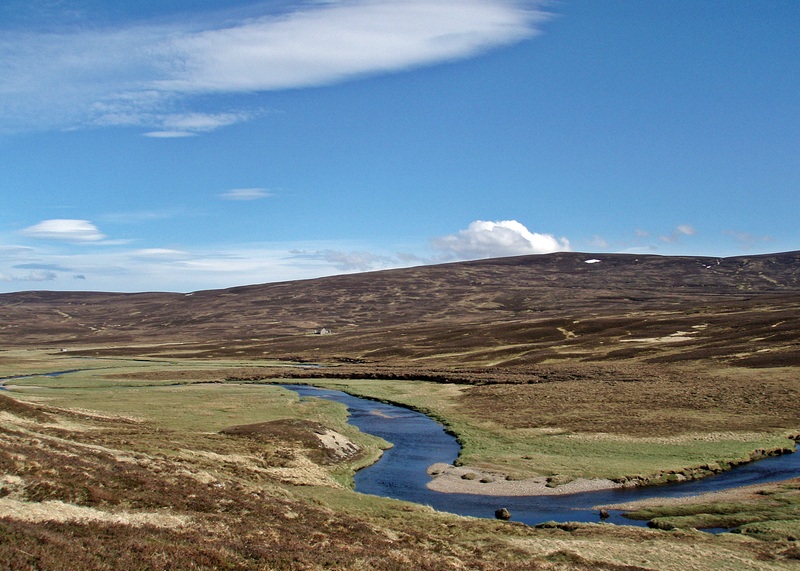 My original plan would have meant a very long day tomorrow with 35 km, walking to Brownmuir Campsite via Charr Bothy and Clatterin’ Brig, with a finish in Catterline the next day, but because of my ongoing knee problems I had decided to shorten the last two days and finish in St. Cyrus instead. John took notes about my new route and assured me that he would also give this information to Challenge Control. 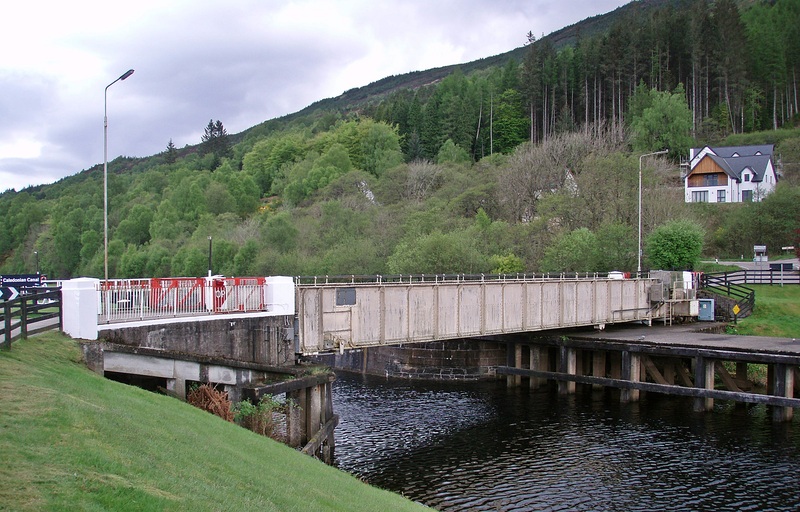 I also got a chance to meet my route vetters Ann and Alvar for the first time in person, though I had spoken to Alvar on the phone during my first phone-in from Spean Bridge. All sorted, I walked to the campsite on the village green, put up my tent and had dinner. Then it was time for the Mason’s Arms where a huge crowd of Challengers had gathered already. It was a nice warm evening and I enjoyed sitting outside the pub with Peter and Jayme, Laura and Louise, Colin and others until about 23:00. The last two days of the Challenge are a bit of a blur because for some reason I had stopped keeping a diary. I remember leaving Tarfside quite late and most of the others had long gone, but my tent neighbours Heather and Stephen as well as Stefan were still around. 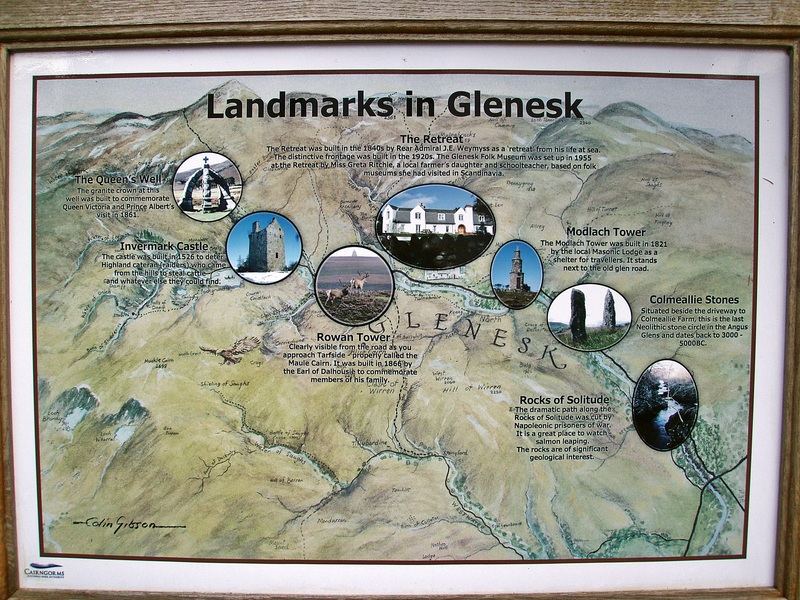 Stefan and I walked a short distance down the road to visit The Glenesk Retreat and Folk Museum for breakfast. Information board at The Retreat. I joined Laura and Louise at their table but they left shortly afterwards, while I had a leisurely “breakfast” consisting of cakes and muffins, and then used the free WiFi to check the weather forecast and my emails. 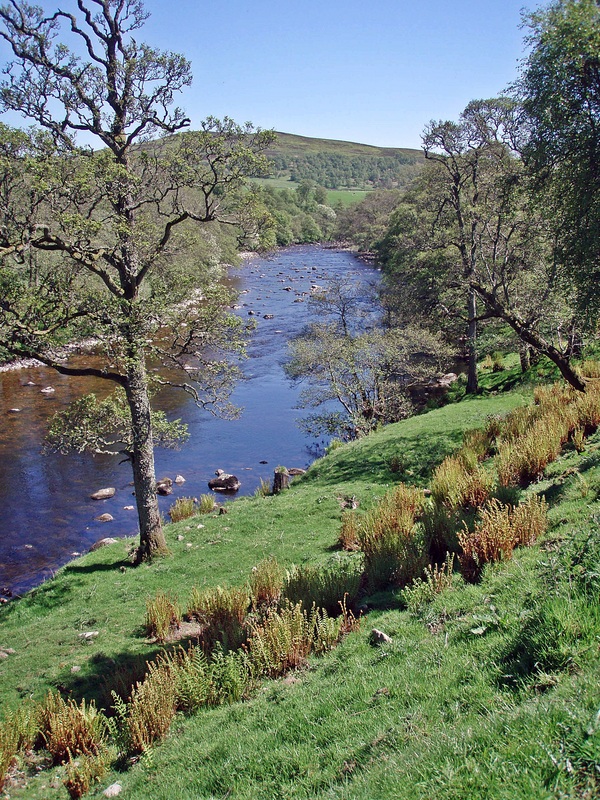 Then I followed the road for around three kilometres and crossed the bridge over the River North Esk. 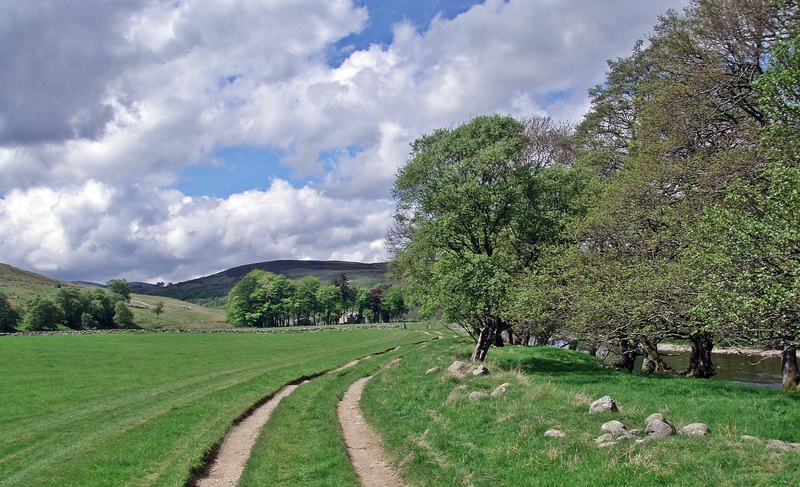 After leaving the road the walk along Glen Esk was an absolute pleasure, the scenery was idyllic and the weather warm and sunny. 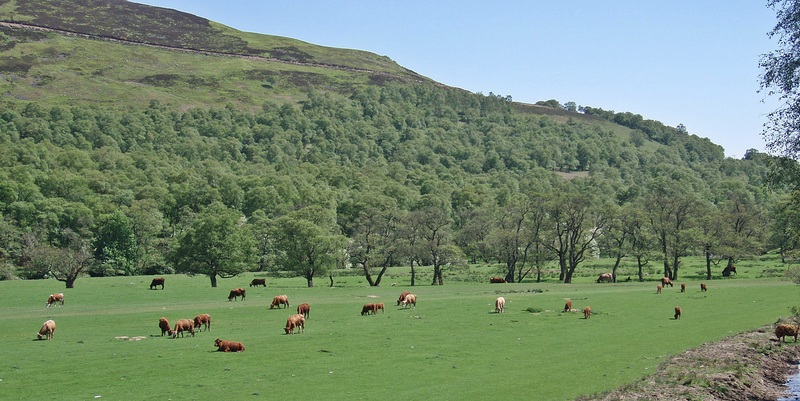 The only problem I encountered was a herd of cattle that I avoided by using a forestry track high above as a bypass. I caught up and chatted with various groups of Challengers on the way, first with Liz and Sue and later with Laura and Louise, besides others. 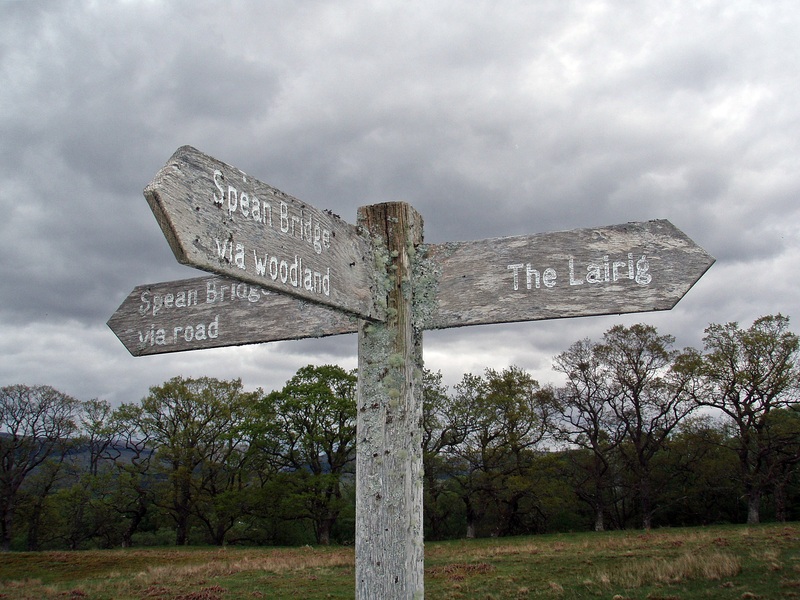 Louise gave me a very useful tip about a shortcut avoiding a stretch of roadwalking shortly after Dalbog. 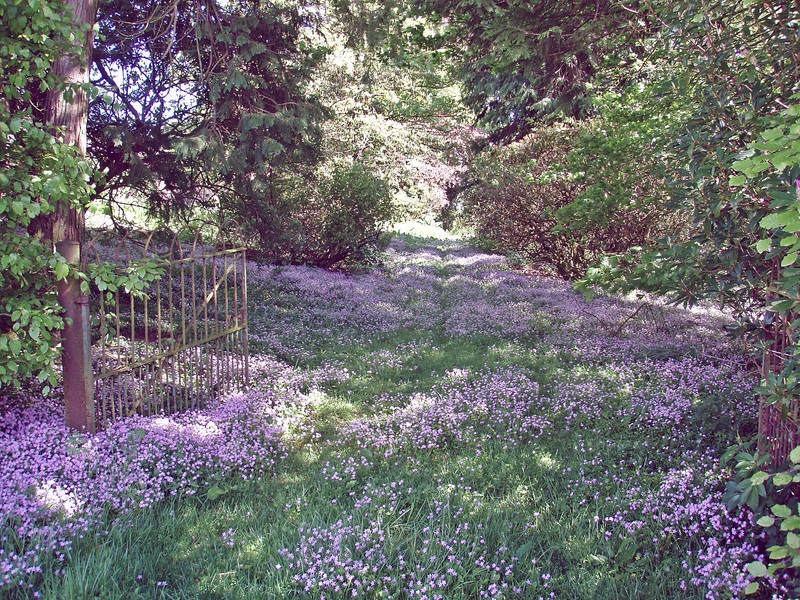 Carpet of flowers beside the road. 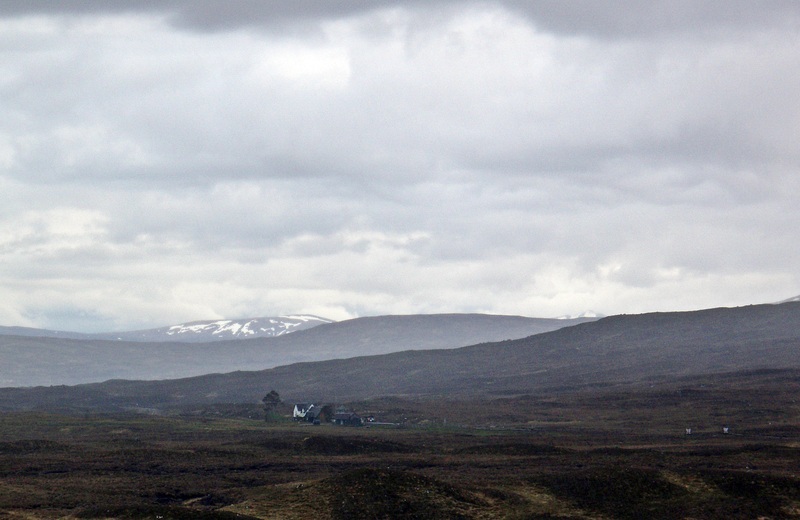 As usual I felt a bit sorry that I had to leave the hills behind. From now on it was only flat farmland ahead. In Edzell I headed straight to the Tuck Inn which was packed with Challengers but I managed to find a seat near the window. I had a prawn salad followed by one of their legendary huge ice cream sundaes, something I had been wanting to try in 2011 but couldn’t at the time because of an upset stomach. After buying some crisps and a few cans of cider at the off-licence down the road I walked back and crossed the footbridge near the post office. Then followed the dull walk on the long straight road to the campsite at North Water Bridge. 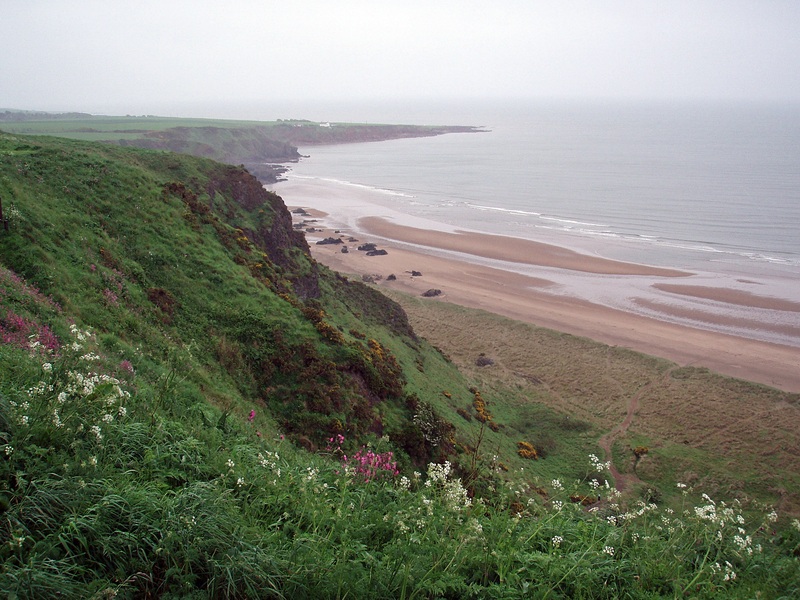 I vaguely remembered the route to St. Cyrus because it had been my planned finish point in 2011 but it was not on the maps that I had printed out, and although I have got ViewRanger on my phone the screen is too small to get a good overview of a larger area. Margaret kindly lent me her map and I took notes of the names of the villages/farms I would pass on the way to the coast. After dinner I sat at one of the picnic tables, chatting with Lindy, Colin and another Challenger until it was getting too chilly and it was time for bed. As usual I was one of the last people to leave the campsite. 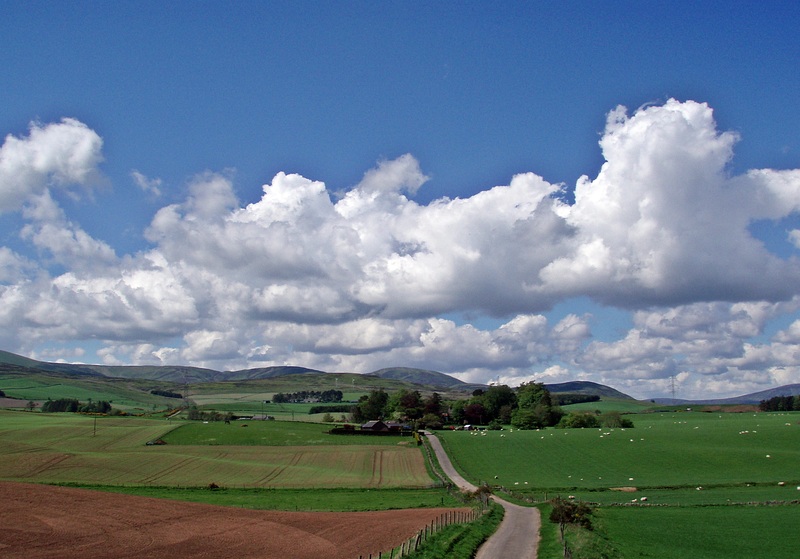 I crossed the A90 and followed quiet lanes to Marykirk, then turned E towards Morphie. 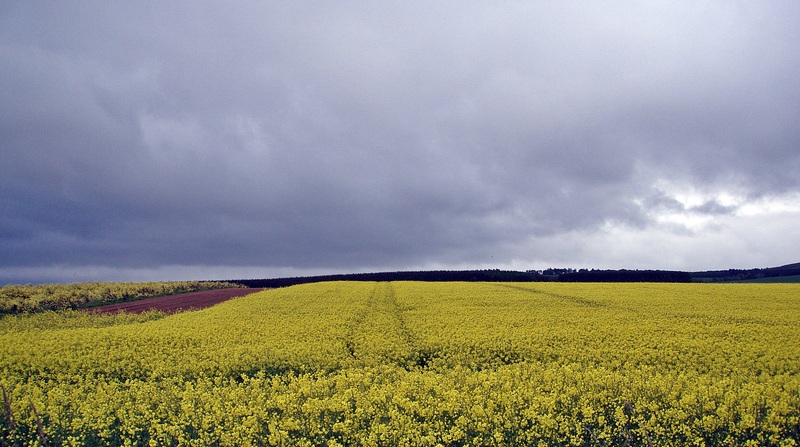 The day had already started dull and grey, but now it started raining heavily and over the Hill of Morphie I struggled against a cold headwind. In St. Cyrus I took shelter in the public toilet to get out of the rain for ten minutes, but it didn’t look as if the rain would stop anytime soon. Reluctantly I stepped out into the rain and across the road to the bus stop to check the timetable for buses to Montrose. Then it was only a few minutes walk to my destination. I had seen so many photos of this beach and read so many Challenge reports about it but I was still overwhelmed by its scale and beauty. 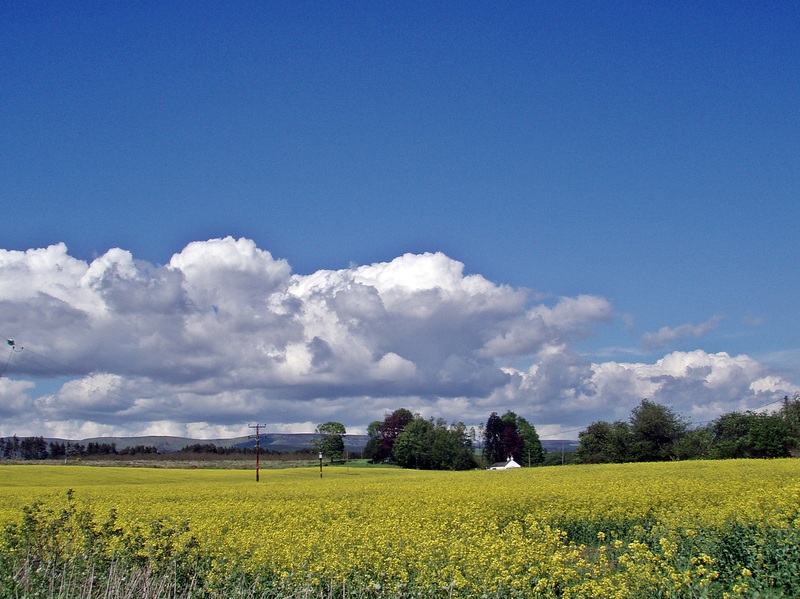 Such a shame about the weather – how great must it have been for those who finished the day before in bright sunshine! 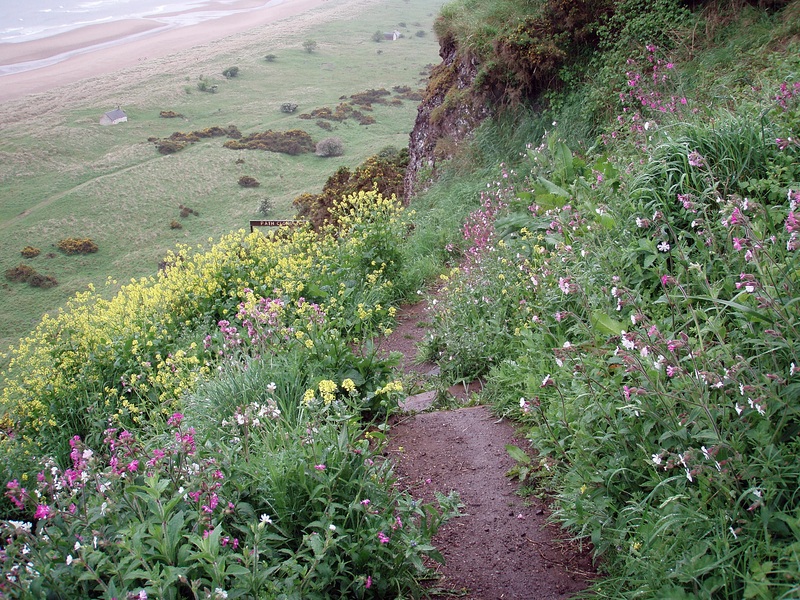 Carefully I made my way down the steep cliff path. Apparently a few others had been here before! On my way back I met another Challenger, and after congratulating each other on our completions he walked down to the water’s edge while I continued up the path. I had walked past The Old Bakery Coffee Shop on my way to the beach but by now I was feeling quite hungry and fancied something substantial, like a proper bar meal. Walking along the main street I spotted a pub across the road and expected to find lots of Challengers inside (it was a pub after all!). 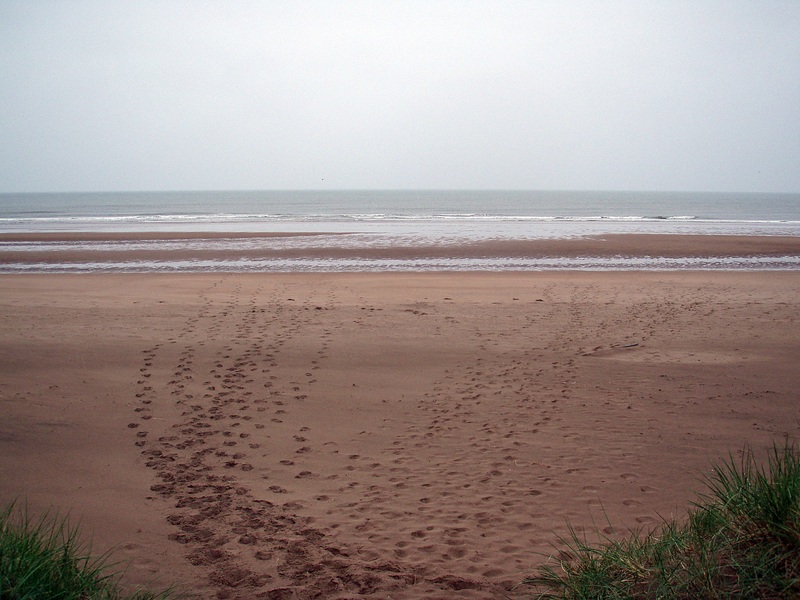 But apart from an elderly couple the place was deserted, and after my lonely Challenge completion on the beach I would have liked some company to celebrate with. So I returned to the Old Bakery, and found that everyone else had gathered there already! There were wet rucksacks and even wetter Challengers everywhere, but the place was dry and warm and the food was delicious, especially the cakes. It was a constant coming and going, and I ended up sitting with Heather and Stephen and discussing how to get to Montrose. After looking at the bus times we decided to call a taxi and share the fare between us. At the Park Hotel I signed out at Challenge Control, got my T-shirt and buff and chatted with new arrivals over tea and biscuits. Then it was just a five minute walk to the Chapel House B & B. I had a bath, washed my hair, put my Challenge T-shirt on and walked back to the hotel for the celebrations. After a drink or two at the bar we all went over to the ballroom for the dinner and the speeches and tributes. I was sitting at a table with Robin, Ian and the French couple Elise and Frederic, and enjoyed the evening although I was sorry that it was all over again, at least for another year. I really enjoyed that. Can I ask a favour? 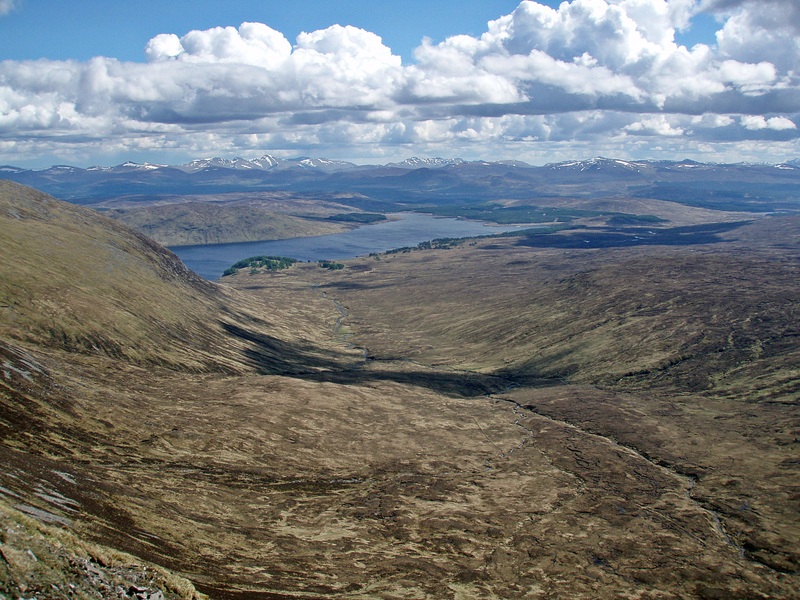 You have a wonderful photo from the top of Ben Alder looking down to where they are planning Talladh-a-Bheithe wind farm. 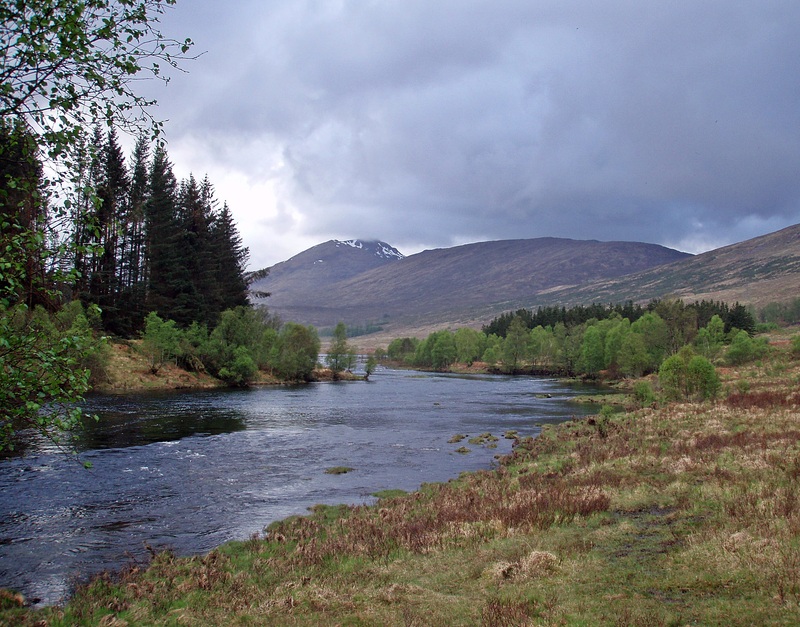 The organisers of the locals’ protest group “Keep Rannoch Wild” are looking for just this sort of picture. Indeed they have a competition with a prize of £500 for the best picture, so they can use them at the inevitable inquiry. Thank you (in advance!) for helping! Thanks for your comment and the links – I will go through my photos and see if I’ve got anything suitable, I might have some non-Challenge ones that show the area even better. 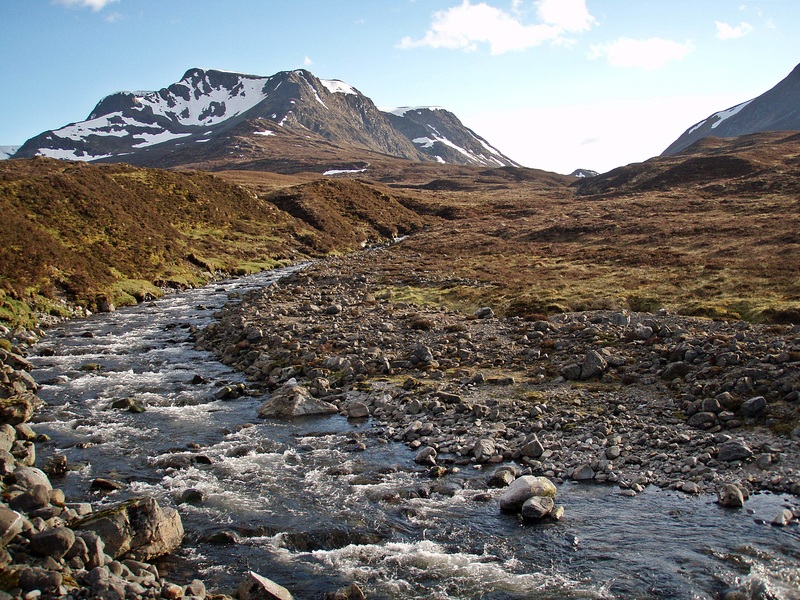 “Keep Rannoch Wild” needs any support it can get! Enjoyed your trip report (as always). I have you to thank for the first part of my Challenge route as I shamelessly lifted it from your 2012 route 😊. It’s a pity we didn’t get more time to chat at the dinner. I’ll probably steal parts of some of your other routes 😘. Thanks and I’m glad you enjoyed the first part of your route. Regarding your next one – feel free to “help yourself” 😉 It’s nice to inspire others, and I also take inspiration from blogs and trip reports when I plan my routes. So, next year then, fingers crossed. Yes somehow I seemed to meet you and Laura a lot on my route which was surprising because I didn’t specifically seek out the tea rooms en route! Great report! Really enjoyed it. And you did so well pressing on with those various ailments. Brought back memories and also a few places that may be on my next Challenge. Roll on 2015, when I have a bit of an epic planned, weather permitting. How is your knee doing? 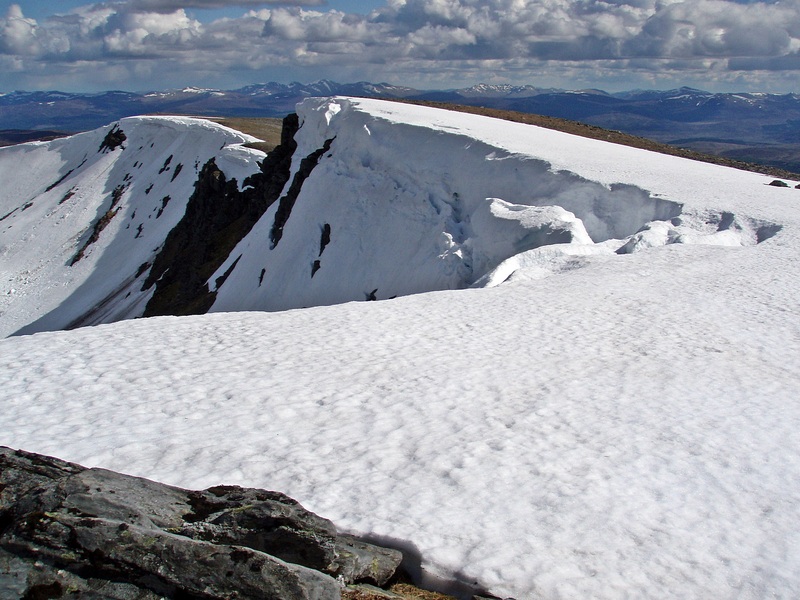 Let’s hope for another good weather Challenge in 2015 (and a place on it, of course)! After all, you also kept going in spite of the problems with your feet – well done and good luck for 2015! That was a great account of your trip,brilliant photos. Hi, I’ve really enjoyed reading your blogs, very inspirational. 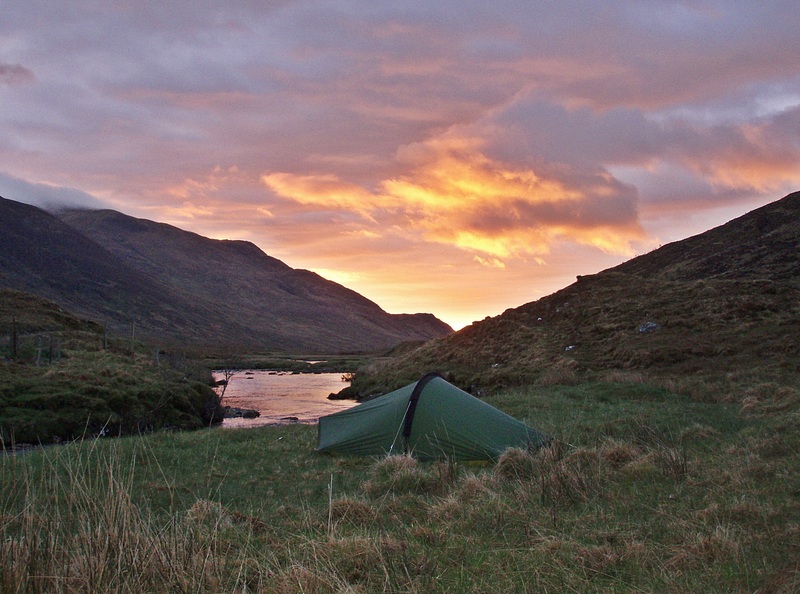 Some of the locations you have wild camped in are stunning, I wish it was as easy to do in England.